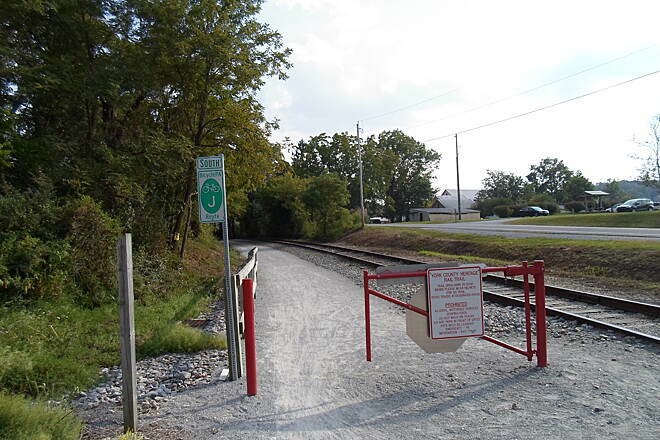 Note: Per the York County website, "A section of the Heritage Rail Trail County Park will be closed starting March 21, 2016. 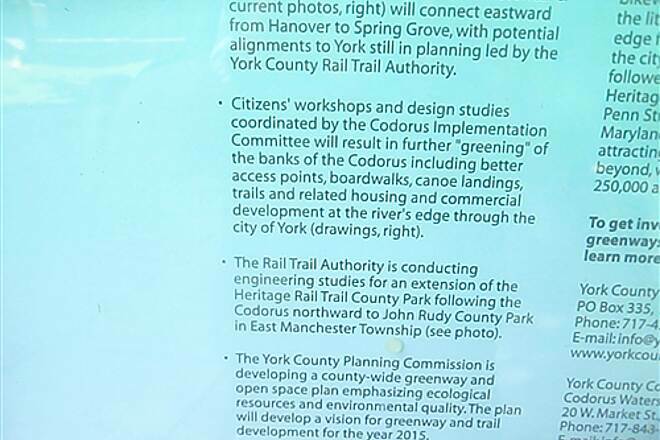 The closure will begin at the Colonial Courthouse in York, south to Grantley Rd. It will be closed until further notice." Please check the York County website for updates. 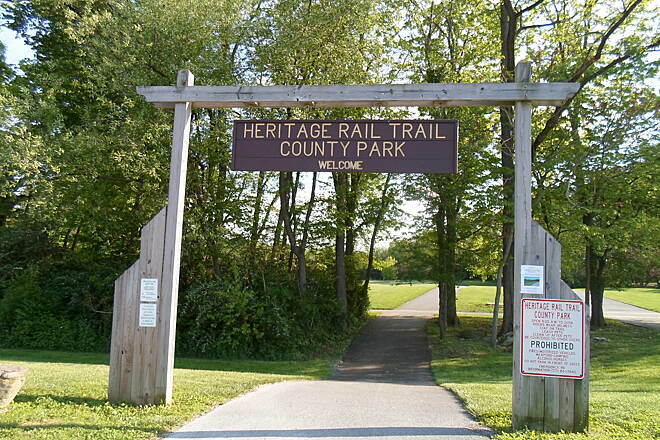 The Heritage Rail Trail County Park winds for 25 miles through urban and rural landscapes between the city of York and the Maryland state line. 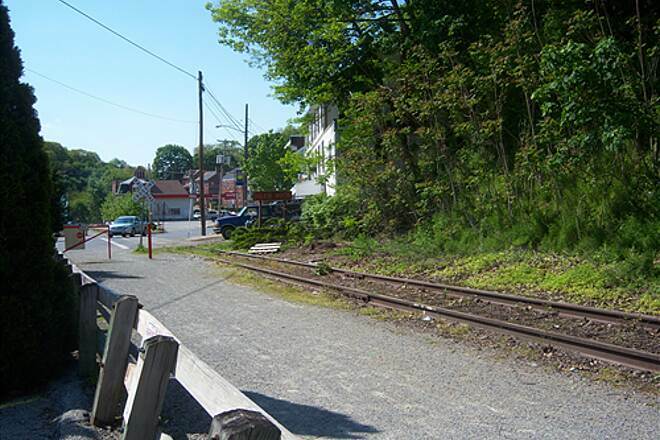 It connects Maryland's Torrey C. Brown Rail Trail with the historic district of York, PA. 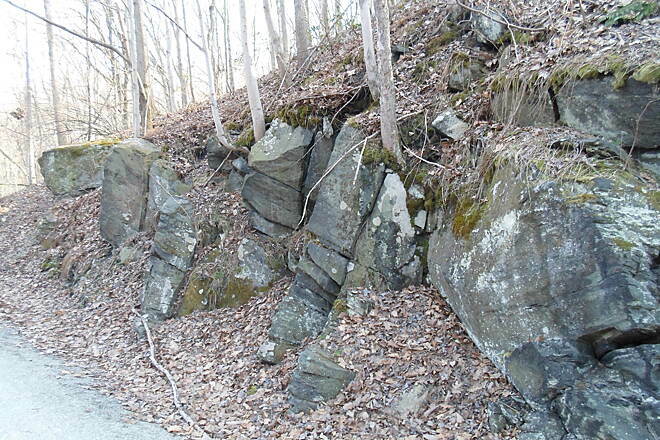 The trail has blue stone dust on top of a crusted stone base and is well-suited for hybrid bikes. 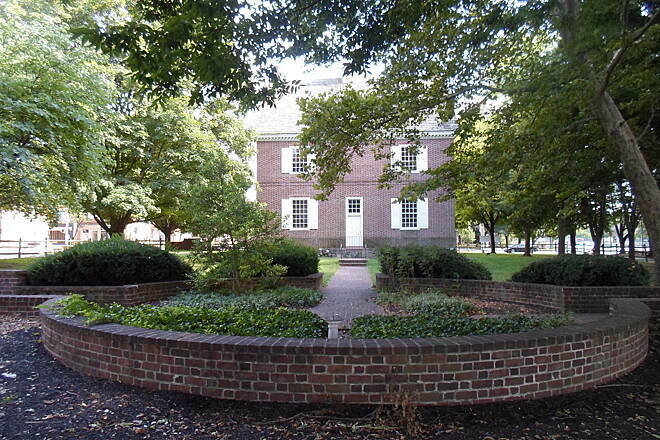 The trail starts in York behind a replication of the town's colonial courthouse. 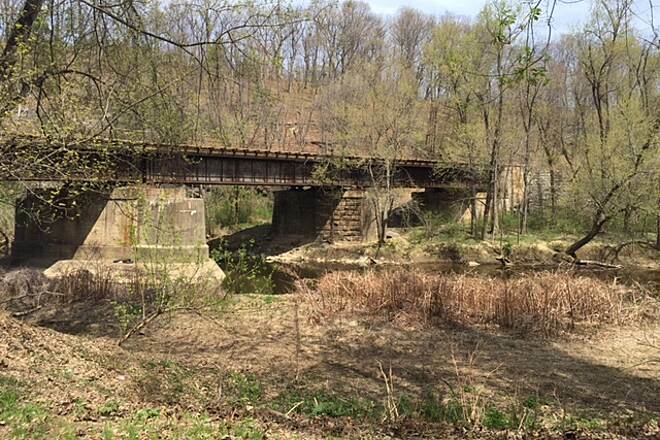 Heading south, the trail passes through an urban landscape along the banks of Codorus Creek. 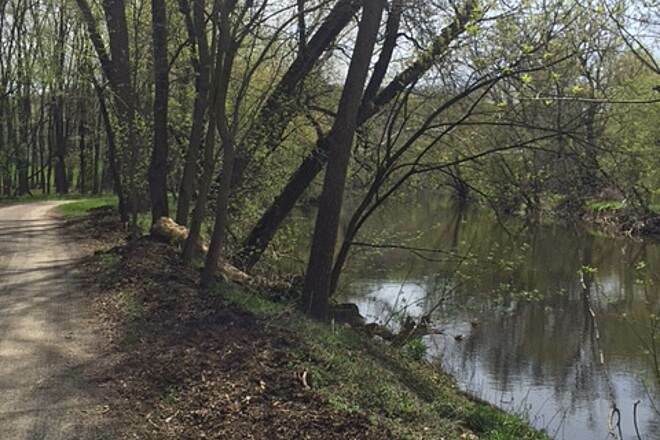 After a little more than 1 mile, the trail leaves the city and enters the countryside, where the trail is flanked by fields and forests. 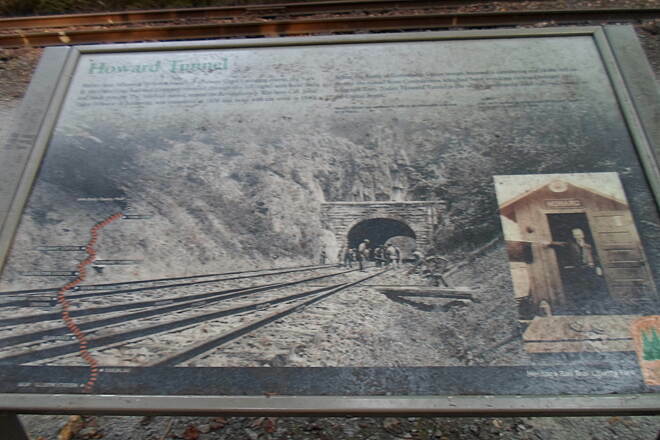 About 1.5 miles south of the Brillhart Station trailhead is the 370-foot-long Howard Tunnel. 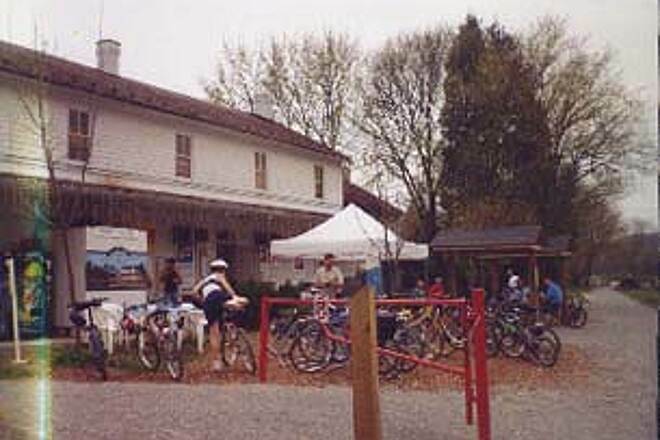 At milepost 11, the borough of Seven Valleys provides an opportunity for refreshments at the cafe, tavern or wine shop. 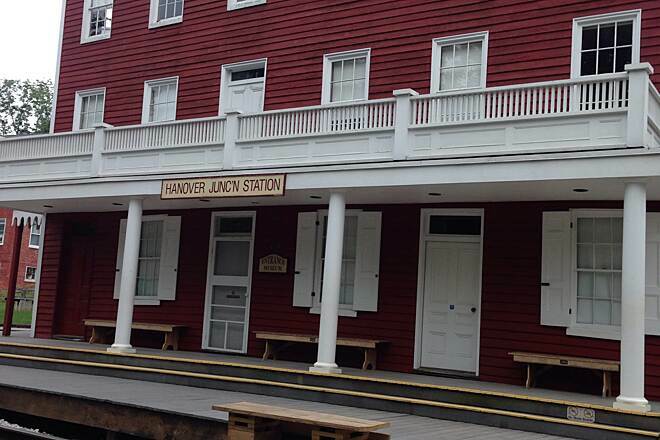 About 0.5 mile farther south is the restored Hanover Junction train station. The station has been restored to appear as it did in 1863. 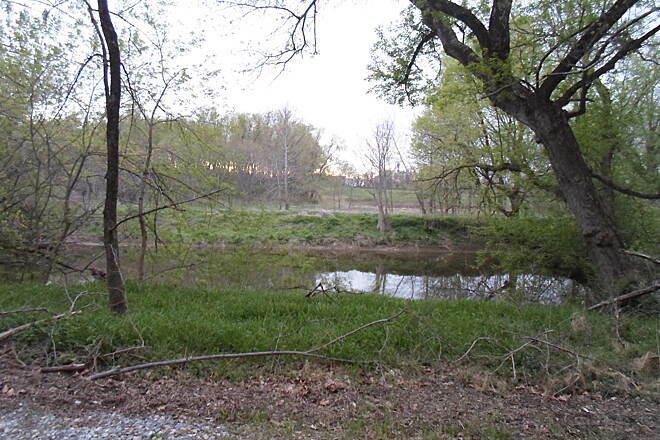 The next 4 miles of the trail run through farmlands and along the banks of Codorus Creek. 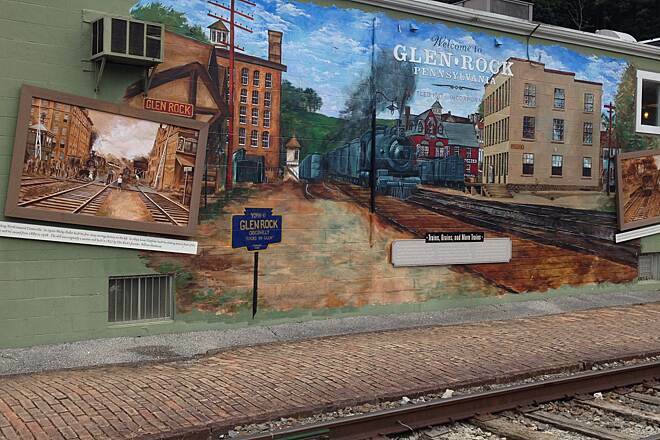 The Heritage Rail Trail passes through Glen Rock, Railroad and New Freedom over the next 9 miles, each town providing opportunities to explore the area's rich history. 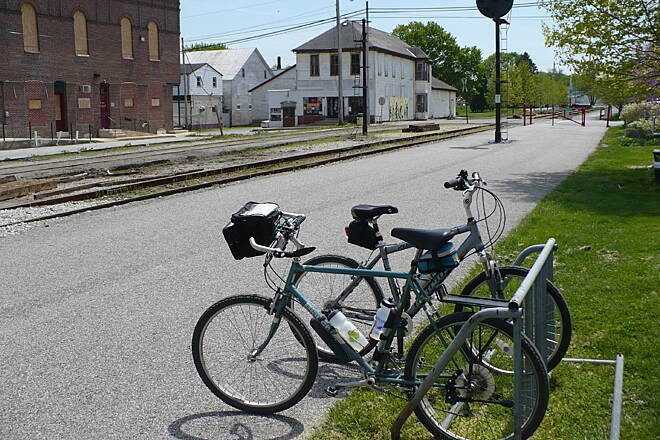 From New Freedom's restored railroad station, it is just 1.5 miles to the Mason-Dixon Line and the connection to Maryland's 19.5-mile Torrey C. Brown Rail Trail, which was formerly known as the Northern Central Railroad Trail. 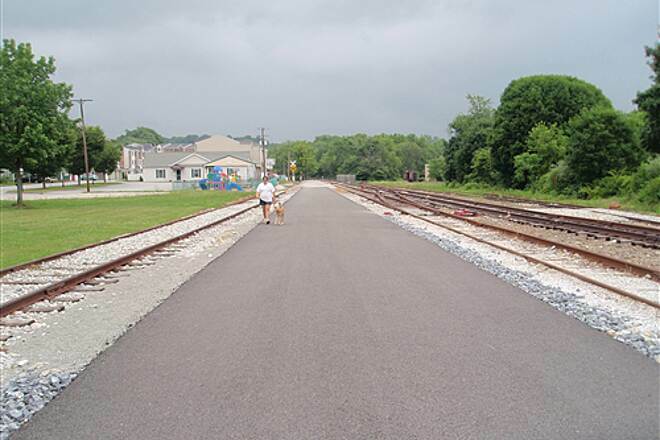 A northern extension of the Heritage Rail Trail County Park has been opening in phases since 2007. 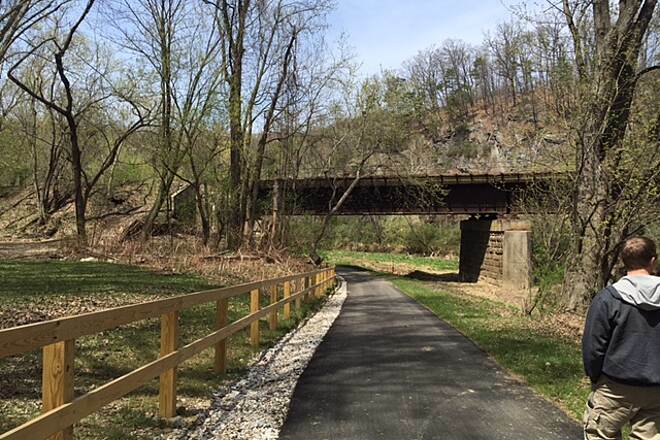 Currently, 4.5 miles of greenway not yet connected to the original rail-trail are open between John C. Rudy County Park and the intersection of Route 30 and Loucks Mills Road in Springettsbury Township, just north of York. 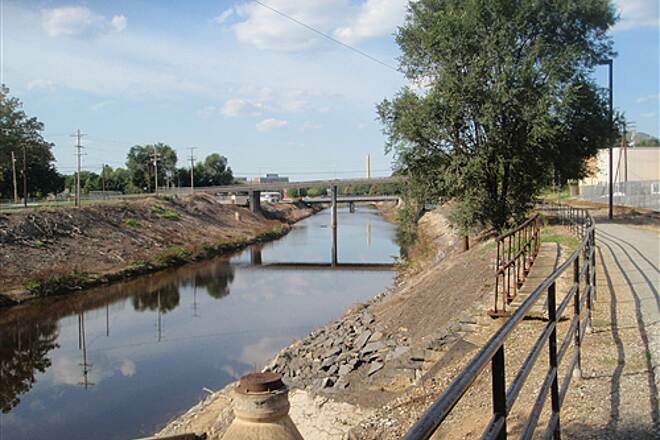 The final 2 miles of trail needed to close the gap are expected to be completed in 2017. 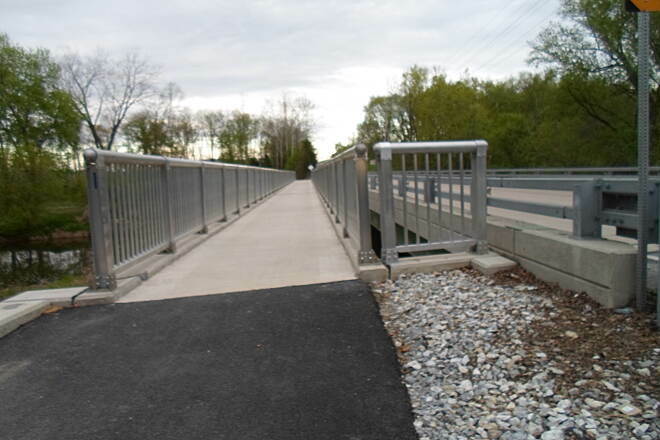 This will allow trail users to travel uninterrupted from New Freedom, through York, to John C. Rudy County Park. 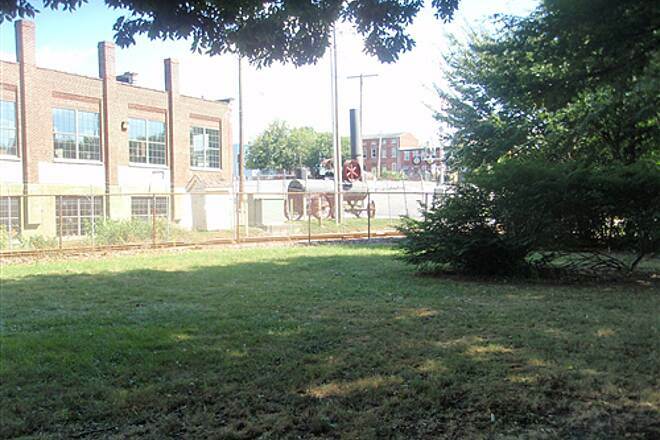 In June 2013, Steam Into History began running its train adjacent to the trail. 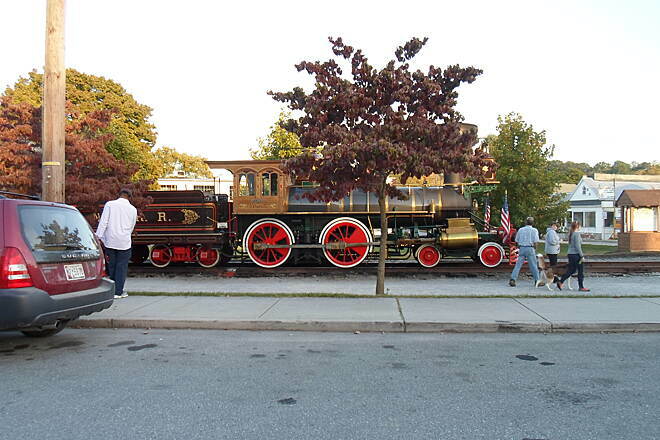 The steam locomotive is a Civil War-era replica built from scratch. 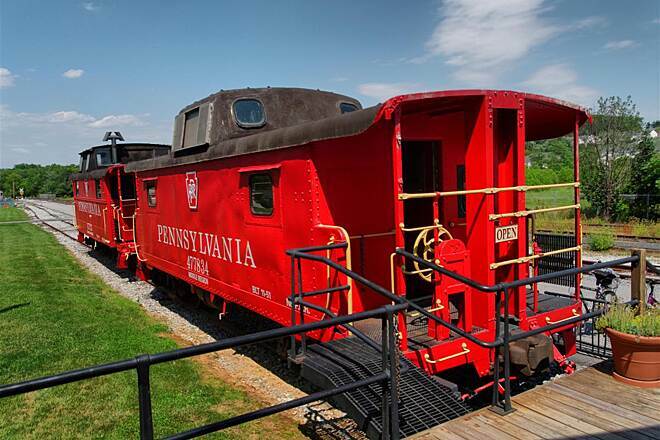 Tourists experience history come alive as they ride the train through Pennsylvania’s lush York County countryside. 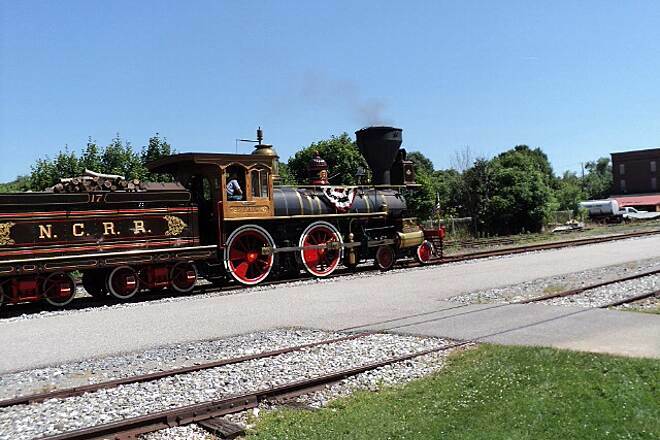 Each round-trip journey between New Freedom and Hanover Junction is different; riders may encounter narrators sharing the history of the area, reenactors in period costume (look for Old Abe on special occasions) or musicians playing 19th-century tunes. 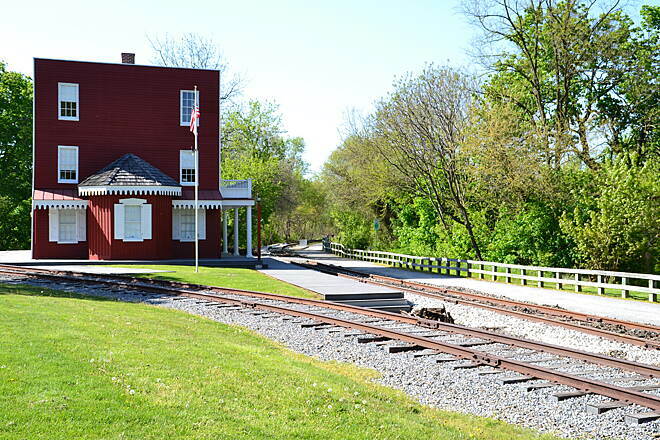 A stop at Hanover Junction allows time to explore the museum inside the refurbished train station, the very place where President Lincoln changed trains on his trip to give his famed “Gettysburg Address” in 1863. 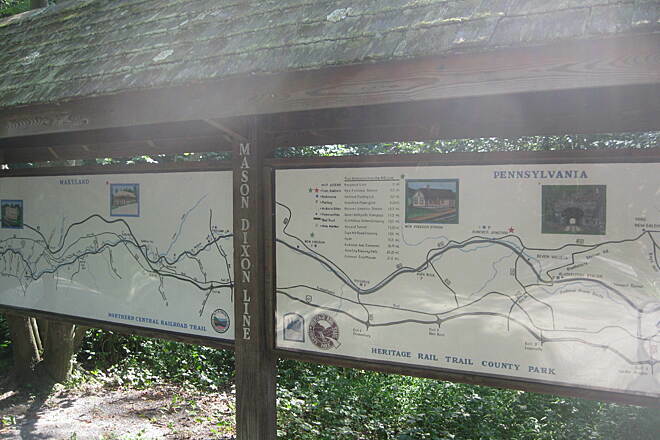 To reach the York trailhead from Interstate 83, take Exit 22 (North George Street). Follow North George Street south for approximately 3 miles. Turn right to West Philadelphia Street. Go 2 blocks and turn right onto Pershing Avenue. 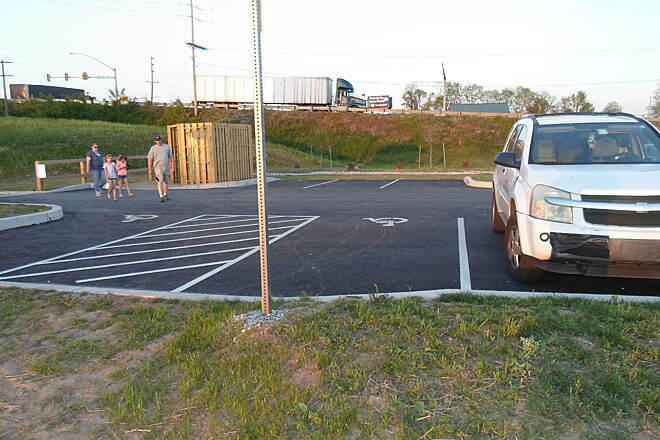 Parking for trail users is on the west side of the street. 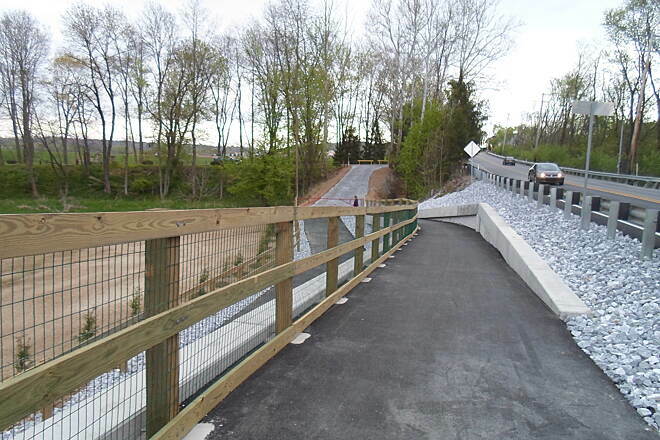 To reach the New Freedom trailhead from Interstate 83, take Exit 4 (Shrewsbury). Go west on State Route 851. Turn left onto Main Street. 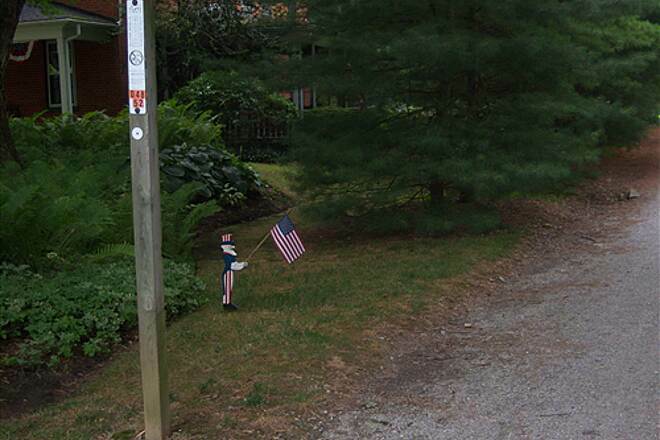 At the next traffic light, Constitution Avenue, turn right. Turn right onto Franklin Street. Turn right onto Front Street. 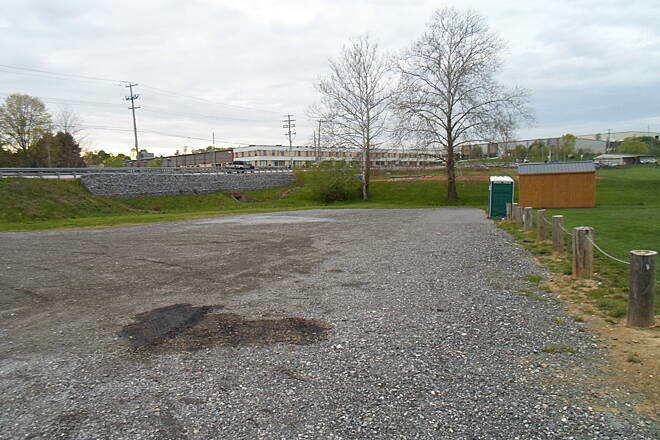 Parking is on the north side of the train station. 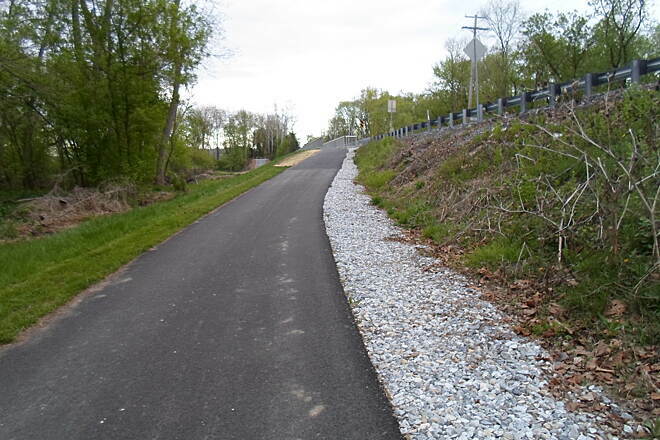 I was hesitant to ride on crushed stone, as I never had before, and prefer asphalt. 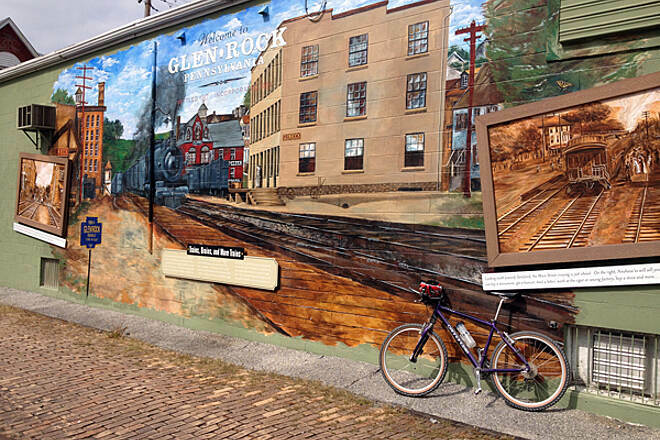 Today, I rode between York and just past Glen Rock. What a great trail! The inclines are easy. The crossings are few. 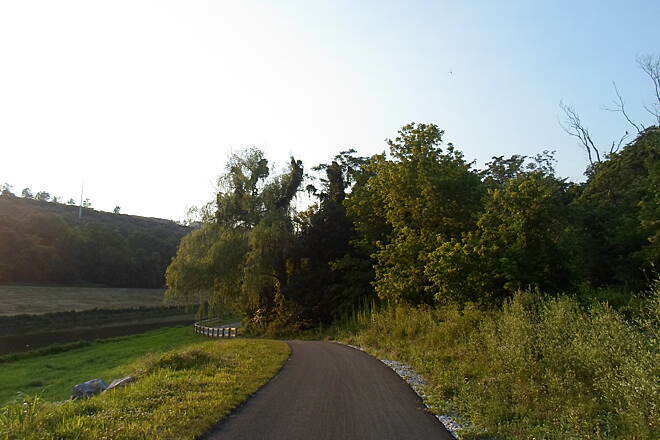 The trail is very well maintained. I highly recommend this trail to anyone. 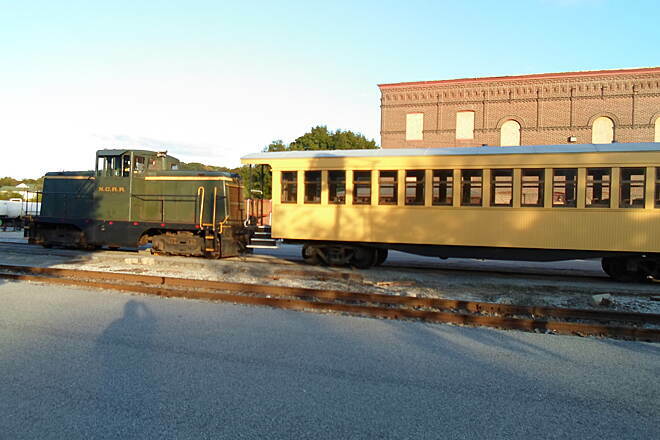 We have ridden the Heritage and Torrey Brown. 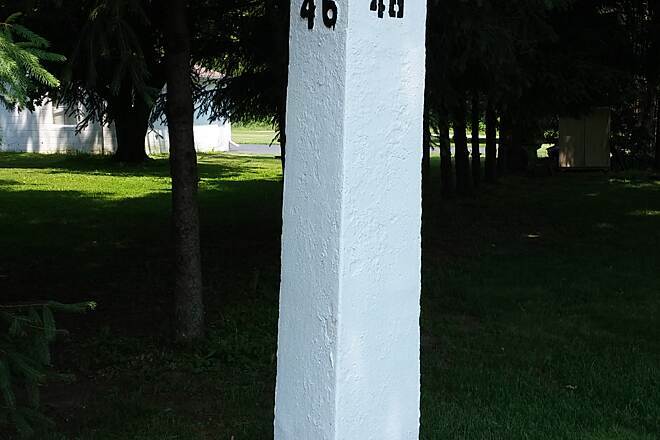 The Heritage is slightly uphill (I didn't notice it but my wife did) from York (Brillhart trail head) to New Freedom and then downhill to the end of the line. The PA side of the trail is great. The MD side not so great. 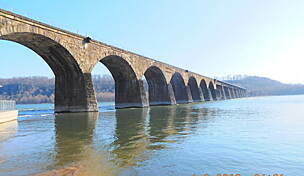 There are numerous small towns on the PA side that offer food, drink and a place to rest. One home placed an ice chest on the trail offering free bottles of water! 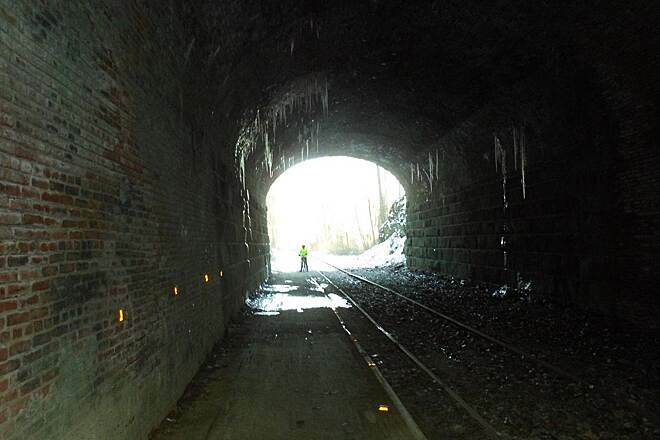 You might want to slow down or take a small flashlight for the Howard tunnel...it's a little rough in there and dark. Brillhart had a toilet facility and there were rest benches all along the route. I loved the old buildings and old train signals. 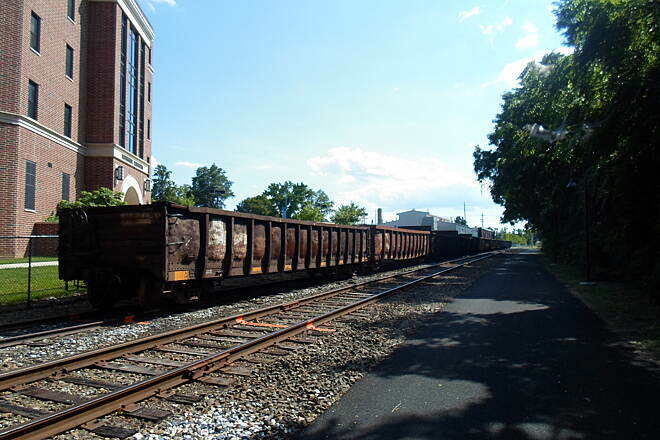 There is a lot of crossing back and forth across the tracks but they are all paved and easy to negotiate. The New Freedom train was operating and we rode faster than the train. 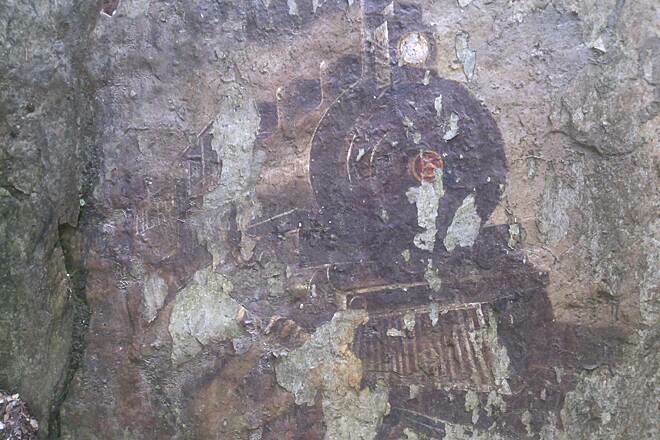 Based on the completely deteriorated condition of the ties, I would not ride the train. It looks like an accident waiting to happen. 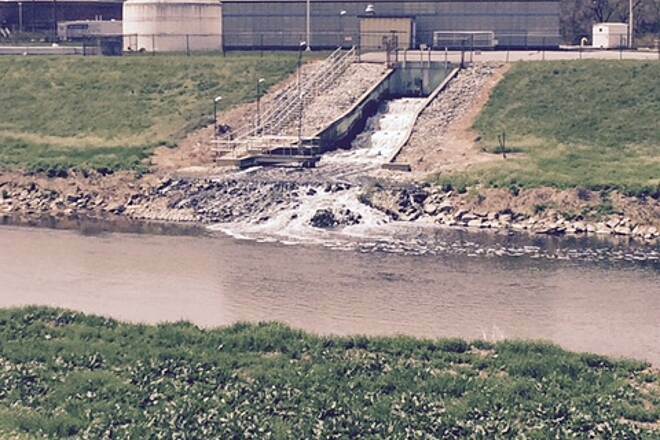 I'm surprised they haven't been shut down for safety reasons. Back to the trail. It is great. 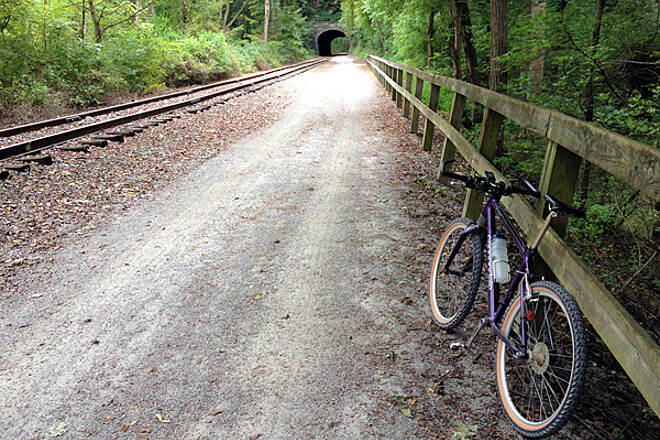 We rode it on an overcast Friday morning and the traffic on the trail was very light. Speaking of traffic, other than in one significant town we never had to stop for vehicular traffic. Go and have a great time. Great way to spend a Monday! 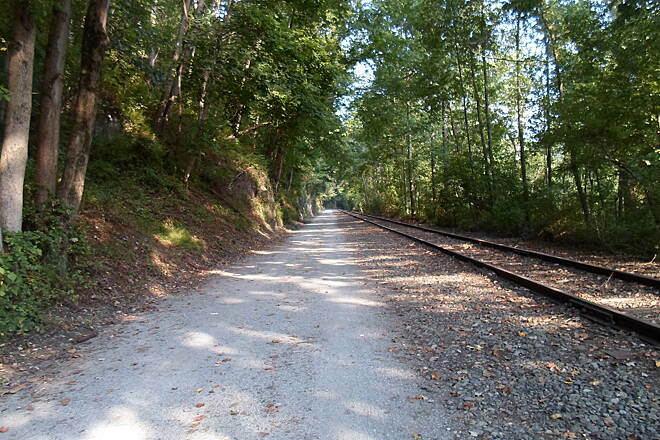 Road a seven mile section of the Heritage Rail Trail (miles 15-8) today and was really impressed. 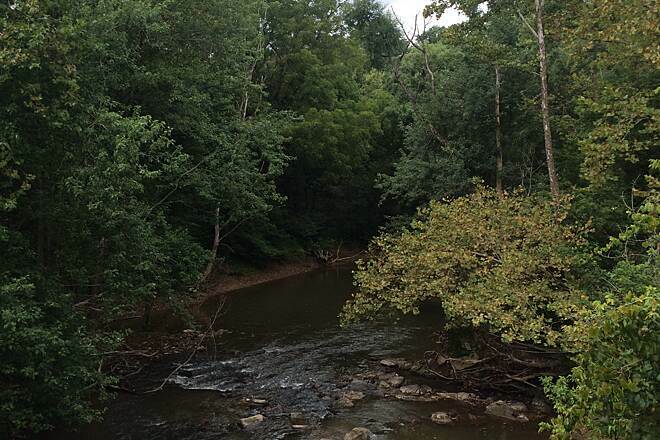 It was my first time on this level and scenic trail. Lots to see and the trees provided great shade throughout the trip. It was a little busy in sections but overall it was an easy ride (ideal for my 10 year old). Definitely recommend this for people with kids who want a trail that is well-kept and thoroughly marked. 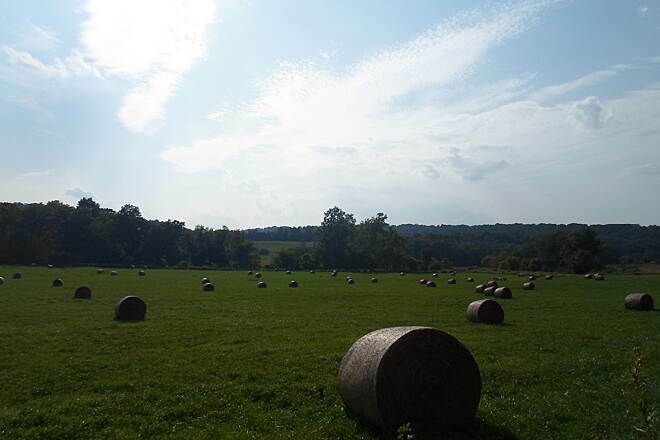 beautiful day with beautiful scenery. Never been here but will definitely be back. Extremely beautiful area. Clean except for those that leave their trash behind. If you like quiet and tranquility it's a must visit. 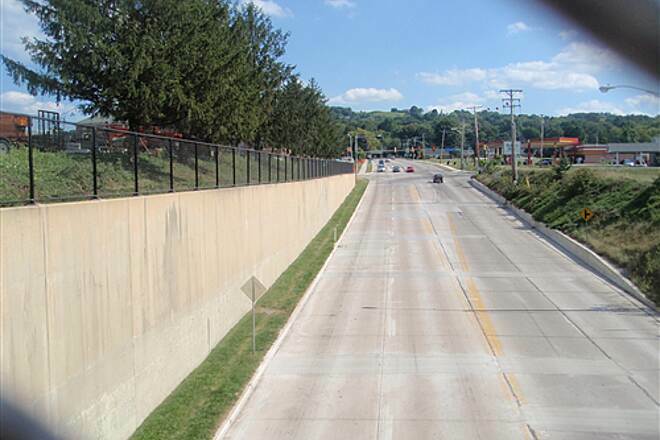 Starting at Brillhart, south is a very nice run, including tunnel. I am sure fall is spectacular time to be on this trail. 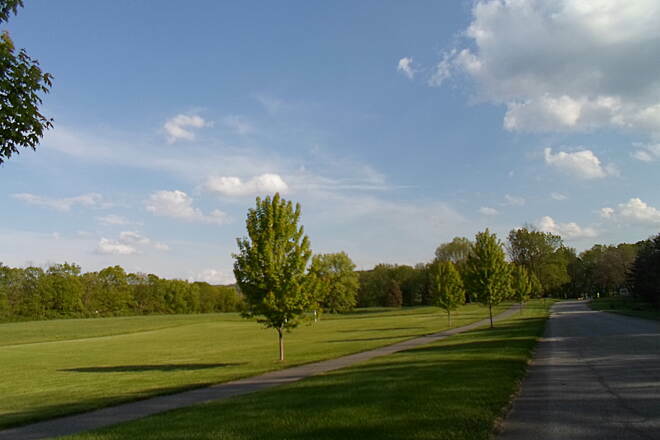 North is likewise a nice run, especially passing the golf course area. After that is the salvage yard, which is an interesting spectacle. 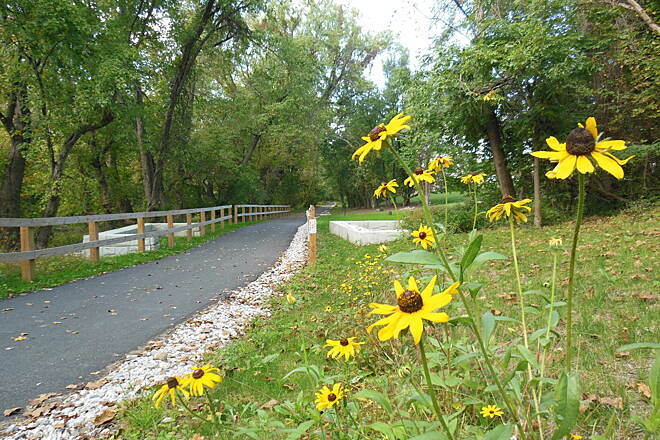 If the chance, definitely walk, run, bike this beautiful trail. 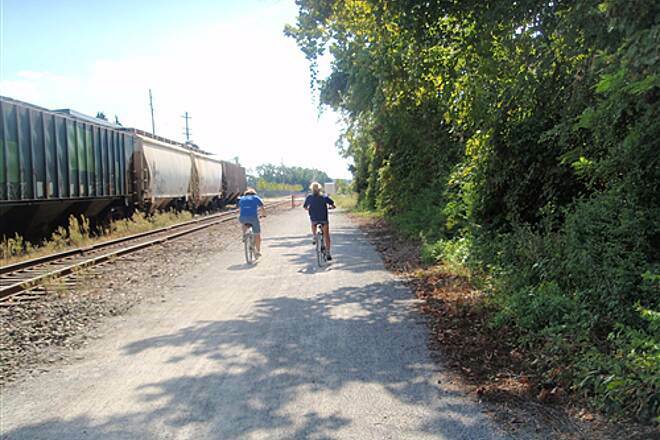 I rode the whole Heritage Rail Trail, about 27 miles end to end, including the northern extension, in late September 2016 and it seems complete now. 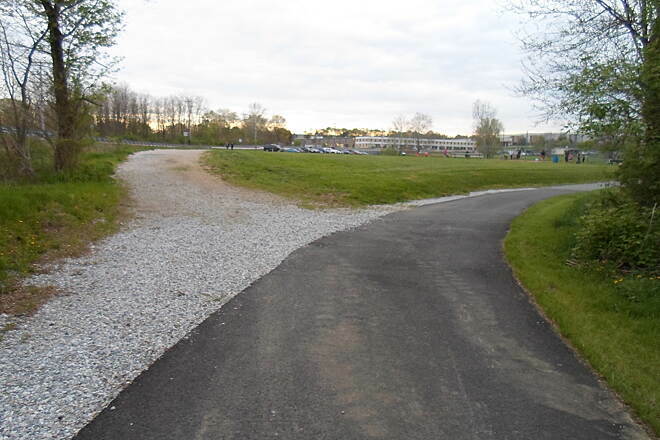 The full trail now starts at a big parking area in John Rudy Park and is paved or crushed stone down to the Route 30/Loucks Mill parking area. 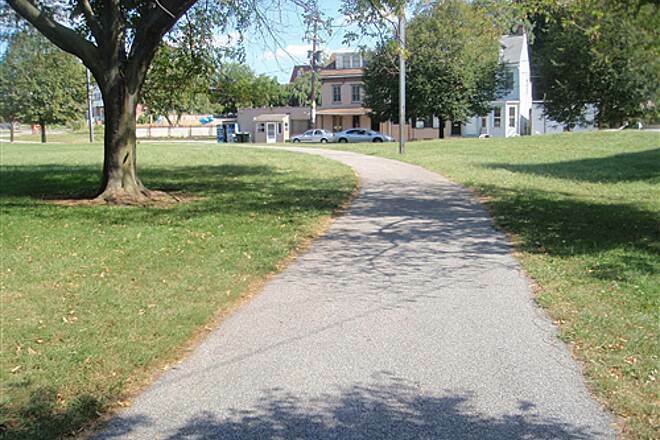 From here you ride south on streets (not a specific trail) until you pick up the newly-paved trail at the Pershing Ave parking area in downtown York. 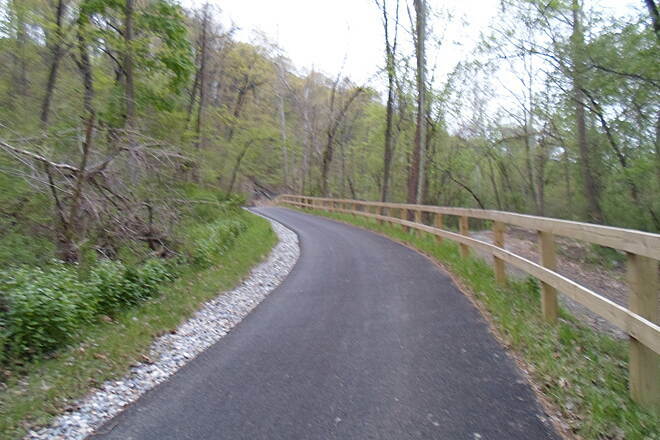 From then on it is trail-only (no shared public roads) until it ends in the woods at the Maryland state line. 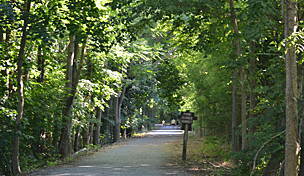 This is busy trail on weekends and holidays - families or friends tend to spread out across the trail walking or biking. Most people will single-up when you approach but others will force you to nearly stop. 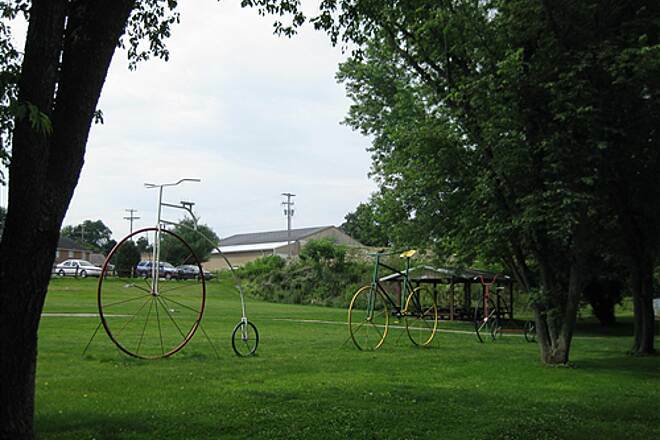 If you want a leisurely ride or walk, I suggest starting south of York at Brillhart Station, Glatfelter's Station, Glen Rock or New Freedom. This area is more rural and relaxing, and parking is well-spaced so you can do segments over time. I use the trail at the least populated times so I can ride fast on a good surface. It's possible to ride or run fast for long stretches if you pick minimal-use times. 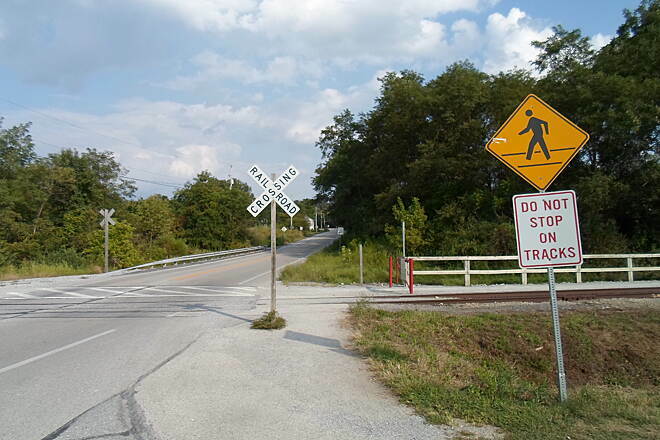 Railroad crossings are easy to navigate and road crossings are well marked. Expect your bike and you to be coated in crushed stone dust if you ride fast but it's great fun. Labor Day, drove 1hr and 40min to ride this trail for the first time. 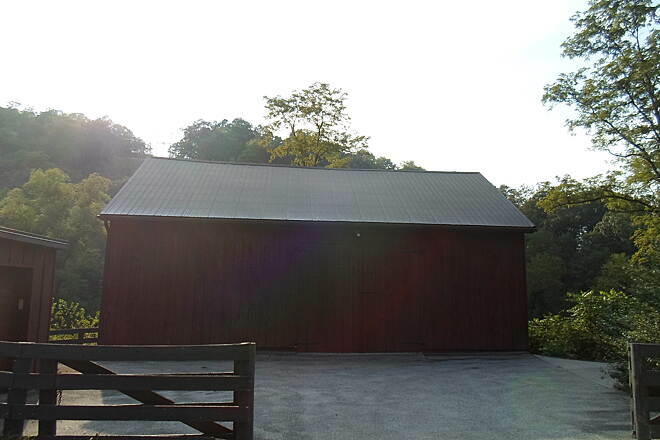 My wife and I started at Brillhart Station and rode south 10 miles and then back. Stopped at Seven Valleys Tavern for lunch, great place. 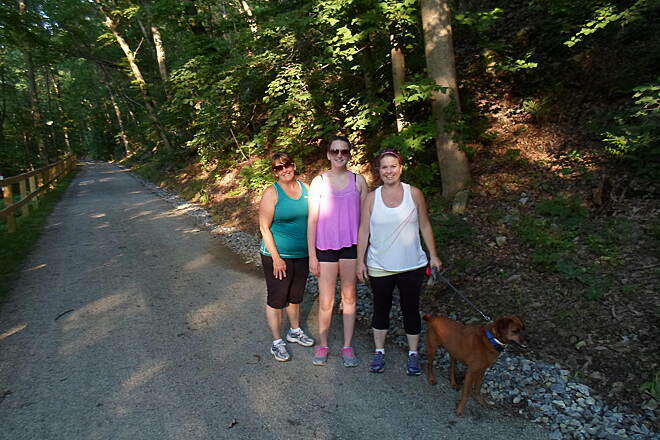 This was our sixth different trail this summer and our favorite. 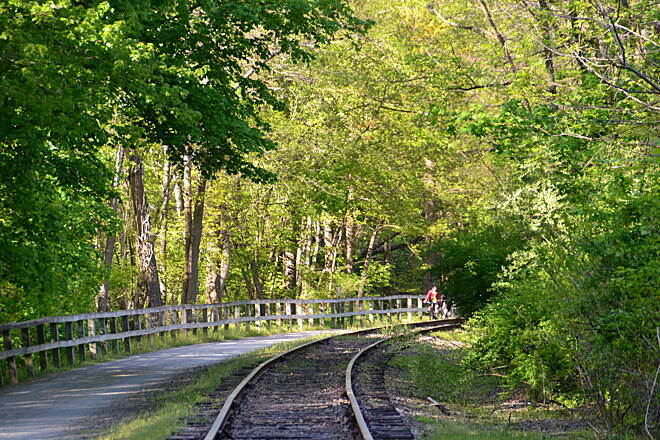 We ride this trail frequently, always starting from Brillhart Station and heading south. Our goal is always to make it to the MD line, but we don't always succeed. Even on busy holidays the trail is not over-used. The surface is a hard packed crushed limestone and is very consistent and well maintained. 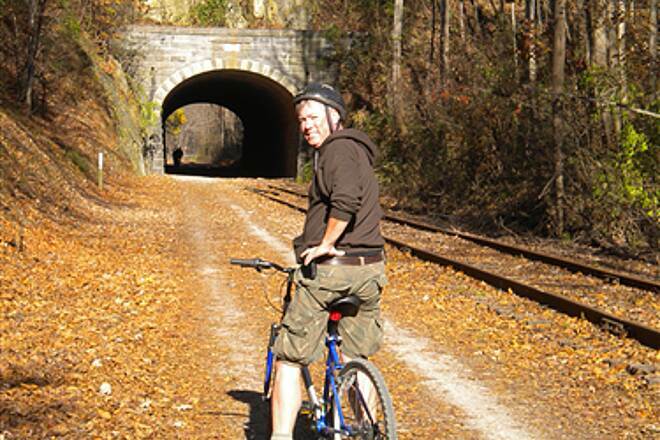 One year we rode the trail the day after a huge windstorm blew through southern York county. On the way south we had to walk our bikes through an area where a few trees had been blown down across the trail. 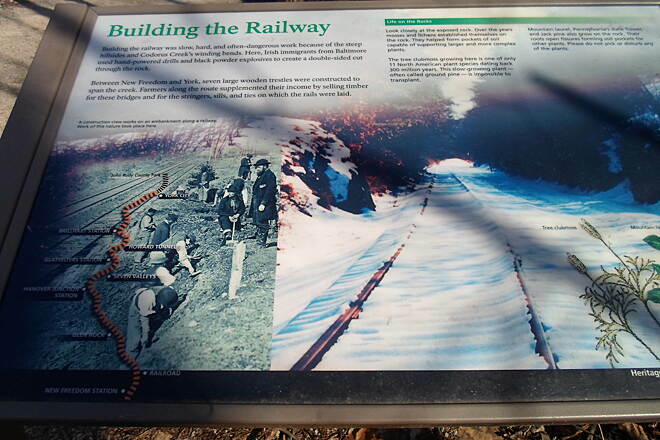 Near Seven Valleys we passed a crew of guys heading north on gas powered rail maintenance cars carrying chainsaws. 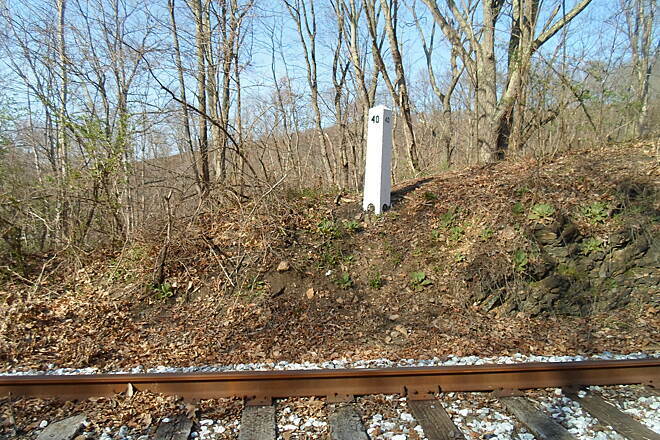 By the time we rode to Glen Rock and back the trail had been cleared. Nice! 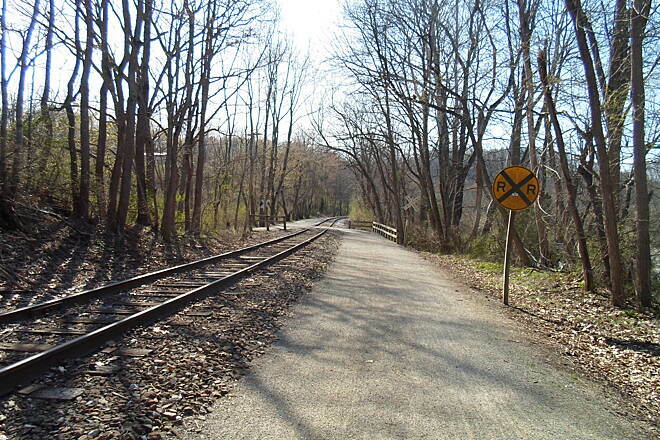 Be aware that the trail does rise as you ride south, with the grade increasing noticeably past Glen Rock. But the beauty of that on this out-and-back is that the ride home is mostly downhill and a pleasure. 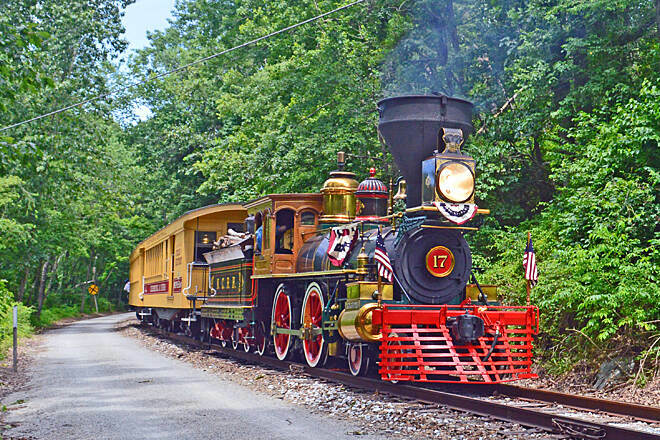 With luck you'll pass the reproduction civil war era steam train that runs between New Freedom and Seven Valleys on holidays and summer weekends. 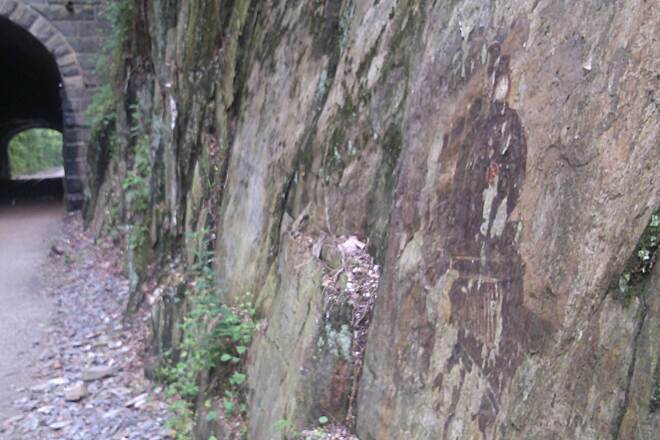 If you're a baby boomer aged casual trail rider like us you'll probably love this trail too. Bonus: If you're a pizza fan (who isn't?) 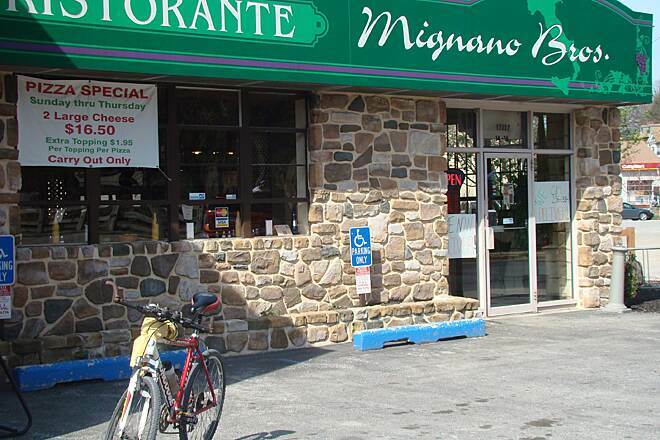 stop for lunch at Mignano brothers in Glen Rock adjacent to the trail. Highly recommended! We parked and started at the Brillhart Station parking lot. Headed south toward Maryland. 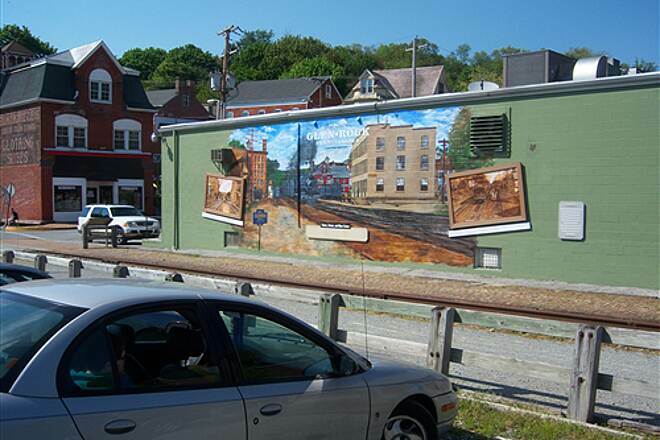 Many great sights such as Howard tunnel, beautiful farms, small towns, railroad stations and museums. We were glad we had the slight up elevation most of the way to New Freedom as it made the way back easier! Trail surface was great. 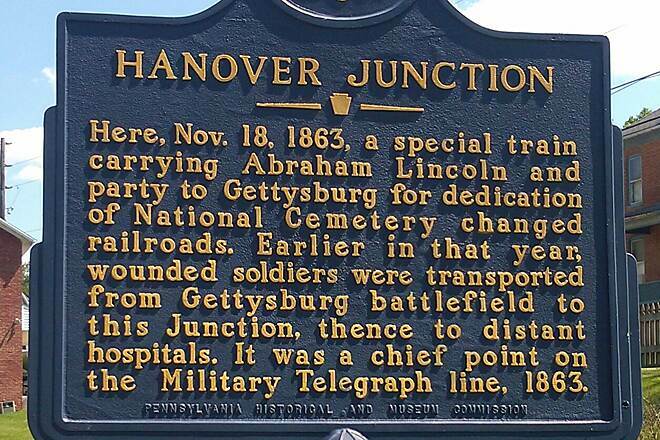 Interesting to note from the trail brochure that President Lincoln traveled this rail route to Gettysburg to deliver his famous address, and stopped at Hanover Junction. 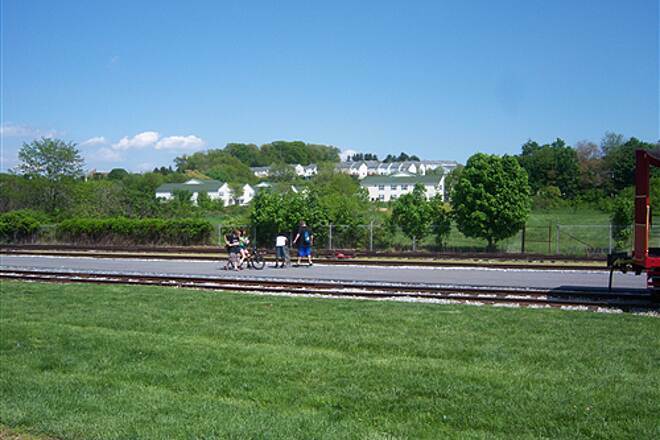 On Sunday, June 6/28/15, I drove from my home in Fallston, Md to New Freedom, Pa, and jumped on the trail right near the New Freedom RR Station. Rode from there up to York and back in 3 hours. Despite torrential downpours the day before, I found the trail to be in very good shape, with just a few muddy areas with some puddling. Otherwise, the surface was in good shape. The only other problem I encountered was a tree which had fallen across the trail just short of the trail end in downtown York. 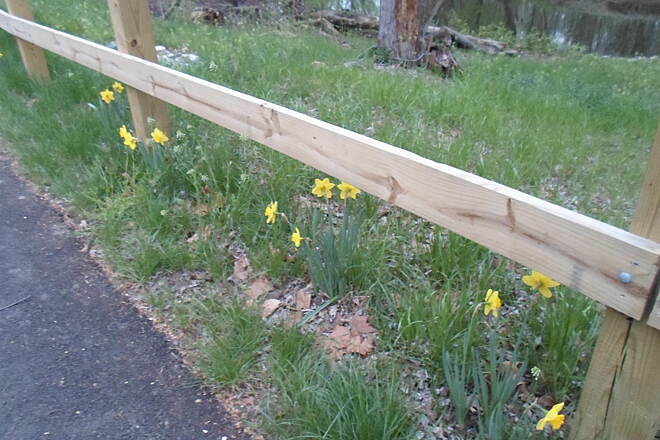 (As I said, the day before had seen very bad storms, so I wasn't too shocked to see this.) My 37.22 mile round trip ride was very enjoyable and I can't wait to do it again. 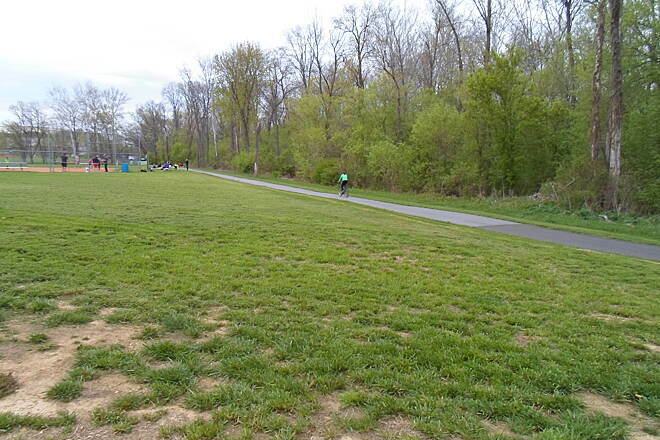 ONE FURTHER NOTE: Despite being from Maryland, I purposely chose to ride the Pa section on this day because the surface is much better maintained than the Maryland section (Torrey C Brown Trail). The Maryland section, while great, would probably have been a muddy mess from the storms. 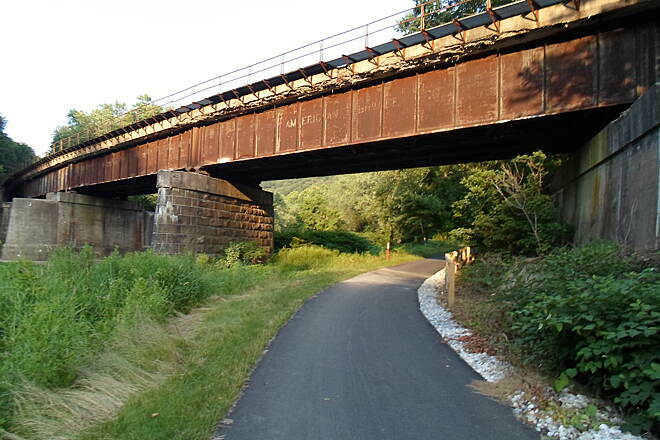 Great ride on a great rail trail this morning. We parked at the Brillhart Station parking lot. The parking lot was large and about half filled at 8:30am when we arrived. 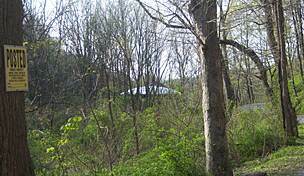 There was Porta-potty restroom facilities there as well. We rode to the Maryland state line and back. Covered about 34 miles. Slight grade up going south so it was an easy return trip. This trail lived up to all it's hype. I highly recommend riding this trail! 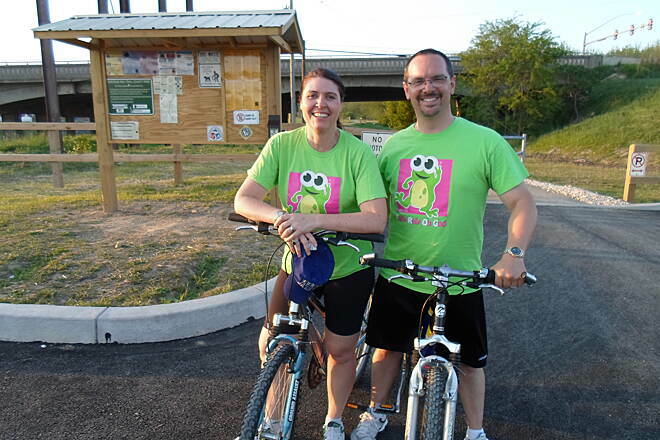 My wife and I ride this trail a couple of times each year and have always had an enjoyable experience. 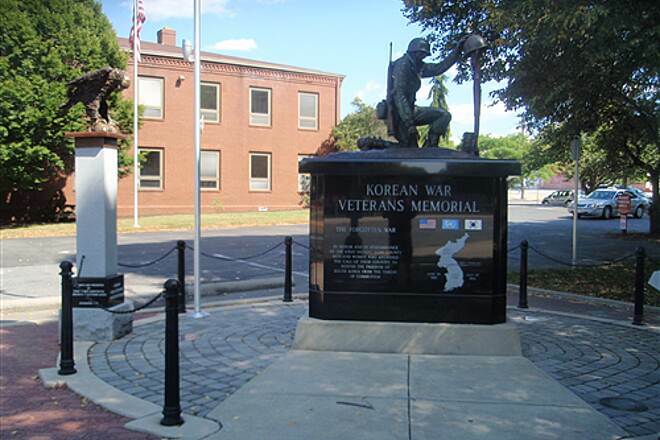 Each section has its own character and charm with plenty of historical markers to read along the way! 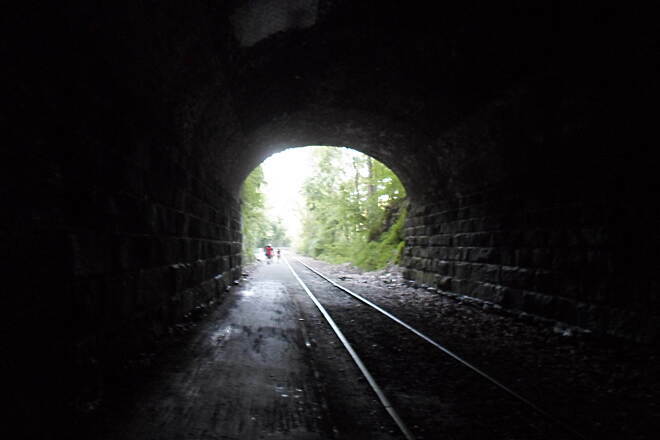 Even a cool tunnel! 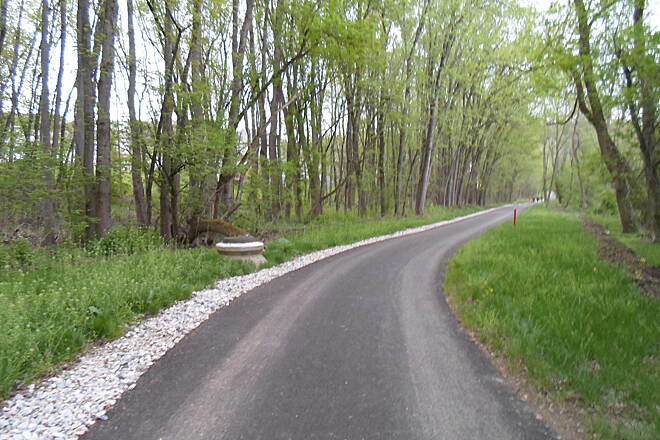 It is mostly hard packed fine gravel which works with any type of bicycle however we have always used our MTB cycles. 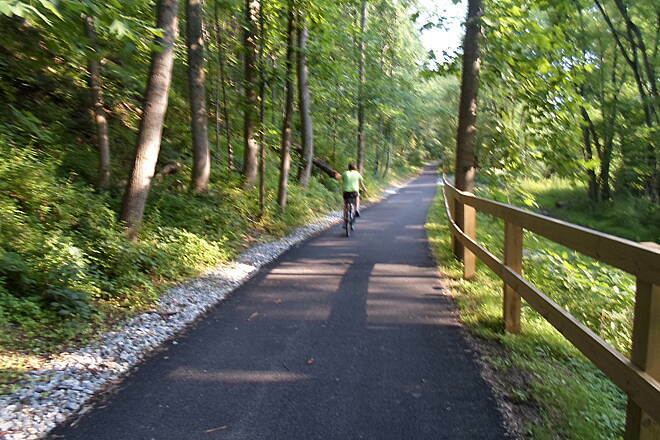 We have also continued on to the Great Northern Trail in MD and followed it 20 miles to the end. From York it is about an 82 mile round trip and makes for a great day of exploring and a good aerobic workout!! 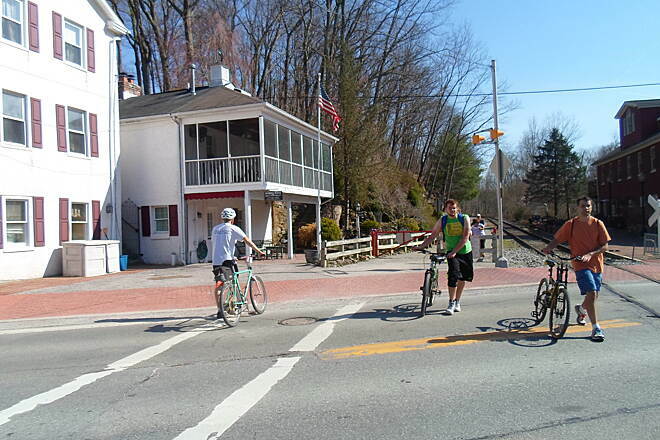 I rode from New Freedom to York on 5/29 on a beautiful day after riding the Torrey Brown the day before. 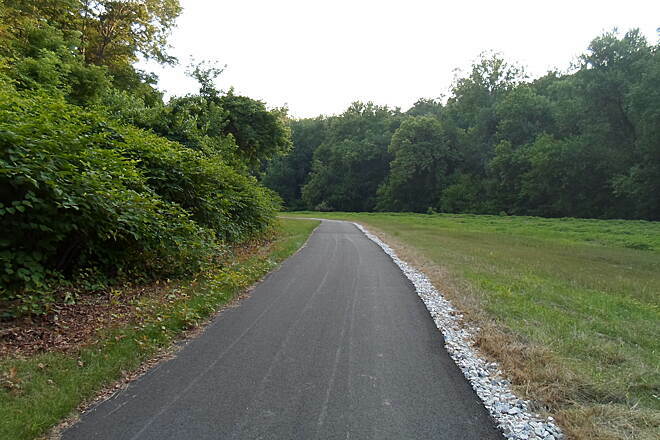 Perfect weather, great trail surface, plenty of shade and nice variety. 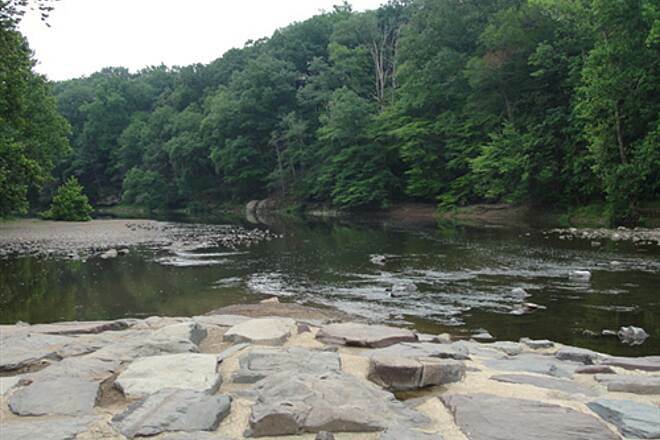 We camped in a campground (Indian Rock) right on the trail just south of York. Stopped at a very interesting second hand/antique store in Seven Valleys. 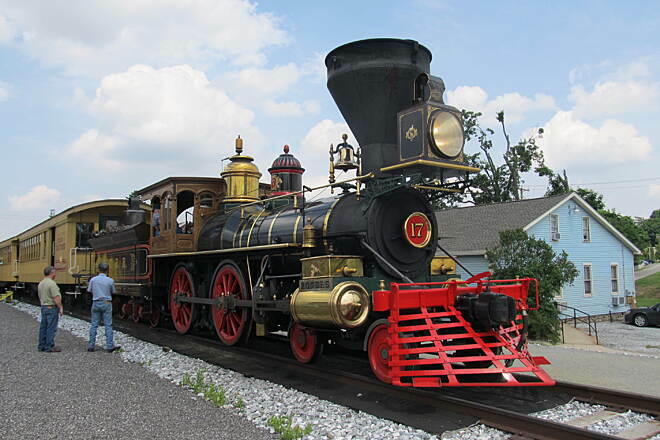 There was an civil war era excursion train that ran New Freedom to Hanover Junction and back. 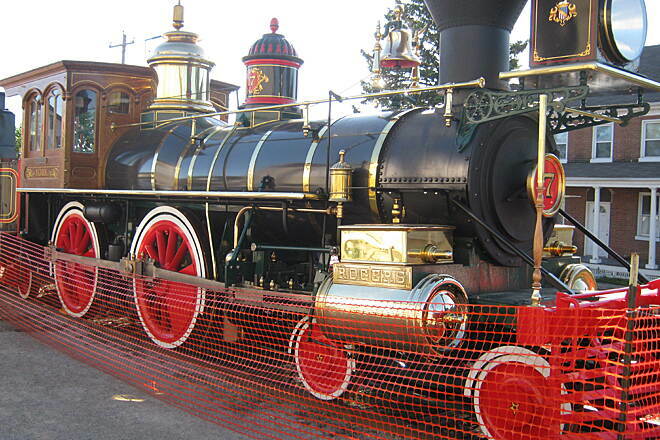 It's engine was a replica of the one use on the same route that carried Lincoln to give the Gettyburg Address. 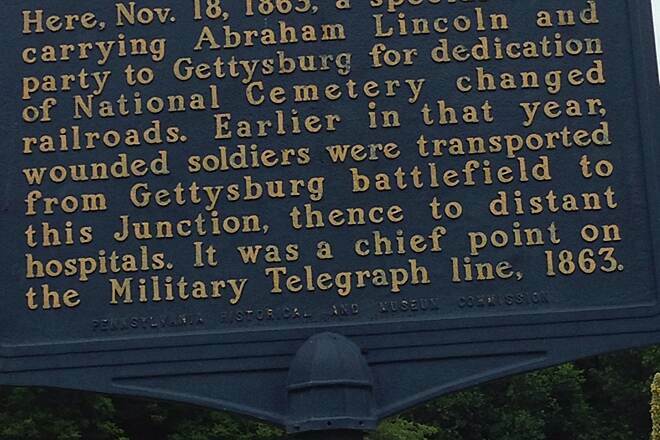 We rode from York, PA to New Freedom. Steady uphill on the way made for an easier ride going back. The trail was well maintained, very scenic, and lots of shade. Had lunch at 7's bar and grill (biker friendly and yummy food). Looking forward to going back. 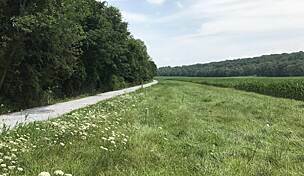 About 3.5 miles of trail have been added north of Route 30. 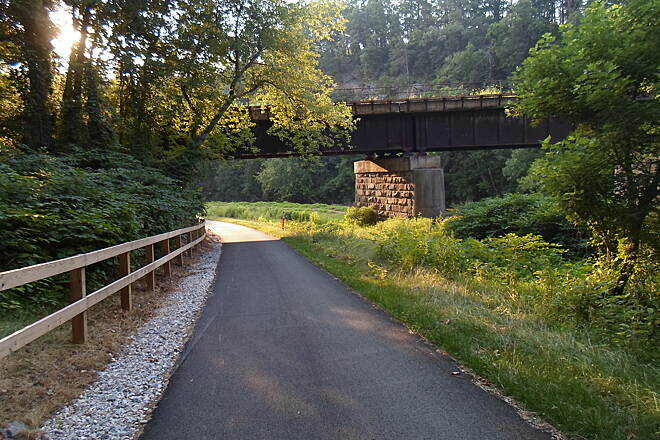 A bit steeper than the rest of the Heritage Rail Trail, it is a nice ride along the Codorus River - just watch for the sharp turns! 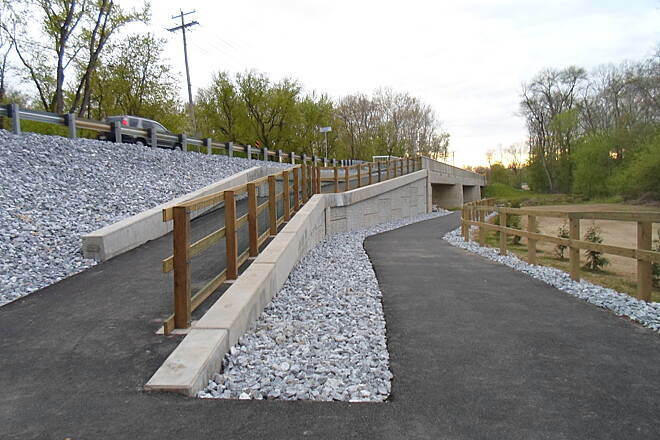 The parking for this section is available at John Rudy County Park or a small parking lot south of route 30 at Loucks Mill Road. 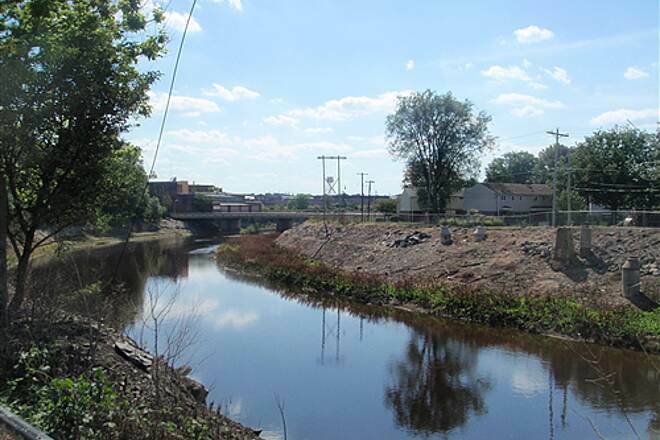 There is less than 2 miles left to connect the Loucks Mill lot to the lot on Philadelphia street. 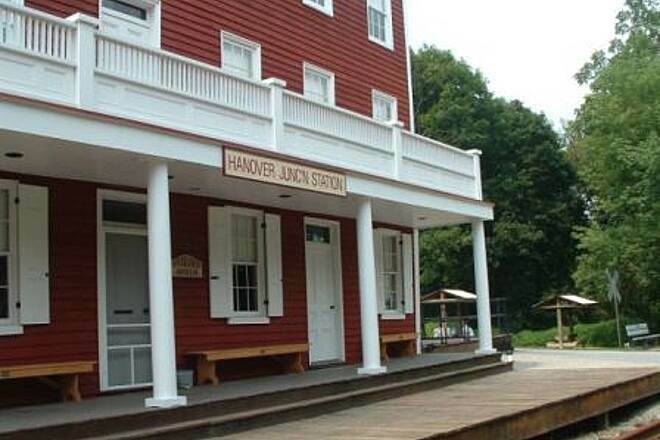 I have been to Hanover Junction on a number of occasions over the years. I have taken digital images of this horse before! 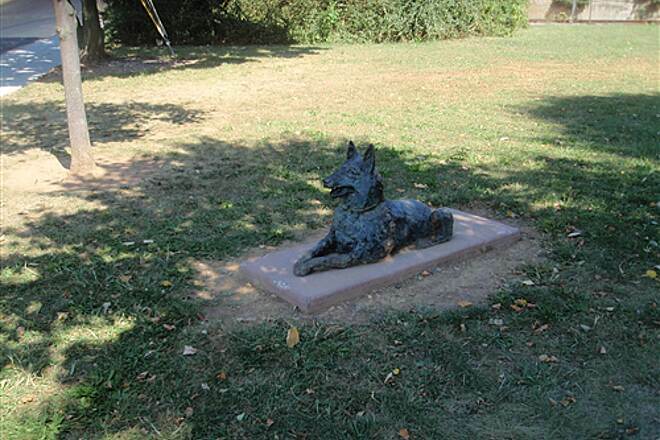 See http://ab3bo.com/ncr-trail-horse-sculpture-2014-11-19/ . It has not moved since I have been taking shots. 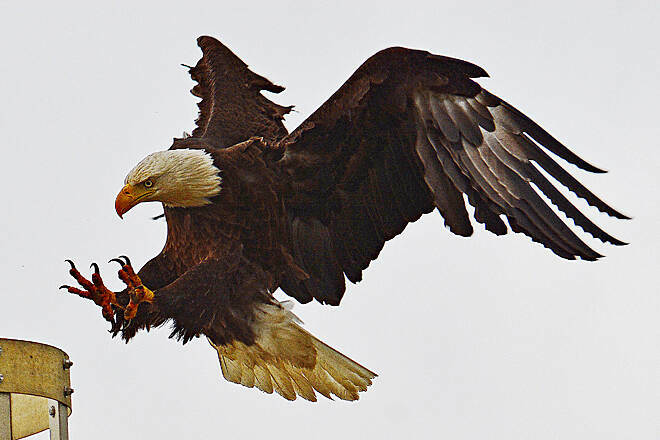 September 16, 2014 is the first time I took a look at what it was eating! 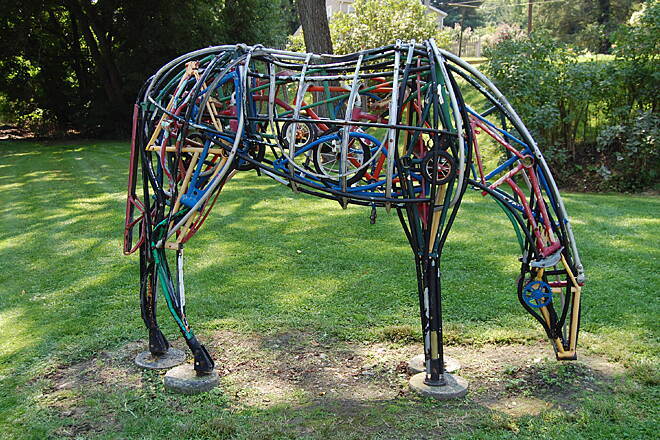 It seems the horse is constructed with recycled bicycle parts. It has been consuming tricycles over the years! I do not see any kid parts inside. Luckily when it eats the tricycles the kids must be off of them! 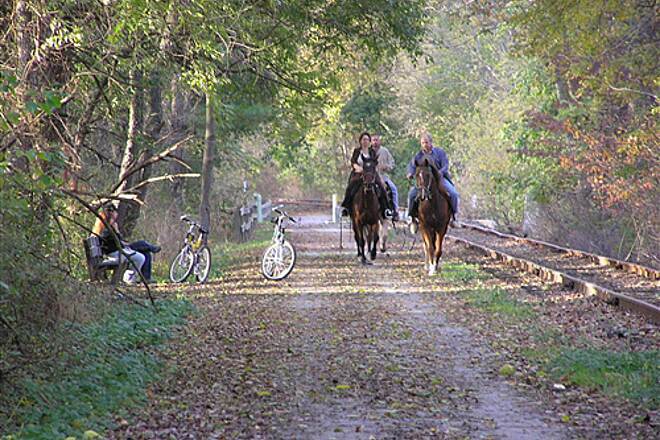 Check out the horse when you walk or ride the NCR Trail at Hanover Junction! Someone did wonderful work on this horse! 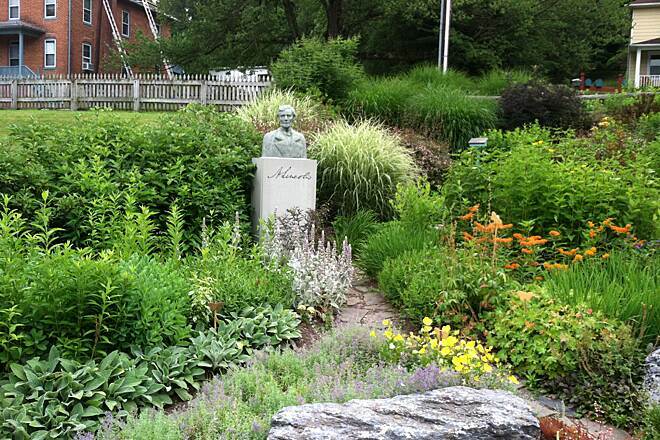 Stop and take the time to visit! No halter or lead line required! 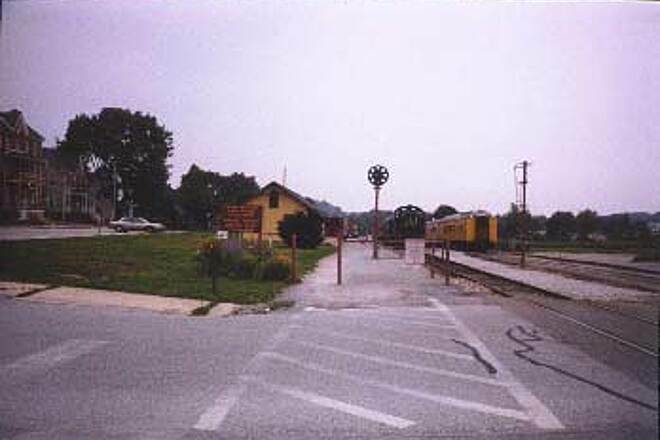 Hanover Junction is at about the 10.5 mile marker along the NCR Trail. 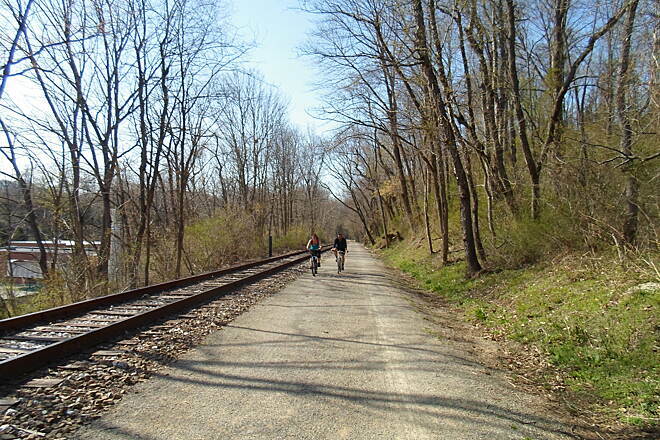 In Pennsylvania, the NCR Trail is also known as the Heritage Rail Trail Park. I wanted to give this whole trail five stars, but my initial experience rattled me down to a four star rating. 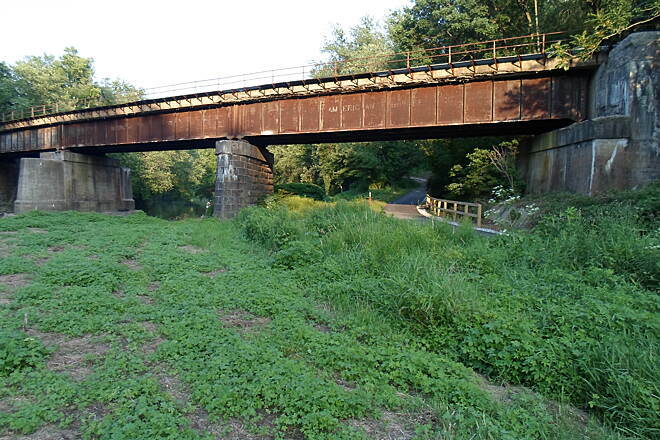 I had started from the Philadelphia/Pershing street parking lot and was a mile into the trip when the obvious trail ended, and I couldn't tell where it let back on. In the haste of looking around I hopped off a curb, and learned four blocks later, that I had pinch popped the tube in my rear tire. 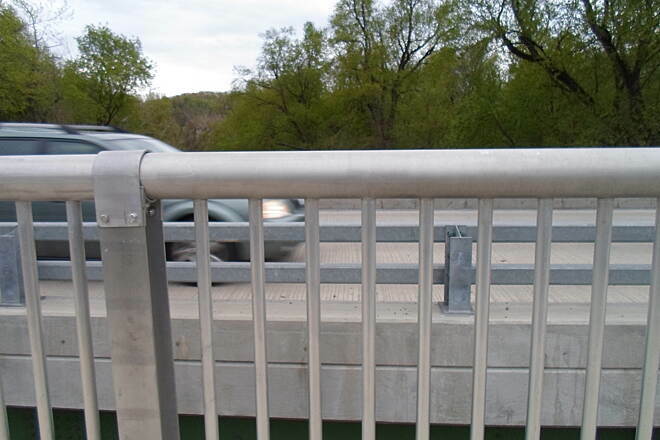 I was four blocks into York city, and being from Harrisburg, I accessed that the area didn't seem safe enough to stop and attempt the repair on my own. 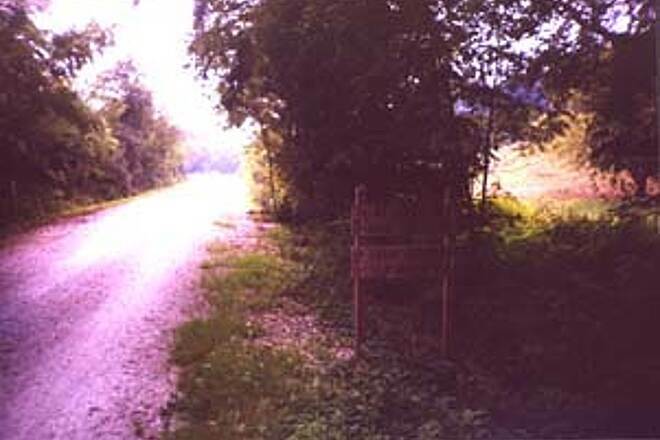 I had no idea if I was on the trail (which I'm assuming was somewhere off the main road I was on), and the uncertainty was unsettling. I walked the bike back the mile to my car and decided that the parking lot wasn't the safest place to attempt a repair either, so I drove to Gung Ho Bike Shop and had them fix it for me. 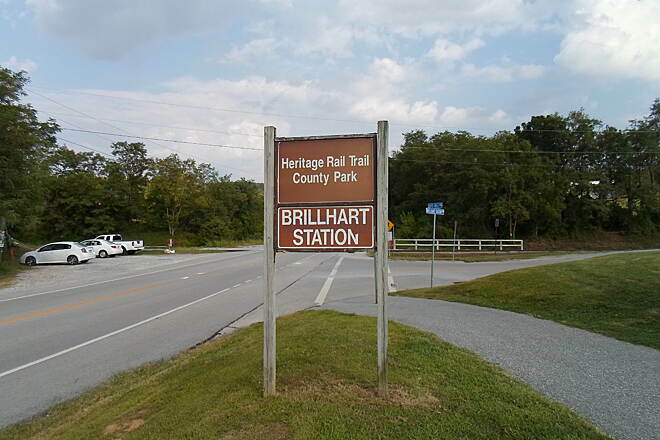 To make up for lost time, I drove to Seven Valleys and started the Heritage Trail from Brillhart Station. 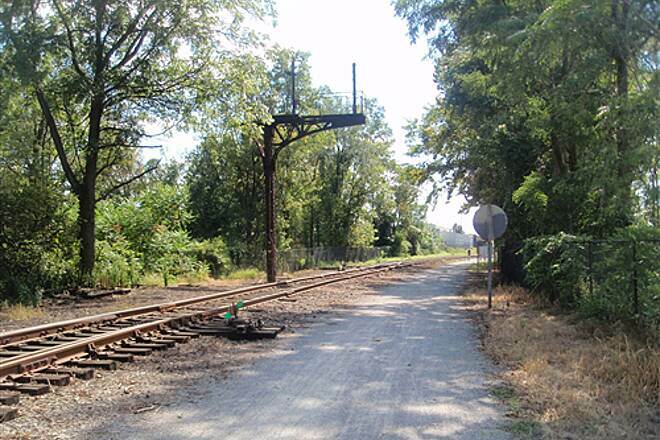 I rode to the zero point on the Northern Central Railroad Trail in Maryland (79 miles). 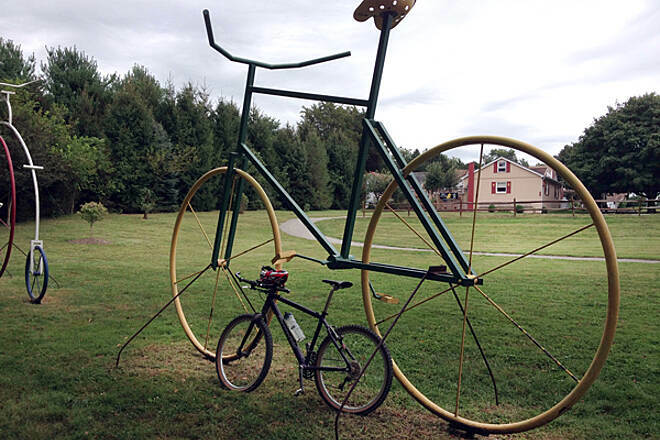 I was on my GIANT brand hybrid, and it was perfect for the entire duration of the Heritage trails terrain. 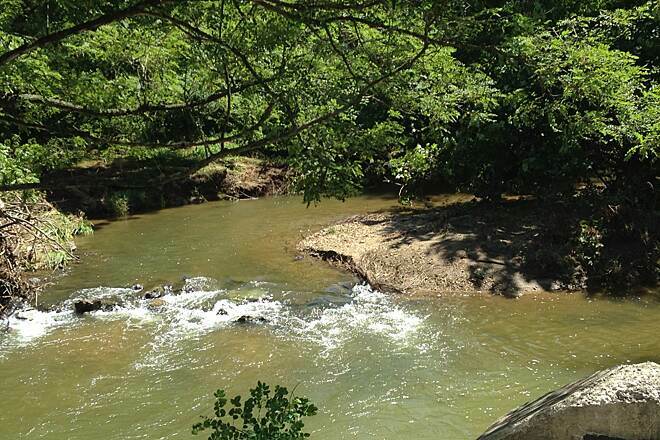 The ride was scenic and level which made for a highly enjoyable cycling experience. It had rained a lot earlier in the morning, but the trail is so well maintained, that I hardly encountered any puddles or swampy spots. I recommend this starting point to anyone regardless of your riding intensity, although, the crushed stone jitter might be a bit much for high intensity speed cycling. My arms and shoulders were definitely feeling overworked by the end and I averaged close to 10mph. It is excellent for low/medium cycling intensity where your goal is distance. Likewise, it would be an enjoyable cruise for short distances with family/friends. Kudos to the maintenance team. 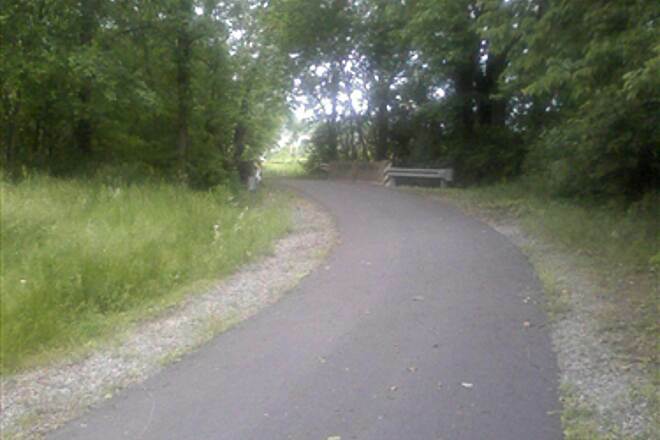 It is obvious that they care about keeping this trail nice. 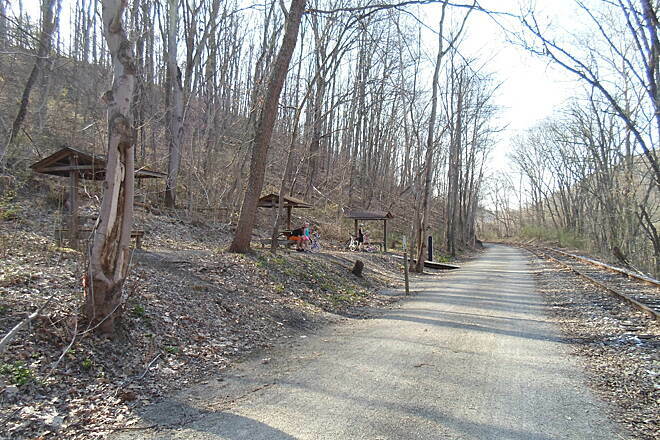 This is a " must do" trail, it is well maintained and well shaded. 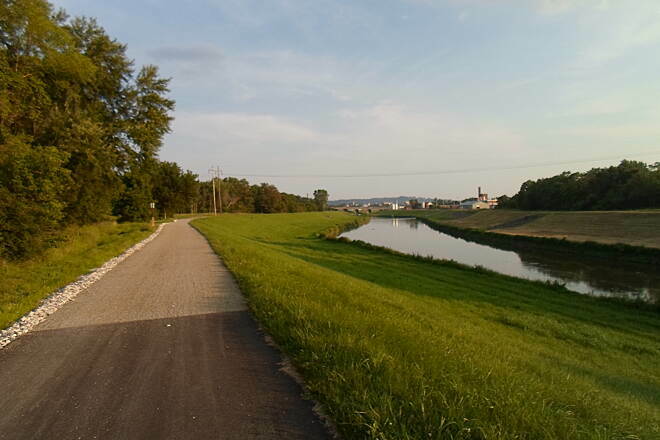 I rode from New Freedom to York and back, even took in part of the trail south of the Mason Dixon. 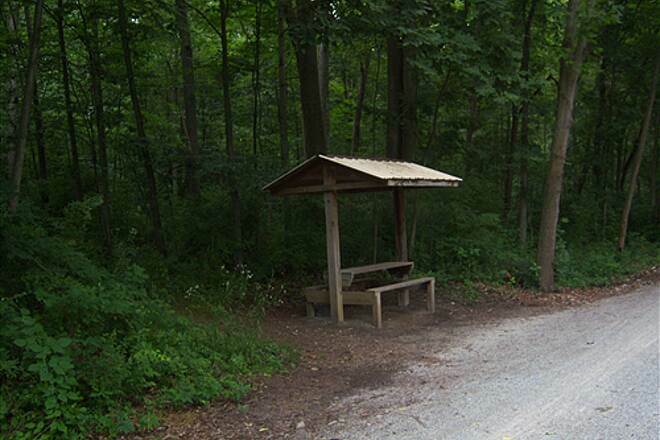 Lots of benches to stop and take a rest, as well as picnic tables that are covered by a roof something you don't see on other trails. 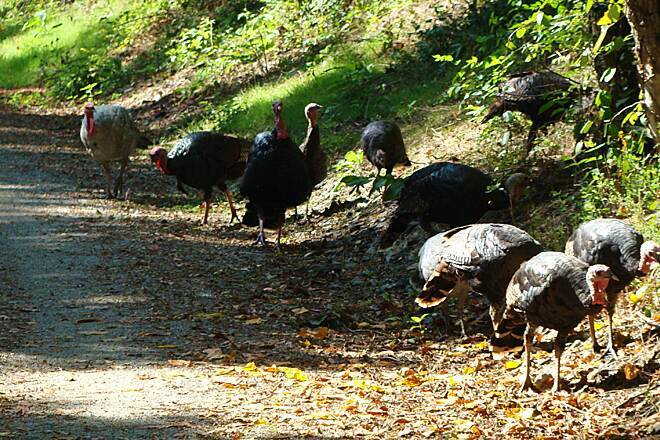 It was a weekend, so traffic on the trail was heavy. Beautiful scenery, and all the towns along the way seem to cater to bike riders. 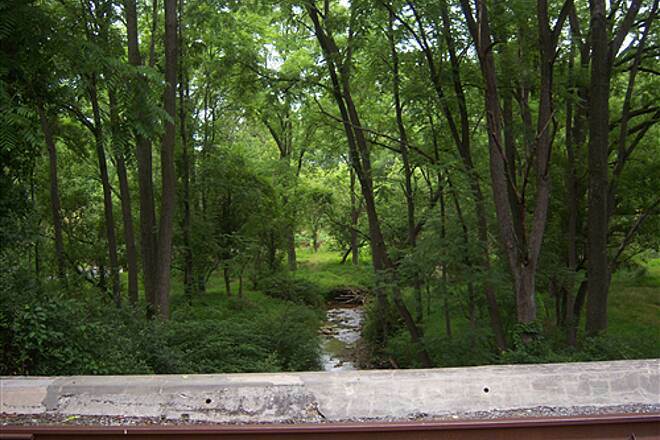 I'm looking forward to riding this trail again in the fall. We're weekend warriors and had a great day on the southern half of the trail . 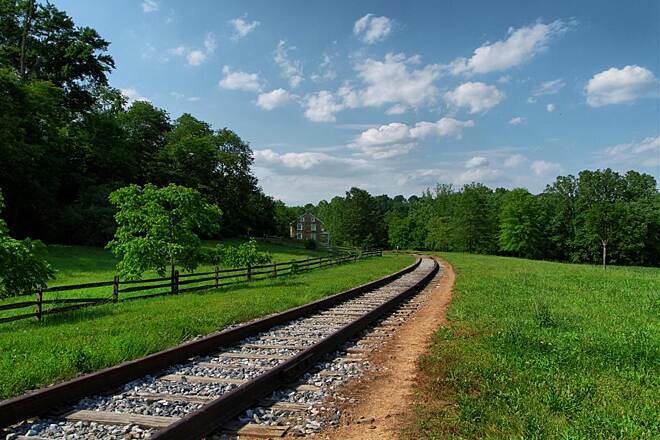 Nice combination of pretty countryside and railroad villages -a classic rails to trails destination. A must do! 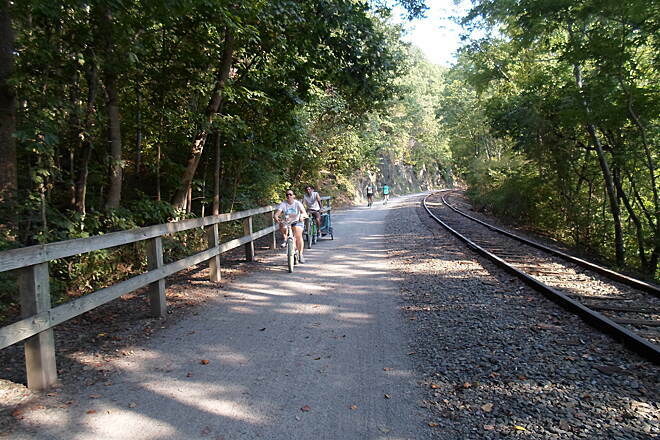 Just recently rode the trail on a Bike Ride from Glen Rock, PA to Monkton, MD and return. 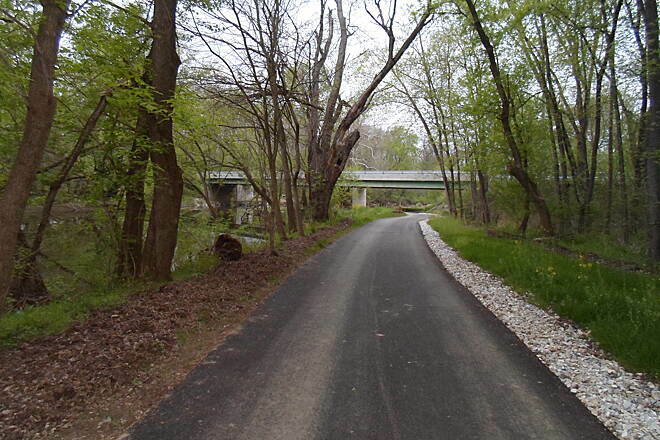 Overall a beautiful ride, especially in the Gunpowder Falls area in Maryland. 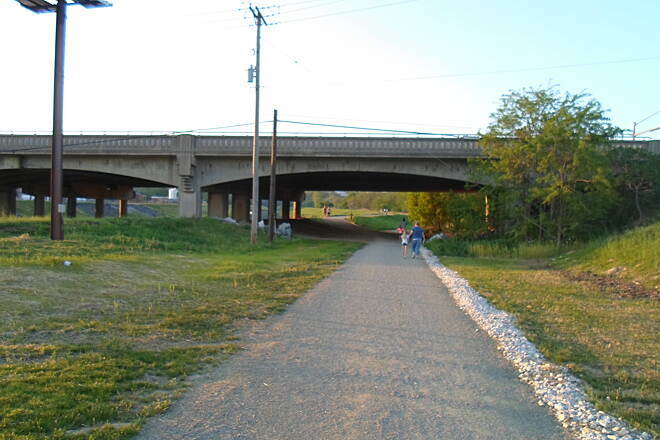 I must say the Heritage Trail and the NCR Trail is in desperate need of a resurfacing project. 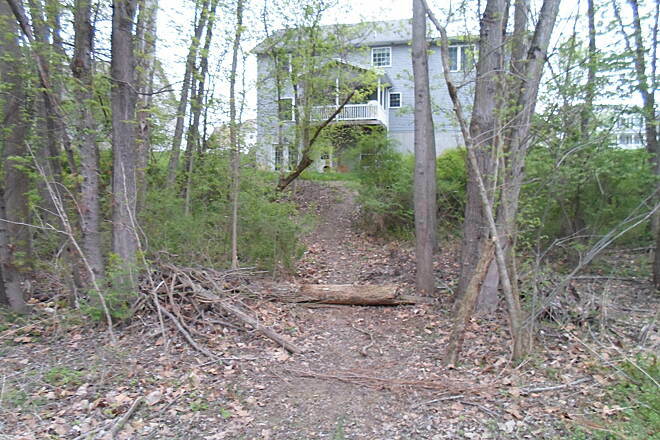 Nature is encroaching onto the trail and in some areas it is very narrow. 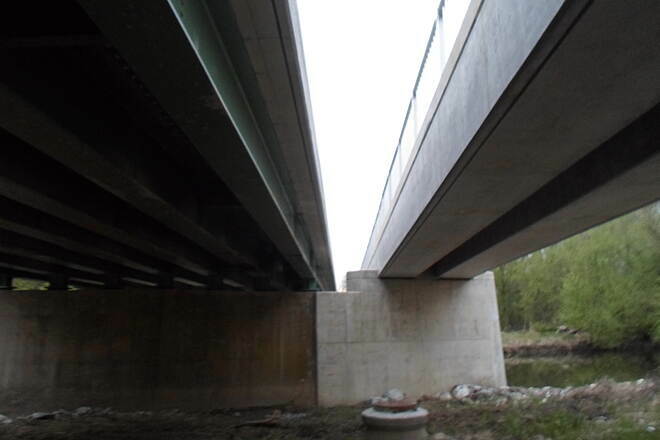 If something is not done soon it will be 2 single track lanes going North and South. 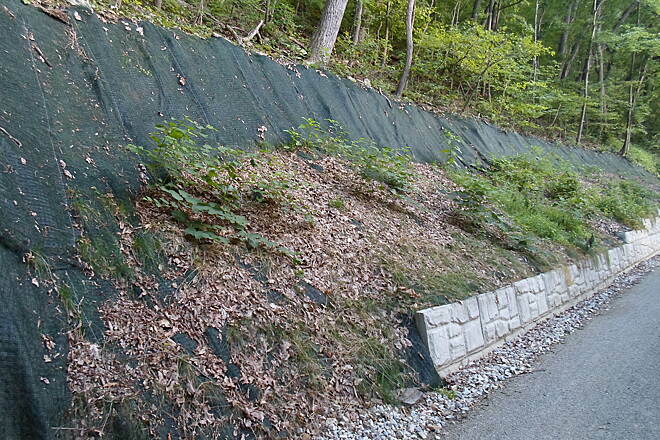 The top layer of stone is gone in most places and it is down to the base layer of stone and dirt. 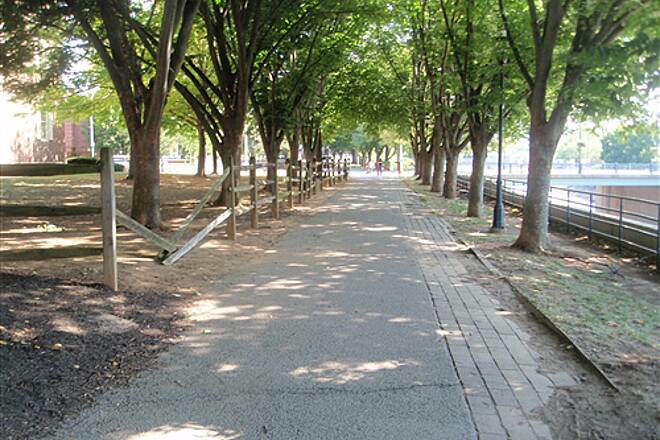 I would not recommend bringing a horse on this trail due to the narrow areas and blind spots. However, that is not to say they should be banned. Horses are welcome! 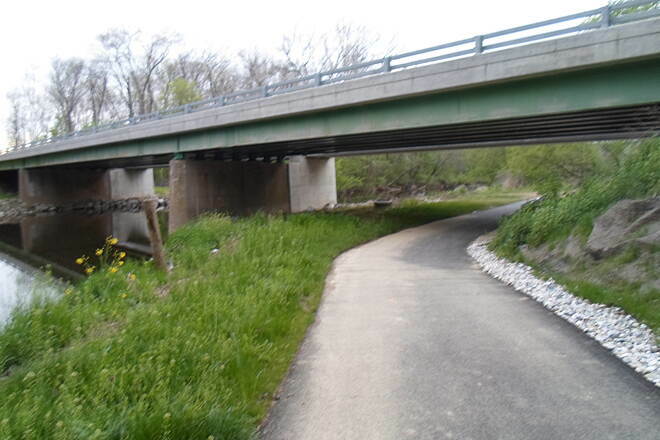 If they would at least cut the vegetation back to the original width of the trail that would help. 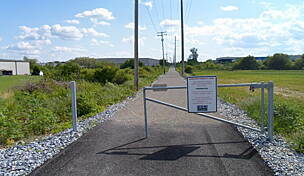 The NCR Trail surface is no better. 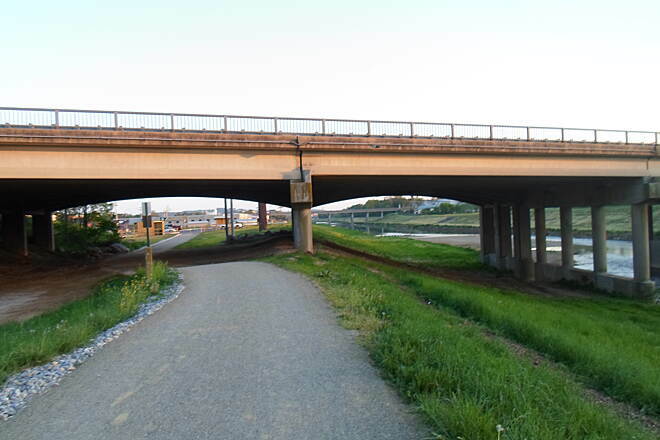 Both Trails are being left to detoriate. 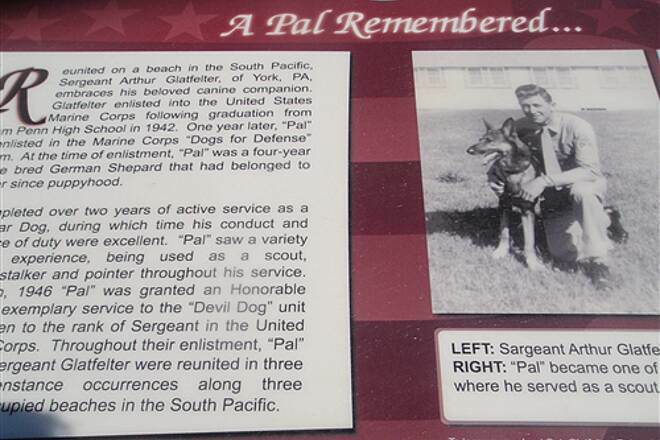 There used to be Rangers who patrolled the Trails, I have not seen Rangers in some time. 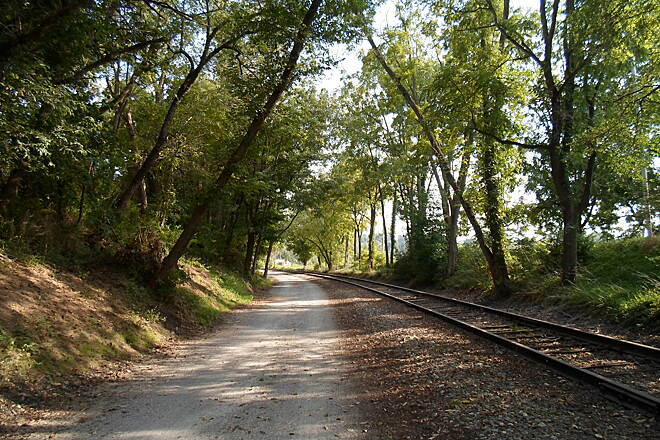 I just got back from my first visit to the Heritage Rail Trail. 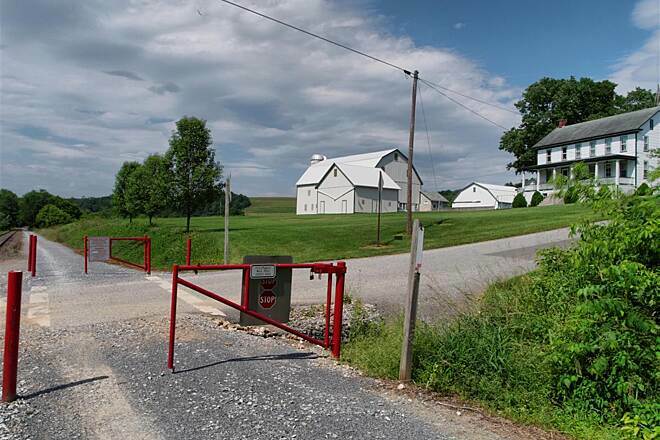 I live in the northern end of York County, and it always seemed like such a haul to get down there. I shouldn't have waited. It's a great trail! Very well cared for, even this early in the season. There were a couple muddy spots, but it's only May 2 after a long hard winter! 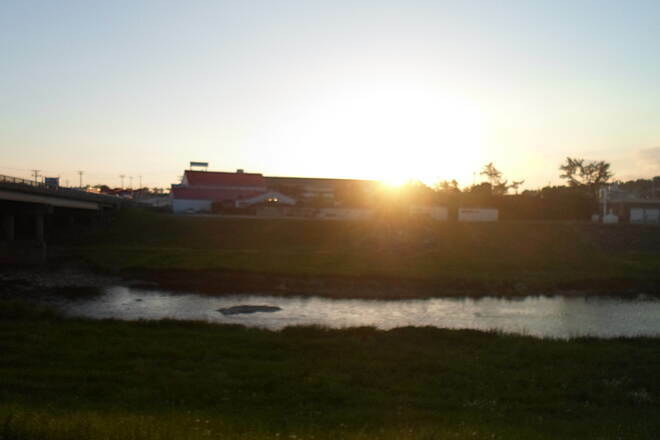 The scenery and the little towns you pass through are just gorgeous. 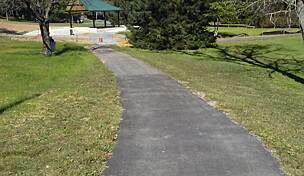 Hats Off to York County Parks Dept for creating this trail. The trail was very nice. Easy to ride and very scenic..
Don't try to begin in York! 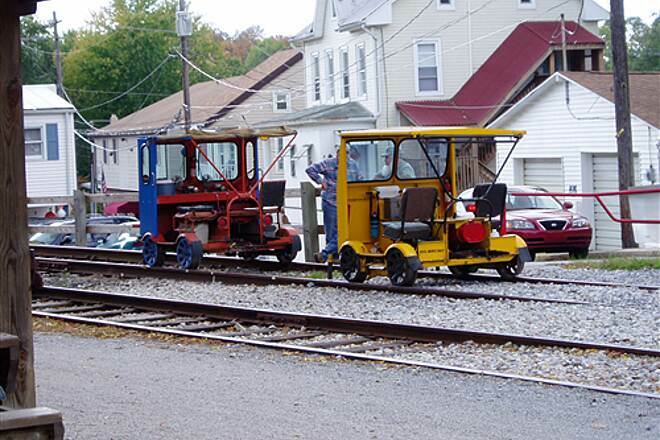 We wanted to begin at Heritage Park in York at the end of the line, however there is no parking there. We called the York parks number in the information while standing there and the clerk admitted that you need to go park in a parking garage and spend the money. She recommended just driving to a new starting place at one of the other stations. What can I say? Lovely trail. Great maintenance. 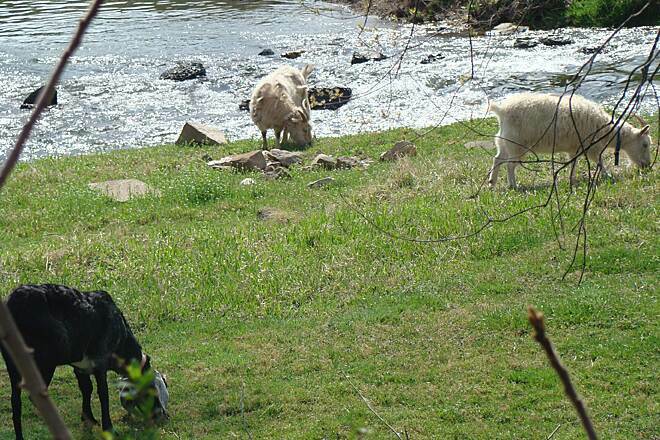 Friendly locals. 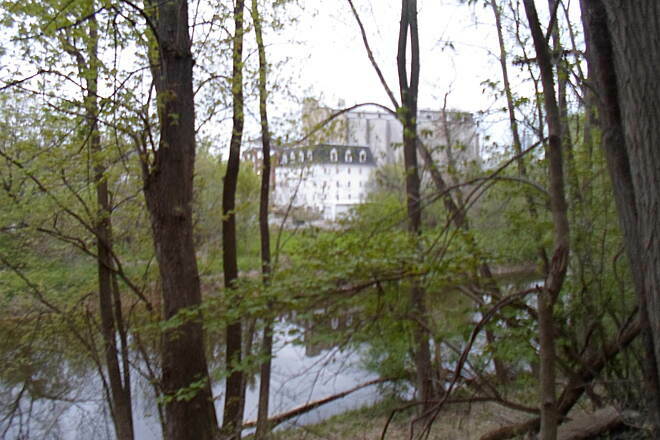 The trail takes you through lush woods from turn of the century towns. 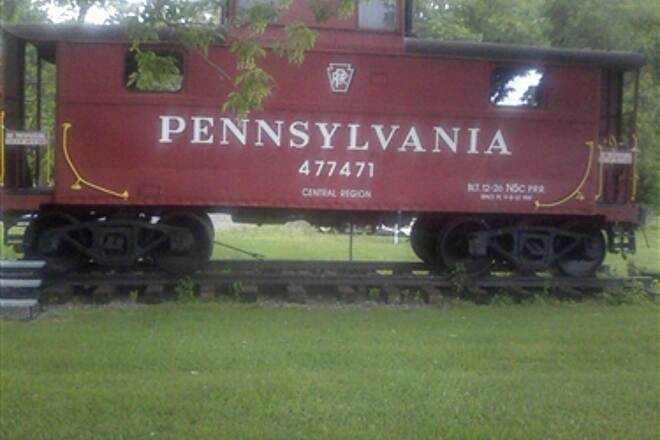 We got to see the old tourist train with the beautiful new red engine. Pretty cool. WE started outside of York and rode one day to New Freedom.The next day we rode in the opposite direction so we were cruising downhill on the return. Would definitely do it again. Stayed outside of York at the Holiday Inn, convenient, clean, decent breakfast good bed. Worth the trip from Eastern PA. I have been on this trail lots of times and have always enjoyed it. 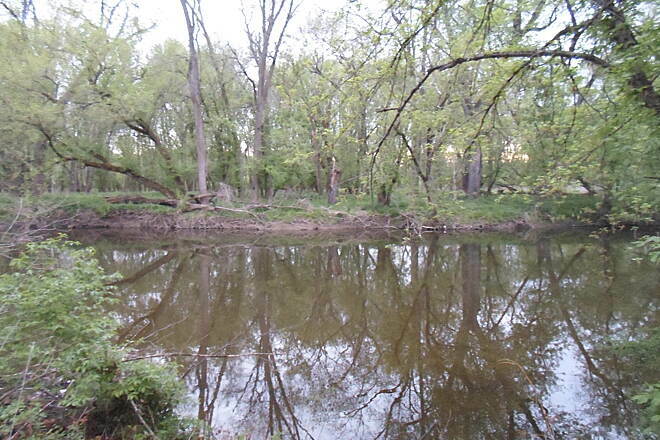 You can go from York City all the way to the Maryland line, or continue and go another 20 miles into Maryland. Plenty of length for those of us who want to long break from the daily grid on our bikes. 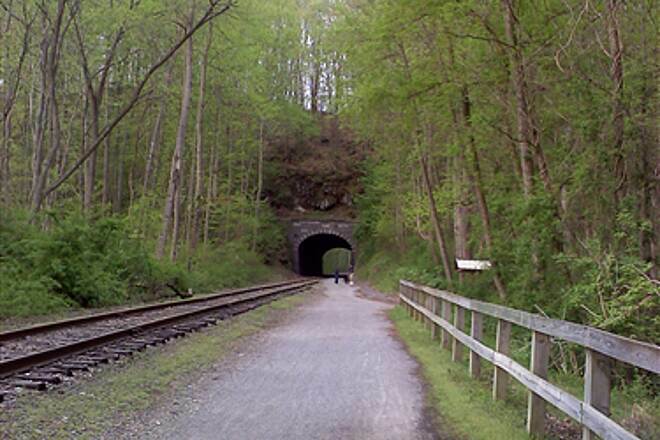 the trail is lovely and well maintained except for the tunnel about 5-7 miles from the start in York. 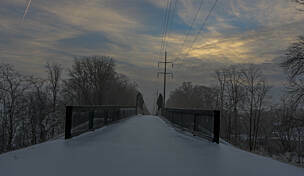 It is dark and slippery, there is a extra rail that has road reflecting markers in the dark It looked like a lane divider I hit the rail and wend down. OUCH! 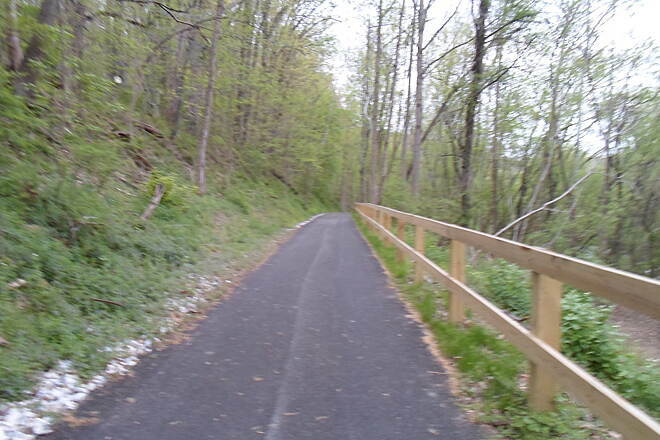 Biked this trail from York, PA to Mason Dixon Line and back in one day. It's an excellent trail. Lots of interesting things to see on the way. Many benches if you need to stop and rest. We packed a picnic lunch and enjoyed it on the way. 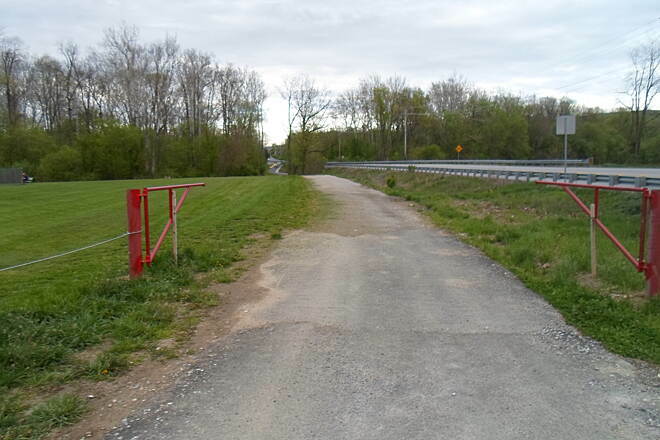 However, we saw signs that between March 25, 2013 and April 30, 2013 trail will be closed between mile 1 and 11 due to some repairs. Not sure what will be done. We will definitely do this again. Highly recommend. 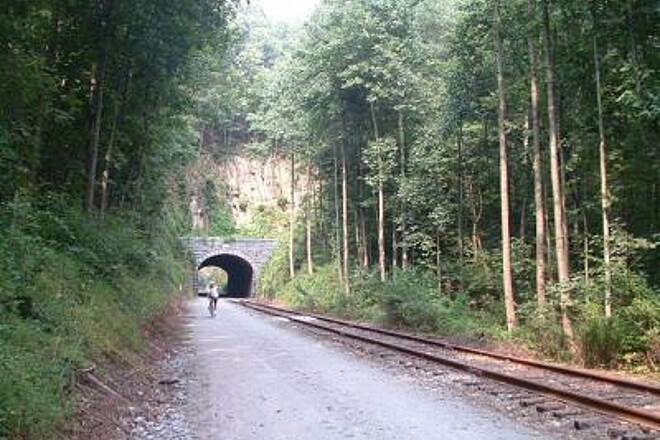 Rode this trail 2 day, great trail,1st time on it so saw alot of neat stuff, rode from York to the Mason-Dixon line and back, was a great day for a bike ride, will diffently ride it again!! 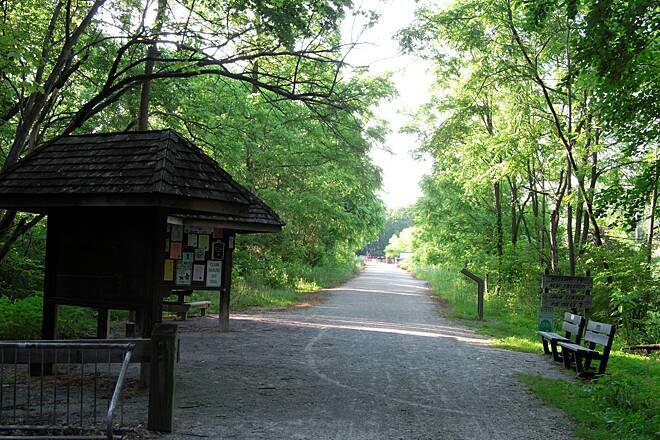 An excellent trail with lots of amenities. 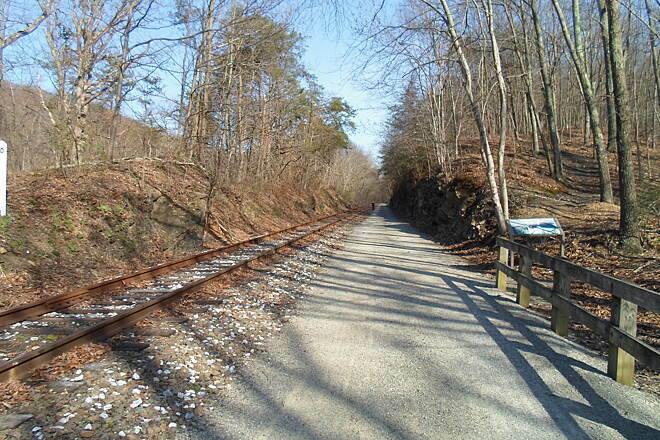 The York County Heritage Rail Trail is an exceptionally well maintained trail. The grading is between 0% to about 2%. 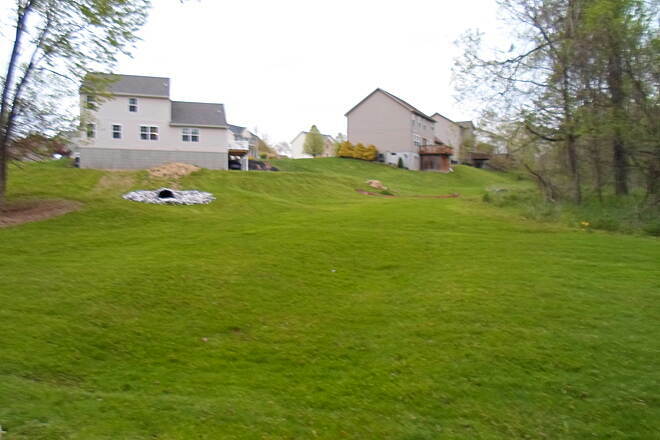 As you head south towards New Freedom, PA, the grade increases to 1-2%. 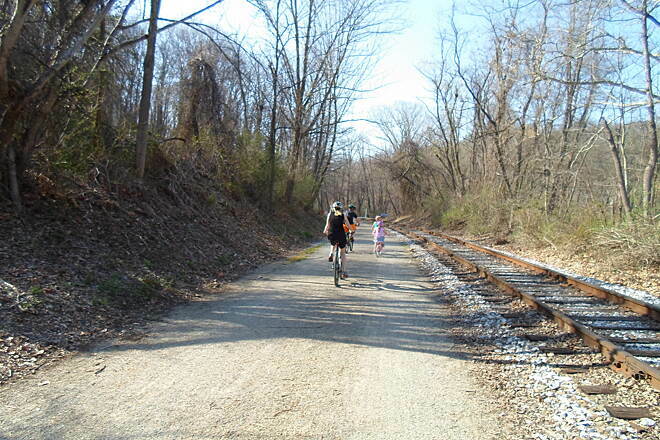 New Freedom is the high point between the Heritage Rail Trail and the trail in Maryland that meets the trail. 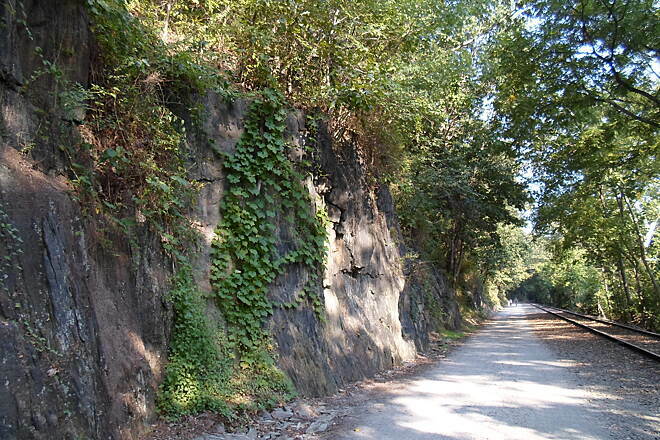 The grade increase starts just south of Glen Rock. However, once you make it to New Freedom and turn around, it is all downhill. I ride this trail at least one time a week. 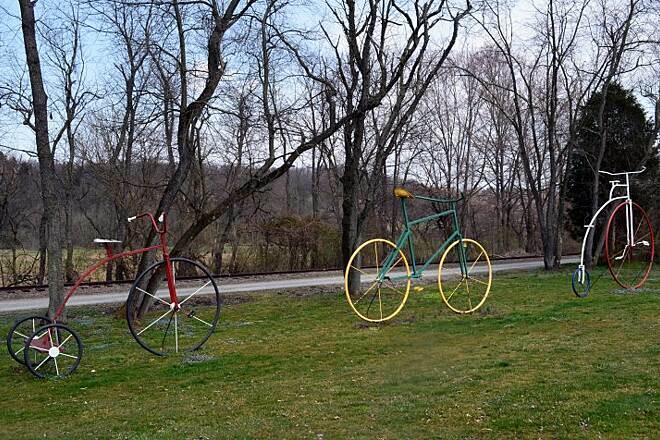 I find that the best place to start my ride is in Seven Valleys, PA. 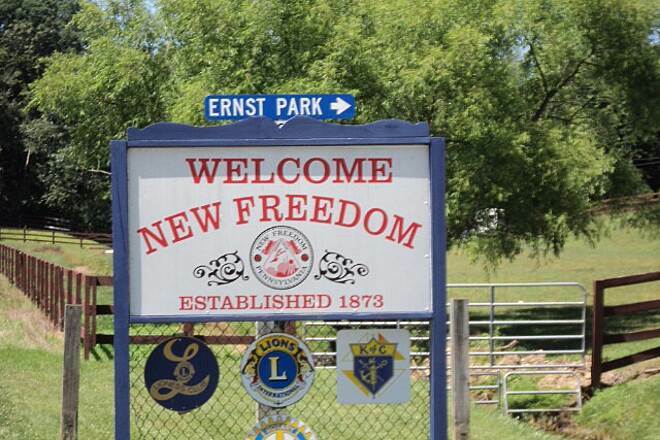 If you start there and head south to New Freedom you will go approximately 20 miles round trip. 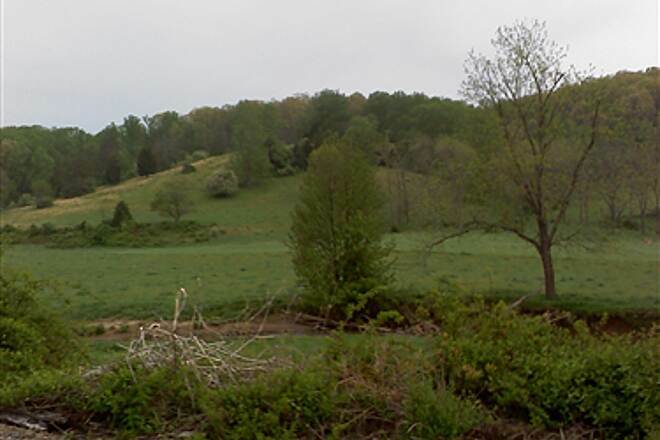 Seven Valleys is about 4.5 miles north of Glen Rock and about 4.5 miles south of Brillhart Station. 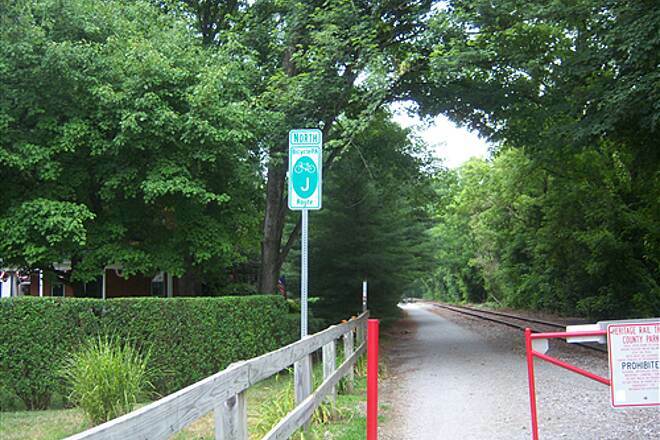 There is plenty of parking at the Seven Valleys trail head and the York County Rail Trail Authority is located in Seven Valleys as well. 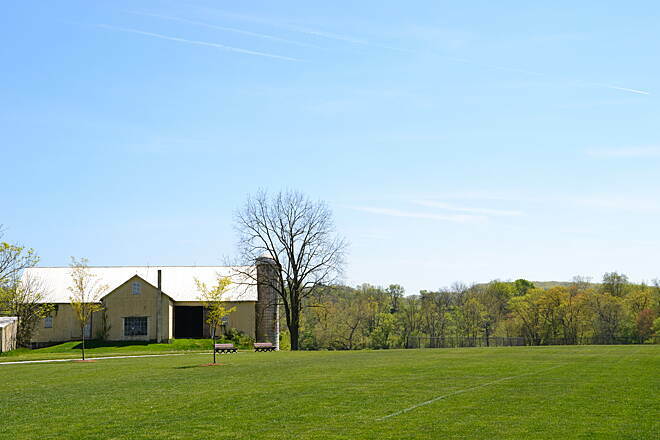 In addition, Seven Valleys now has a bike shop, with bike rentals, right on the trail. 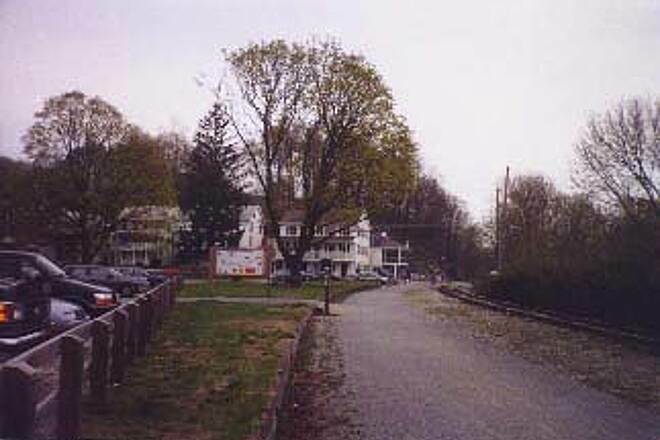 There used to be a small restaurant and bike shop at that location, called Serenity Station. Unfortunately that business closed down but Gung Ho Bikes is in that space now. They are renting brand new comfort/hybrid bikes and mountain bikes. They also have ice cream and other snacks. And very clean bathrooms. 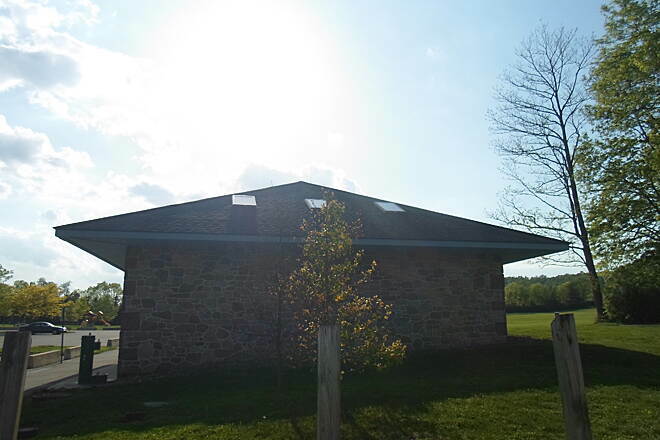 Public bathrooms on the trail are located at Hanover Junction (actual flush toilets) and New Freedom (actual flush toilets) and portable toilets at Brillhart station. There is also a small restaurant located in New Freedom, but their hours recently changed and I am not sure what they are. 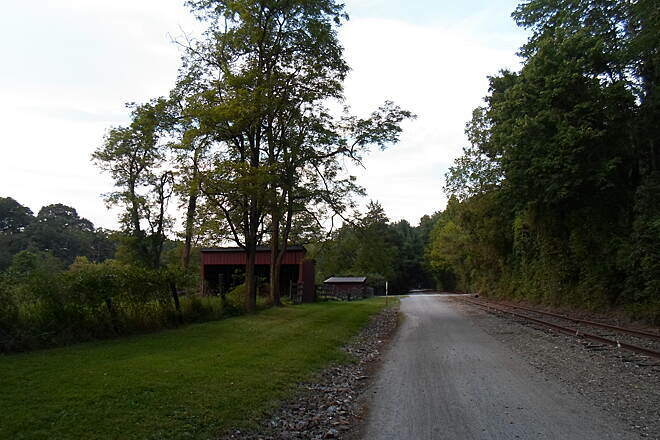 My wife and I rode a 5-mile section of Heritage Rail Trail on 26 May 2012, starting at Glatfelters Station and going south to Boose Rd. (and then back). 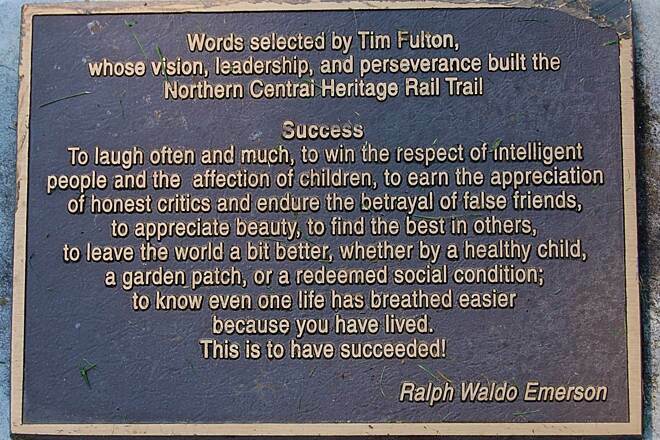 The trail was in excellent condition, and this remains a favorite of ours. 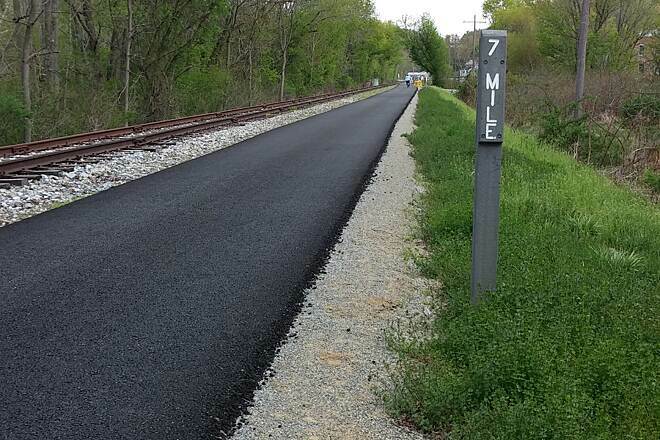 I just came back from my first ride of 2012 on the Heritage Rail Trail and was amazed at how fast the repairs are under way. 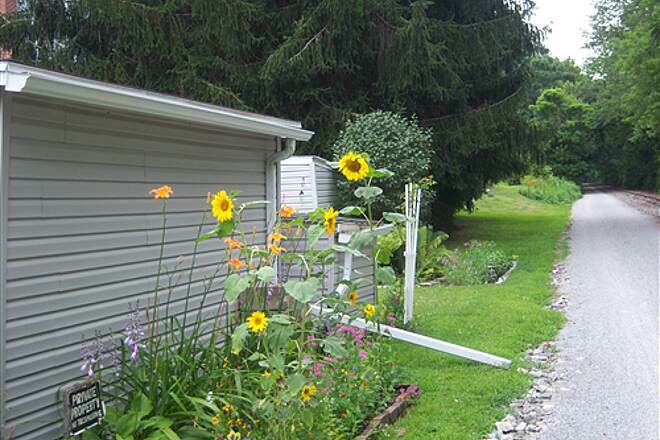 It sustained significant damage in the fall storms. I ride this trail almost daily and LOVE it. It is nice to see a wide variety of people using it from senior citizens to families. 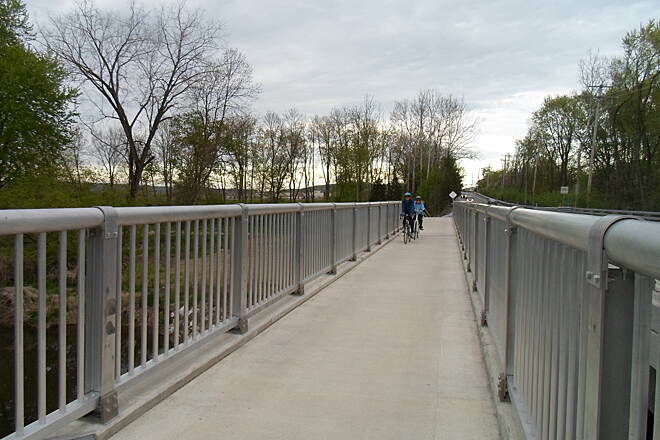 A great experience whether you are riding, jogging, or walking. We only did 16 miles from York to Serenity Station - great condition, fantastic scenery, lovely weather. 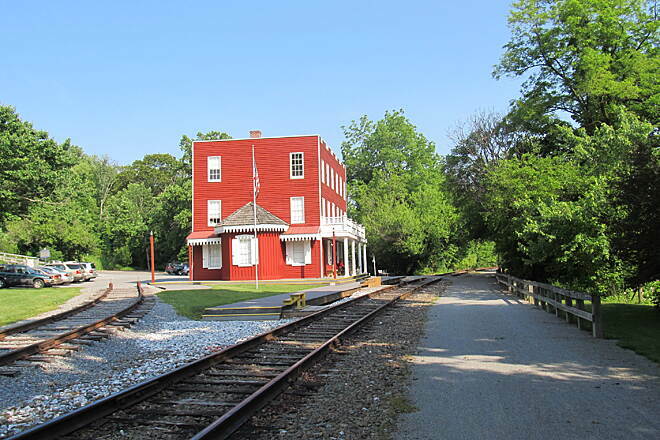 My wife and I took a short ride on the York County Heritage Rail Trail, from the Brillhart Station parking area to Glatfelters Station (about 7.5 miles round-trip). The trail is in excellent condition, and it is among the best trails we've been on. 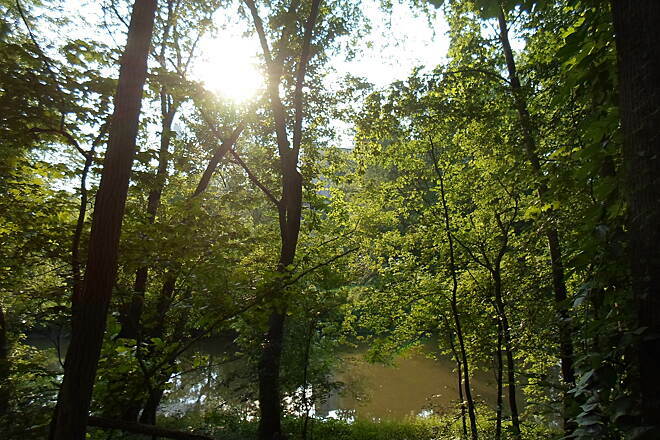 We look forward to returning to enjoy the entire trail. 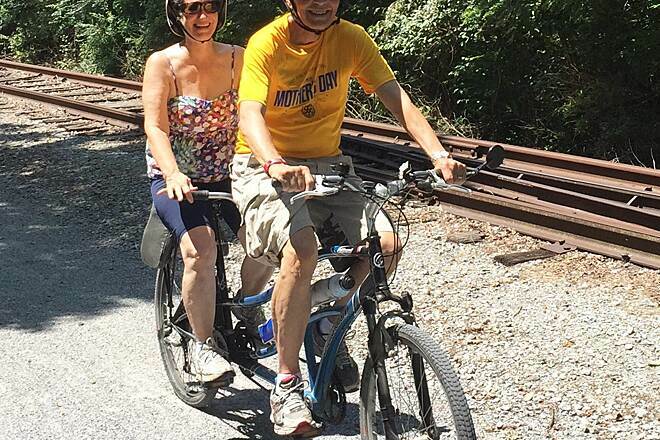 I only peddled a 10 mile round trip on Saturday after Bible College class with my grand-son. I would have gone for more but he was tired due to him riding a 20 inch trick bike with only single speed. The trail was clear even though the week before, we had TS Irene come through. A very nice ride and lots of friendly people on the trail. 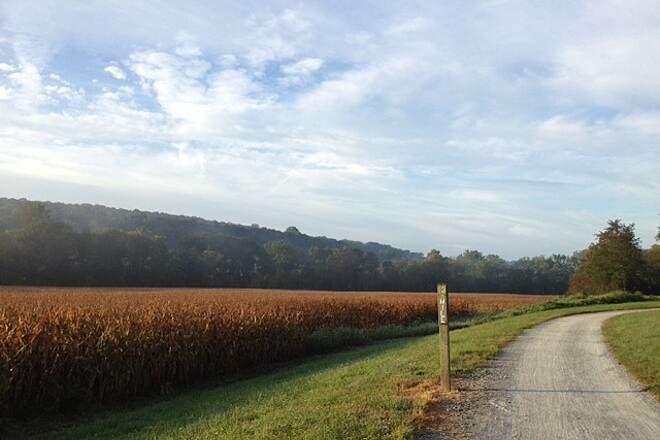 I will rode this trail again as the season changes to view all of God's glorious colors of Fall. 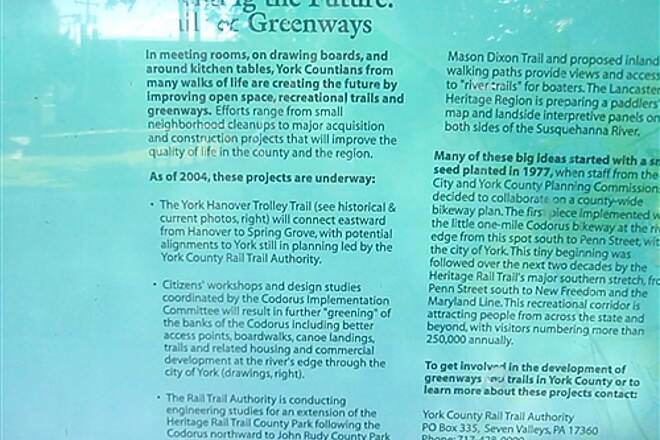 I live in York County and have biked this trail at least 100 times. 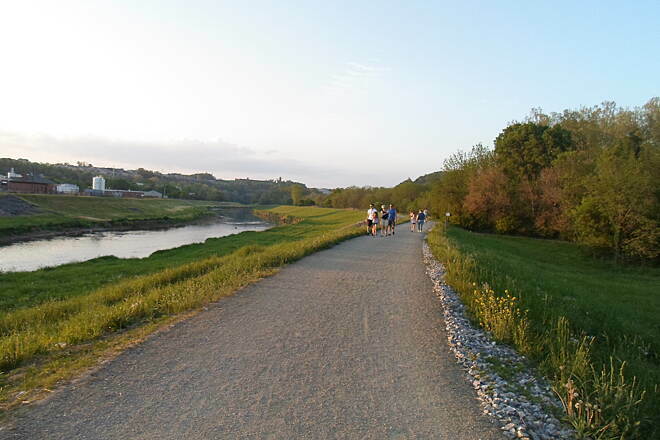 The grading on the trail is relatively flat, however, I suggest starting in Seven Valleys, PA and traveling south to New Freedom and then turning around and heading back. There is a slight grade of about 1 to 1.5% heading south. 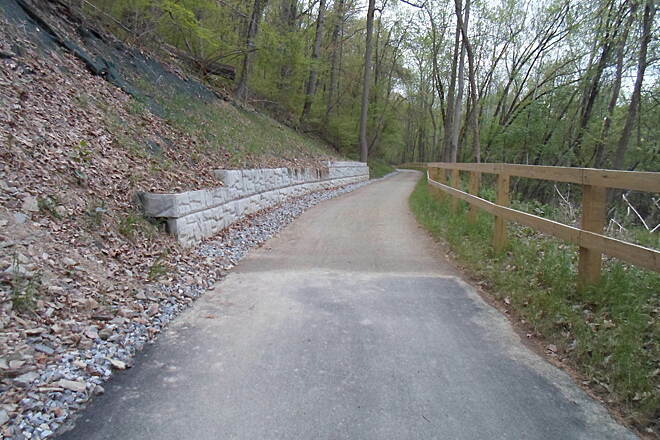 With a heavy mountain bike and the crushed limestone for resistance, you can definitely tell you are you going up hill. 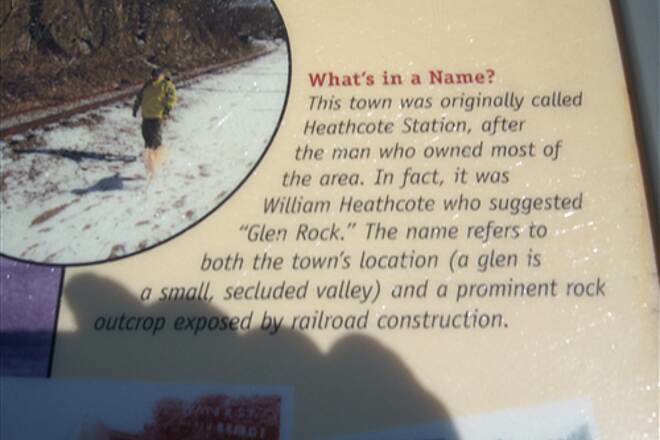 If you start in Seven Valleys and head south, it is flat until you get to Glen Rock when you get that slight grade. That grade continues until New Freedom. When you turn around it is downhill. Valleys and go to the last exit on the trail you will do 10 miles and then it is 10 miles back - so that is a nice 20 mile ride. North of Seven Valleys is pretty much flat and you can ride north all the way into the city of York. The city is a great place to visit on the weekends - the trail takes you right into downtown, with restaurants like the White Rose, and on Saturday mornings Central Market. 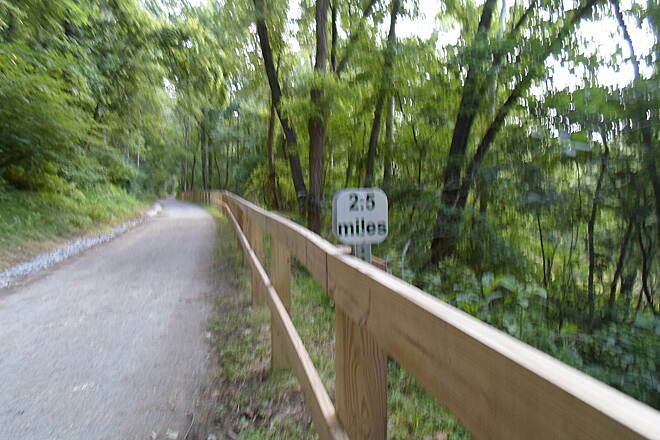 Mile marker 20/21 takes you through an area of the city between Kings Mill and W. Market Street where you should not stray off the trail - as that is not the greatest neighborhood. Penn Park which is a few streets over on West College avenue is NOT the kind of park you want to walk through no matter how nice it looks from above on Google Maps. There is a cool restaurant in Seven Valleys called Serenity Station - but they have limited hours now that they are trying to sell the place so I would call ahead and make sure they are open. 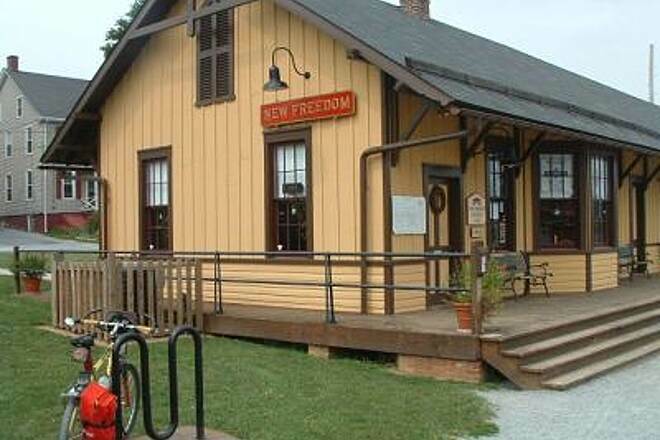 There is a bathroom at Serenity Station in Seven Valleys (if they are open), a bathroom at Hanover Junction, a port-a-potty in Railroad and a bathroom in New Freedom (along with a little restaurant as well). 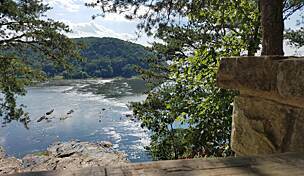 You can ride the trail into Maryland - but New Freedom is kind of the top of the trail - it is all downhill into Maryland - probably 2% or 3% grade - so remember you have to come back up! I did this trail last week and had a great ride. About a month ago I did the Torrey C. Brown Trail and even though the two trails and connected they a so different, both are very good rides. I road from Freedom MD. all the way to York PA. 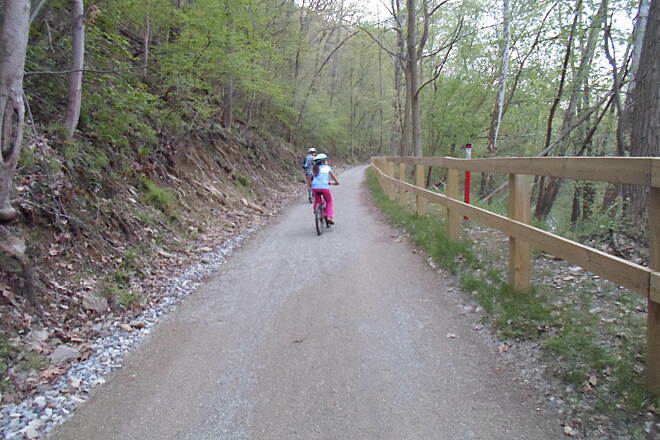 This trail is family friendly and I saw quite a few Road bikes. There is a canape most of the way so it is a great ride on a hot sunny day. 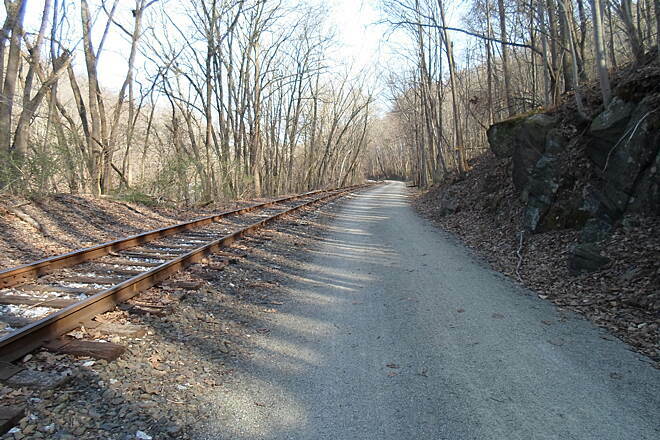 On the way back from York there is a very step grade from Glen Rock to New Freedom about five miles, back in the day they needed a helper to push the trains up the grade. 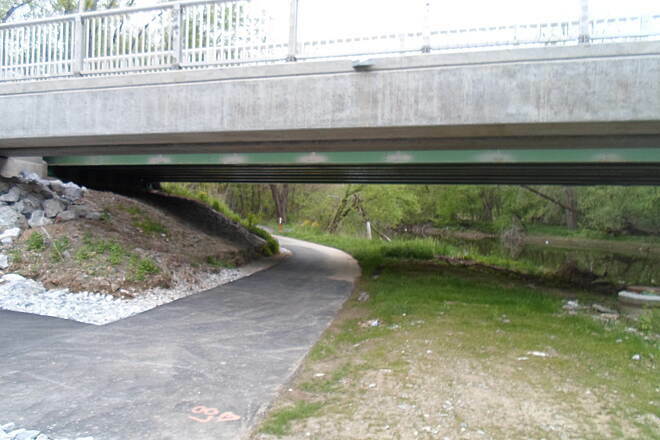 This trail is a gem and is really well maintained no standing water at all. From New Freedom all the way to York there is a working rail line and they have done a great job a all the crossing points. I did this on a Friday after noon and there was a fair amount of traffic on the trail. 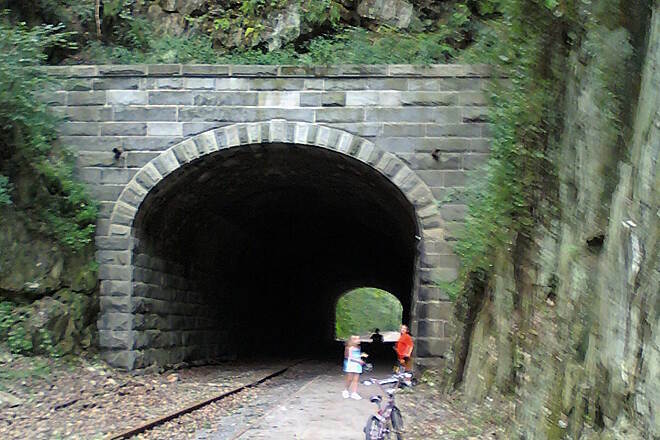 The high point of the ride for me was the Howard tunnel, it is the oldest RR tunnel in continues use in the United States. 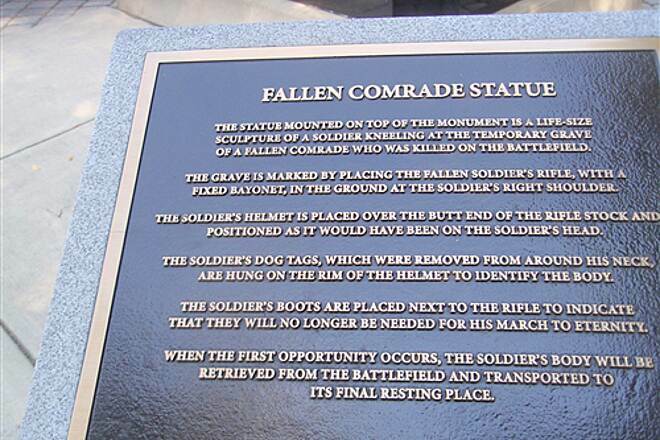 There a lot of historical markers along the trail and if your a history buff you will love them. 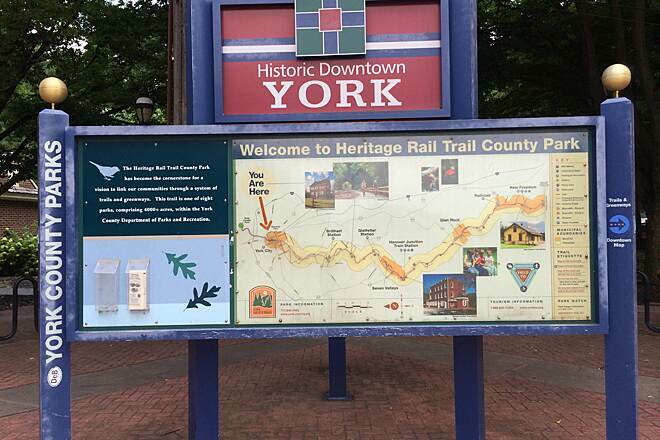 My eleven year old son and I have completed the York Heritage Rail Trail in three rides over the last two weekends, and the experience has been just grand. 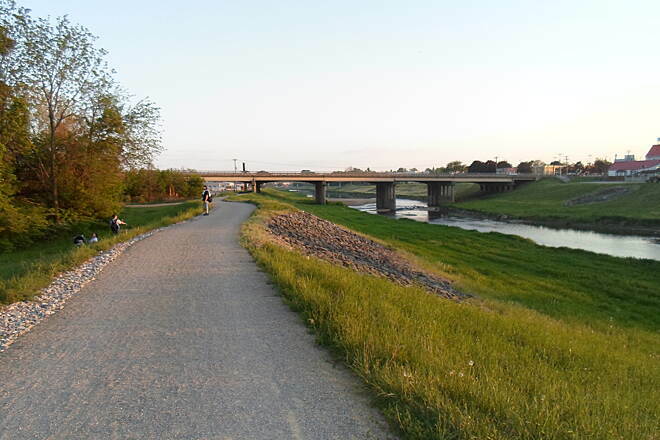 This trail has it all...a wonderful surface for cyclists and walkers, many concrete bridges with great views, a wide horse trail, great signage, historical makers, and so much more. 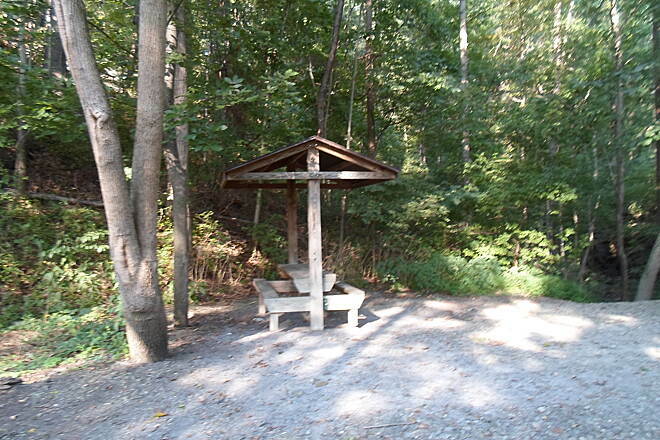 It has frequent covered picnic tables and benches, as well as parking areas with the necessary amenities. 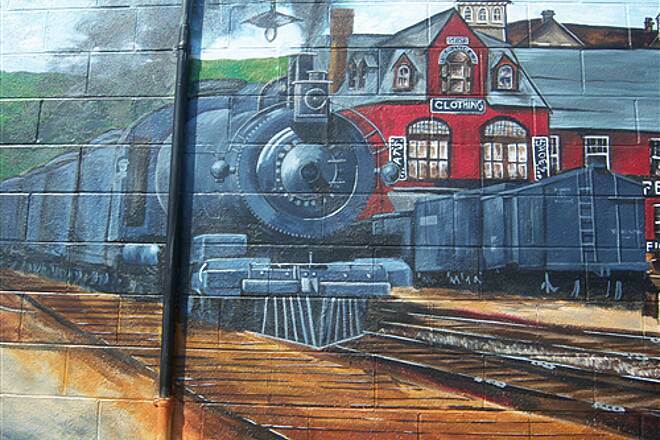 The YHRT has museums, murals in almost every town along the trail, restored train stations complete with old train cars, a wonderful 100M tunnel, many restaurants within site of the trail, and even a cafe virtually ON the trail at Serenity Station. 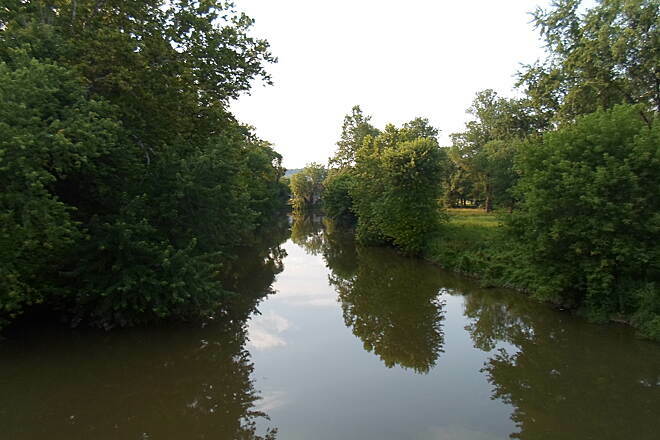 In York city the trail runs along the Codorus Creek, and is paved and lined with trees. 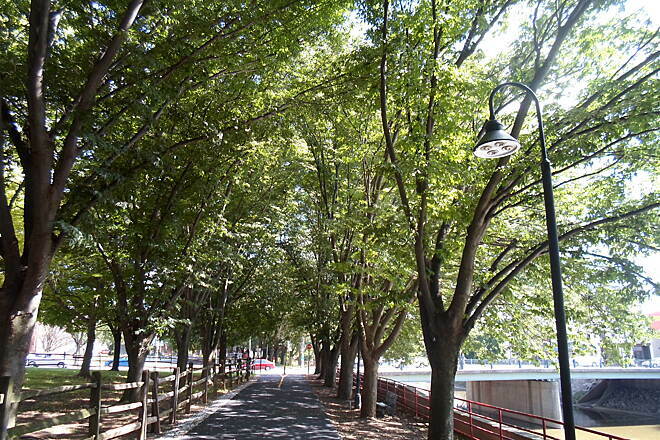 If I squint my eyes it reminds me of Rome along the Tiber river with its many bridges and tree lined path. 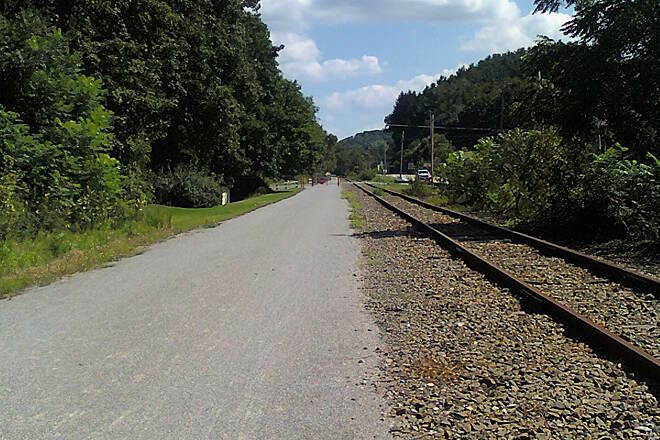 OK, I had to squint really hard, but still, it is a beautiful rail trail end to end, with many, many great photo opportunities. 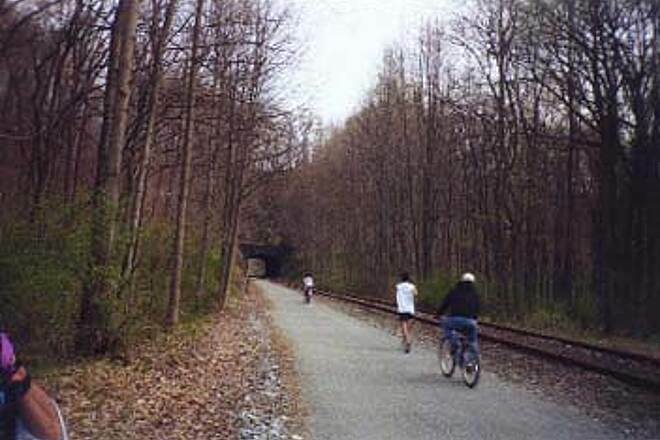 The trail is convenient to Philadelphia, Baltimore, Harrisburg, and Lancaster because of its proximity to the major interstate highways of 81, 83, 15, 30, and 76 (PA Turnpike). One note...the guide literature says that the elevation only changes about 450 feet from New Freedom to York, but be aware that MOST of that elevation change takes place between Glen Rock and New Freedom. 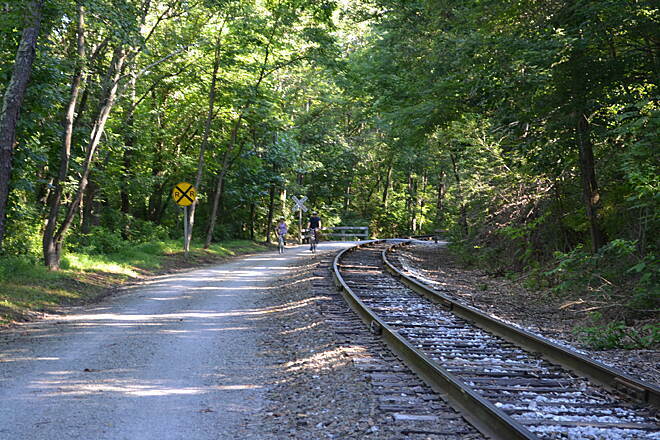 Not that it is a tough climb (it is a rail trail after all), but it is continuous and may put you in the bottom half of your middle sprocket. On the other hand, the climb is very picturesque, towering over the surrounding landscape in places, and wonderfully quiet - except for your own, heavy breathing. 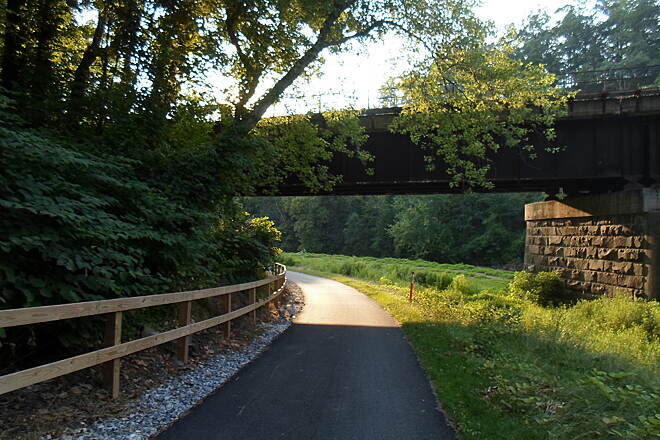 Stretching through picturesque southern York County, the Heritage Rail Trail County Park is one of the best greenways in this part of the country. 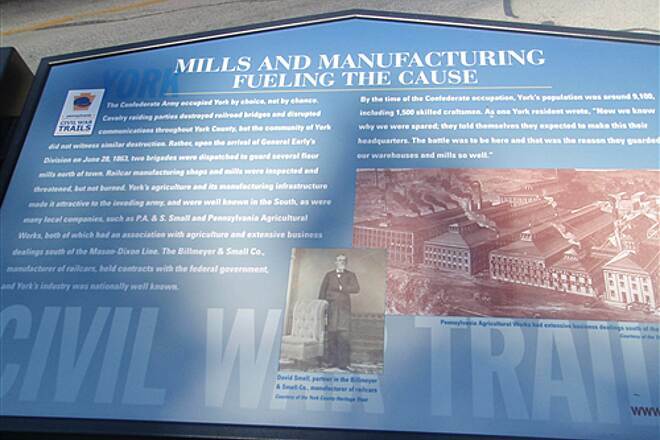 After starting in downtown York, the trail follows the Codorus Creek to the city limits, then passes several industrial areas, which, while not aesthetically pleasing, nonetheless highlight the city's heritage as a manufacturing hub. 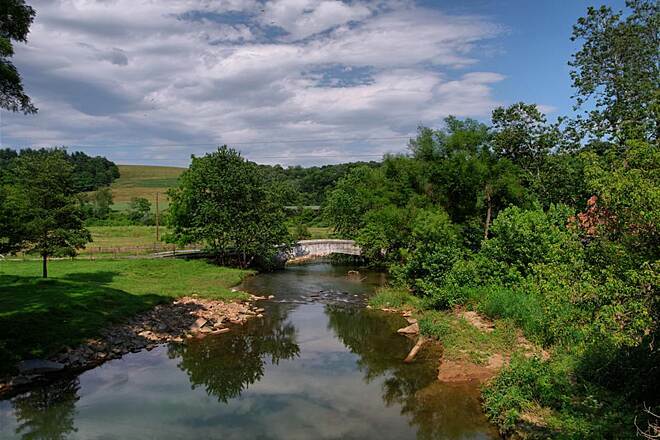 Factories quickly give way to serene woodlands, bucolic farms and small towns a little further south, and dominate the trail's landscape for the remainder of the distance to the Mason Dixon Line and beyond. 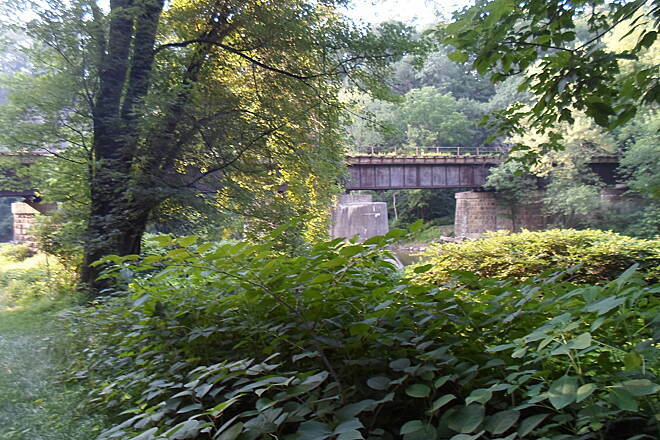 Highlights include the pictureqsue viaduct over Twin Arch Road, historical Howard Tunnel and the restored train stations in Hanover Junction, and New Freedom, and the beautiful, aptly named village of Railroad, which is nestled deep in a wooded hollow and features numerous old buildings. 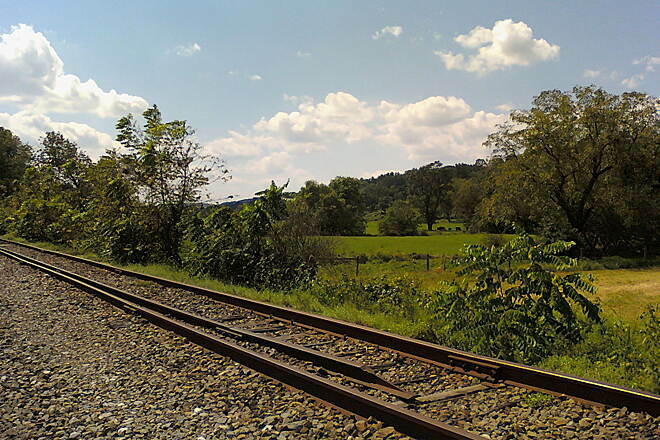 Although the rail line that parallels the trail is currently inactive, a company is currently purusing the possibility of opening a tourist train in the next couple years, and there have also been proposals to revive freight service. 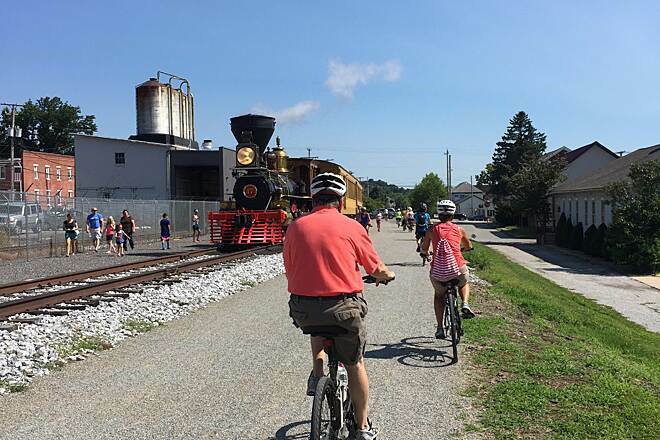 These plans, if successful, should not affect trail use, and, to the contrary, will be another great addition and tribute to the corridor's railroad heritage. 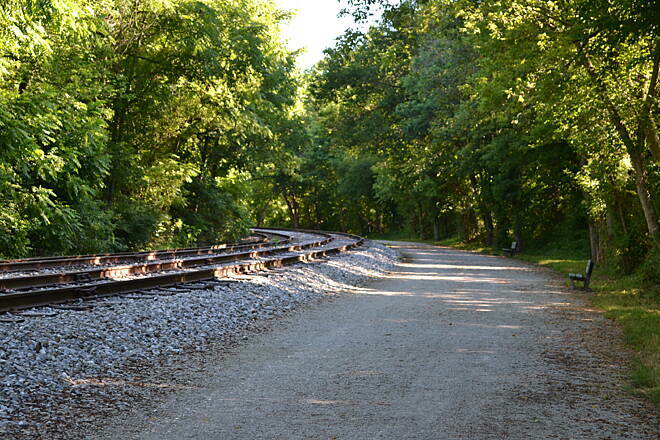 We took a ride on this trail, the Friday, over the 4th of July weekend. We started out in York so the scenery does not start to get nice until the first stop on the trail, although it was still a nice way to start the ride. 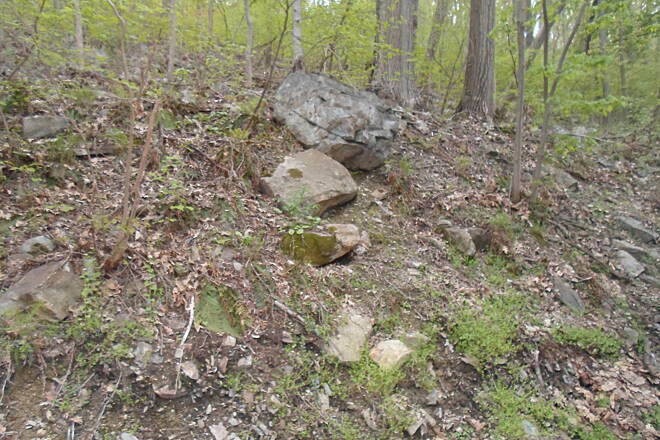 This is pretty much a mountain bike trail as it is crushed stone all the way to the Maryland border. 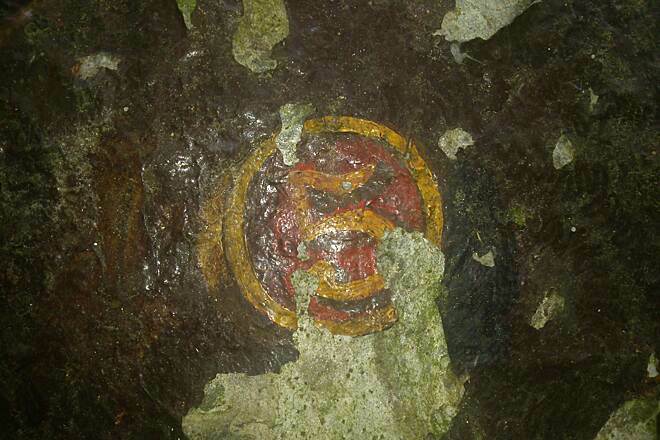 The trail itself was well taken care of, clean and well marked. 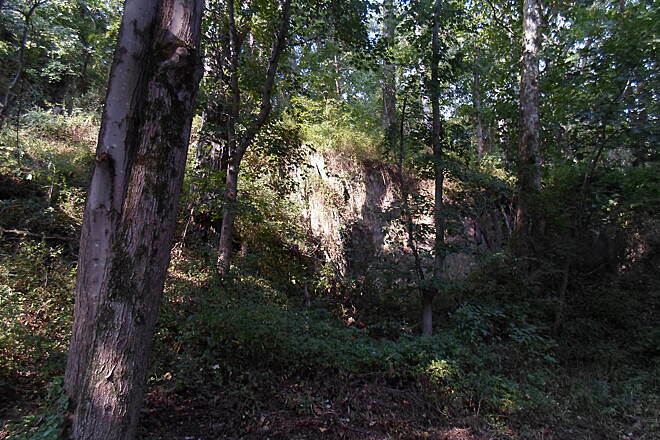 Most of the trail is tree covered with sections that open up to completely no cover at all. It was really nice to ride past the little towns the trail crosses and to hit up the one rest area with food/water, as we ran out of water on our return trip. 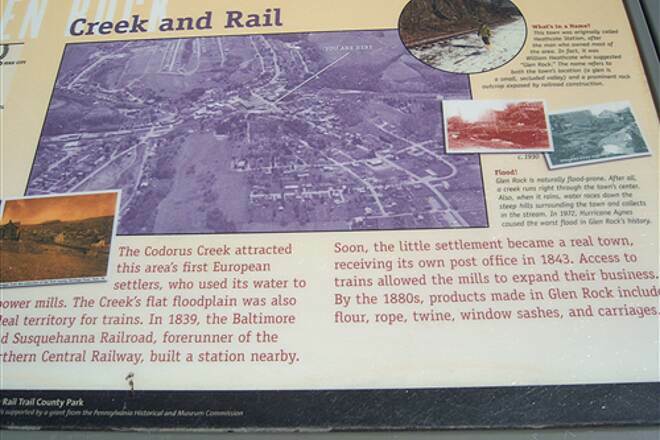 If you have the time as we did drive to the Railroad or New Freedom parking lots and ride the trail into Maryland. Its packed dirt but you get to ride downhill and the trail is narrow with shrubs on both sides before it opens up about a mile or so. The ride back is up hill and seemed to take forever so be prepared. 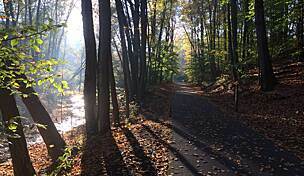 I use the trail 4 or 5 times a week to jog or bike. 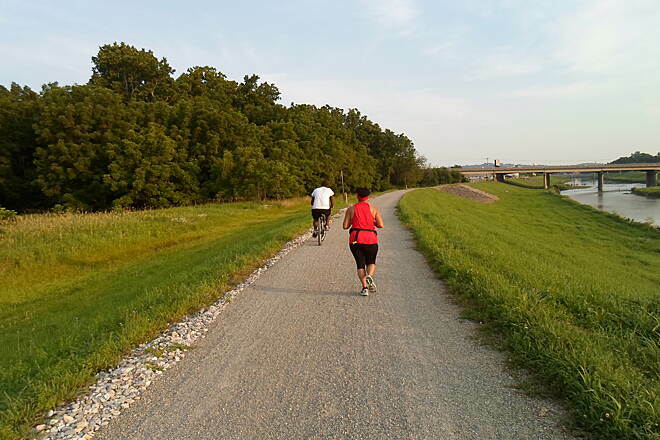 Everyday I see more and more people enjoying the lovely scenery and peacefulness of the trail and at the same time doing something good for their health. 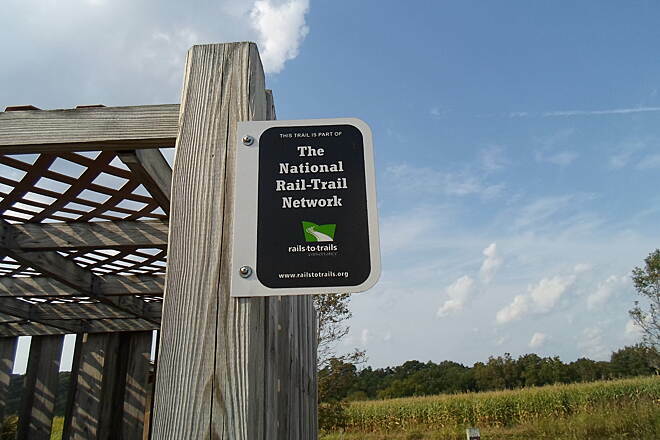 I have a question because on this site it says there is an active rail line and there have been no trains on this trail for over 7 years and the last train was a dinner train that ran only on weekends. This went out of business. 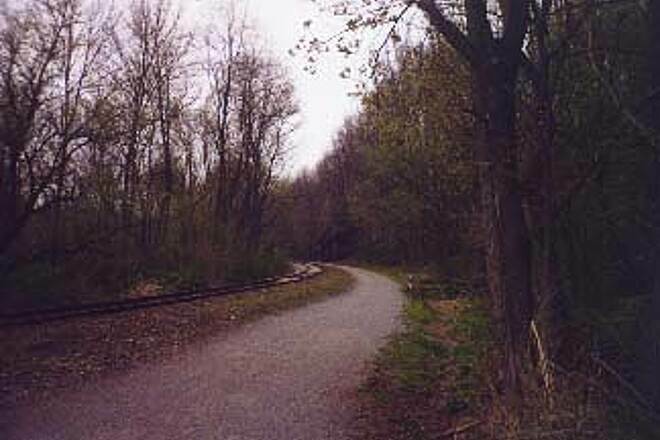 This is of concern because if they started to try and revive the rail line, this would greatly impact the trails safety and quality. 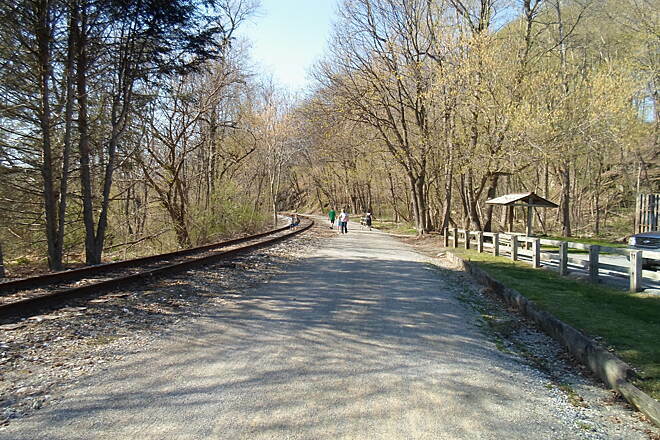 This trail is well maintained (at least the PA portion, I've not yet gone below the MD line); and the railroad museum and cafe in New Freedom is a welcome and comfortable rest stop. 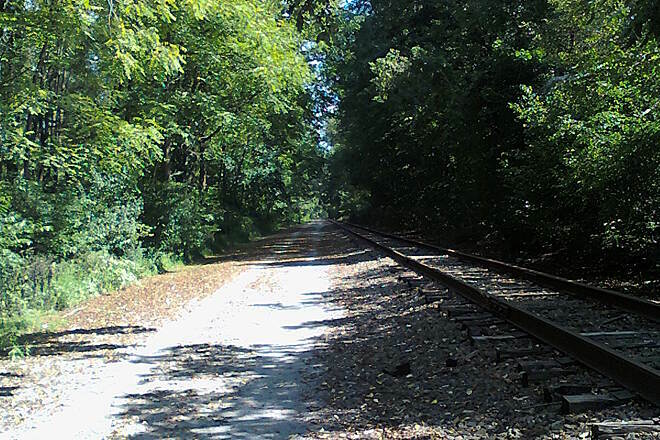 Like all railroad lines, the trail is flat, so I think it can get a little ho-hum for long bike rides, but for walking or running it's great - partly shaded, interesting scenery, and used by both locals and visitors. 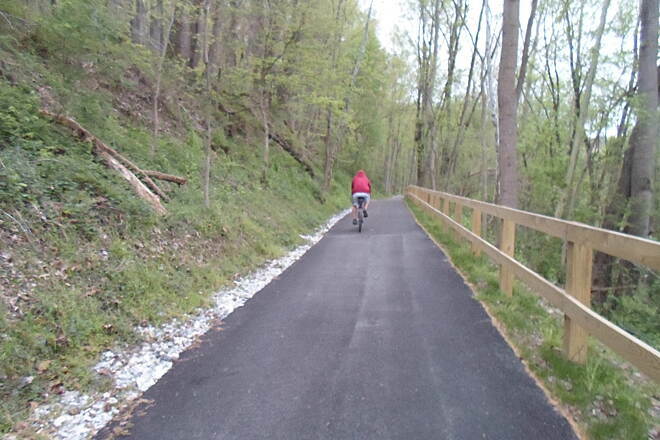 "This trail is one of the best maintained in the state. 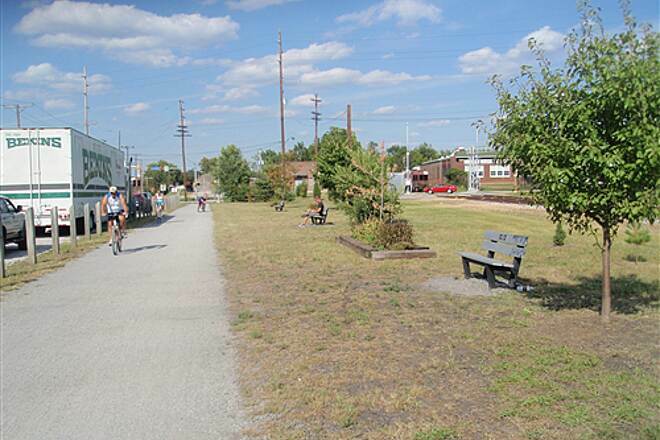 I started at Railroad and biked up to York. 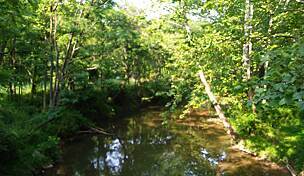 What I enjoyed about the trail was the scenery that wound through several hamlets and crossed several creeks. I especially enjoy the cafe that is about half way between the state line and York. 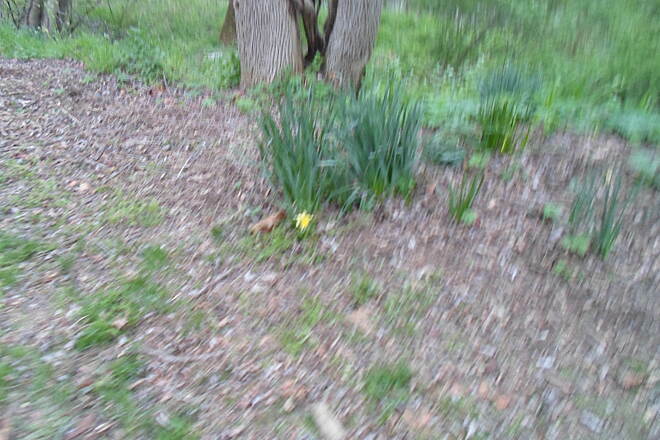 I saw little in the way of four-legged wildlife, but did see a few orioles nd blue jays. 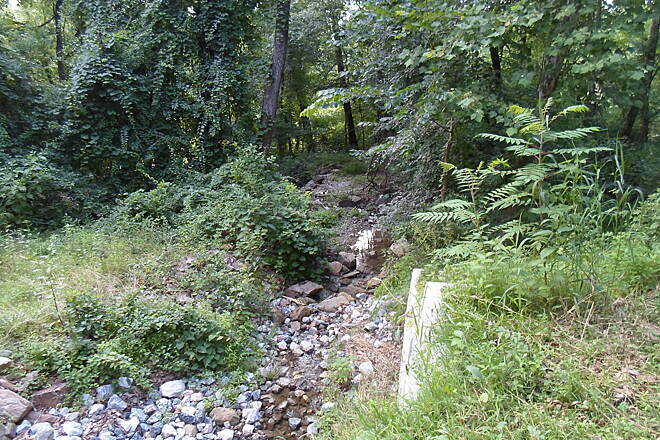 South into Maryland, it is still a decent trail, but one can tell that it is not as well maintained as the northern part of the trail." "I agree with all the previous reviewers. 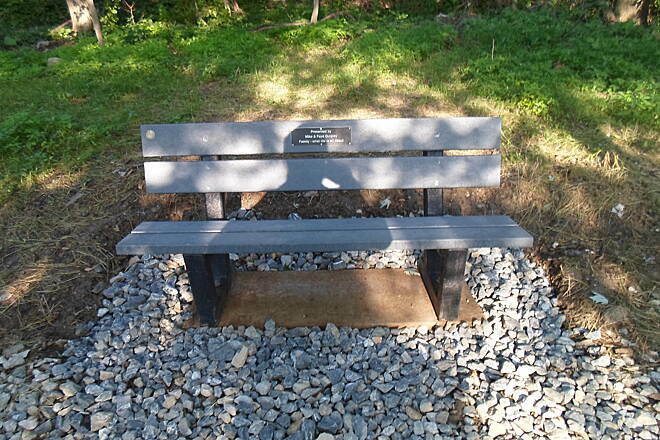 The Serenity Station was a wonderful stop. Unfortunatly, we did make it to New Freedom. 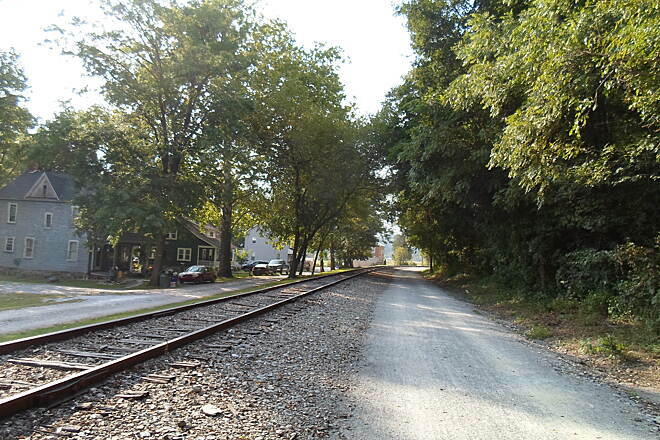 We didn't have time to go down and back, so we went from York to Hanover Junction and back again. Kicking myself for forgetting the camera. It was a great ride." 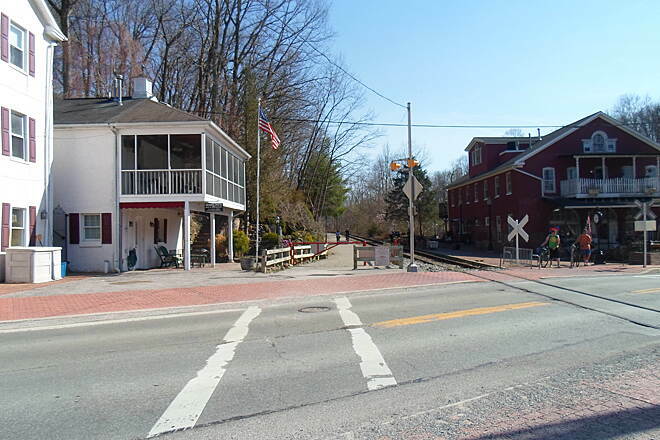 There also is a cafe at the old train station in New Freedom that looks nice, but we did not eat there since we had already eaten at Serenity Station." Oh yes what a very nice trail. I rode this trail around 4 years ago. I rode the whole distance. Me and my friend are from south Jersey. We drove to york pa. and parked. 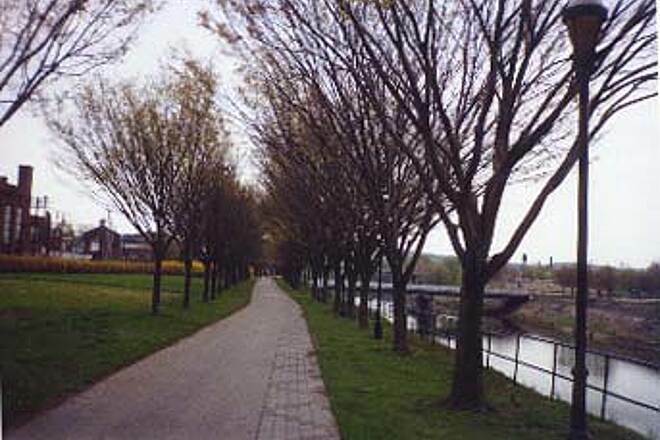 Then we got our road bikes ready and the rode to Marayland we rode on a Saturday and back ona sunday. 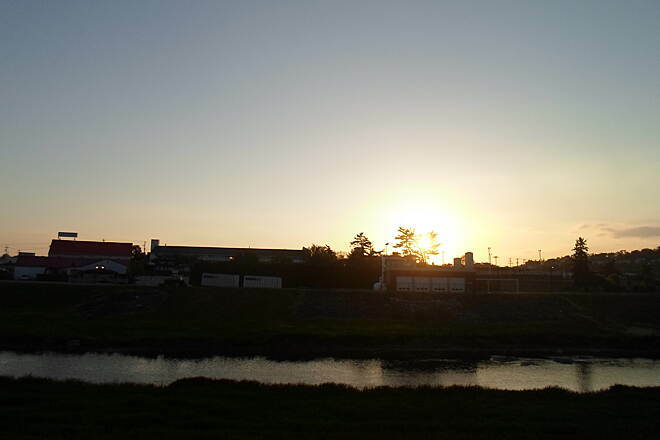 it was a nice summer weekend. not to hot and not to cold just perfect for a weekend ride. Overall the trail itself is in great shape, nice and smooth with no ruts or potholes...the trail gets used alot and the surface is really hardpacked and ""fast""..it'd be OK to use a roadbike on it. 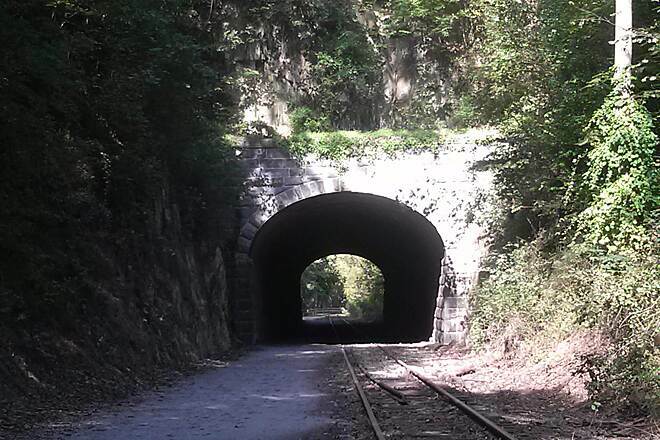 The three most distinguishing features about the trail are the Howard Tunnel at around mile 15, the railroad tracks running beside the trail for it's entire length, and the sheer number of road and railroad track crossings along the trail. 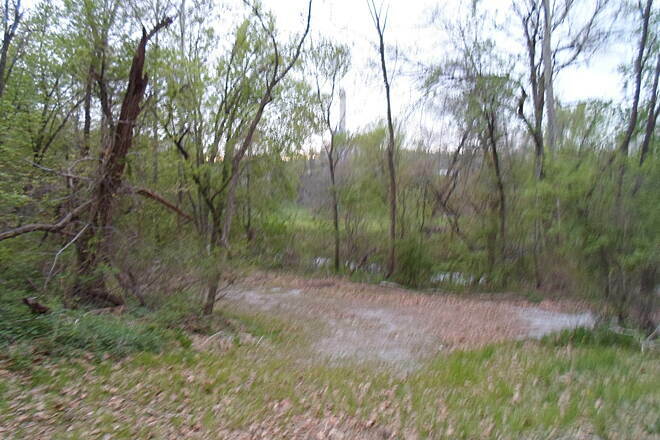 I didn't count the number of roads the trail crossed, but according to their map it looks like around 11-12 at least. 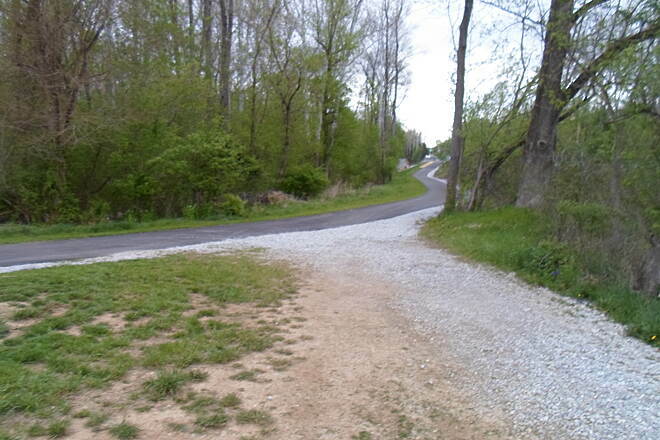 They are mostly 2-lane ""country"" roads, not that heavily traveled, but some have very limited sightlines. 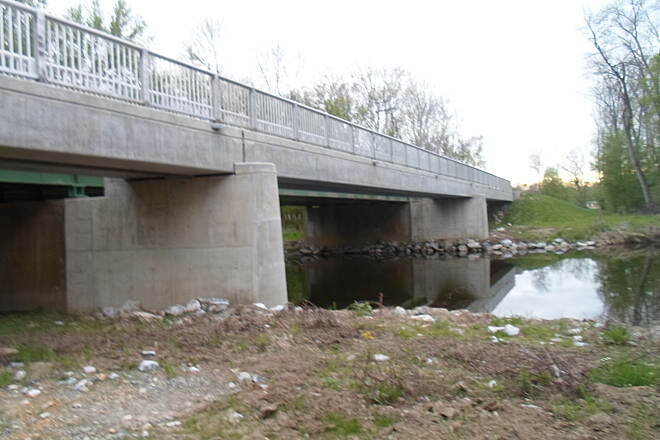 They recommend walking across the road crossings, and in some places this would be a good idea...especially the Indian Rock Dam Road crossing, I think the speed limit there is around 35-40mph and with limited sightlines it could be pretty dangerous. 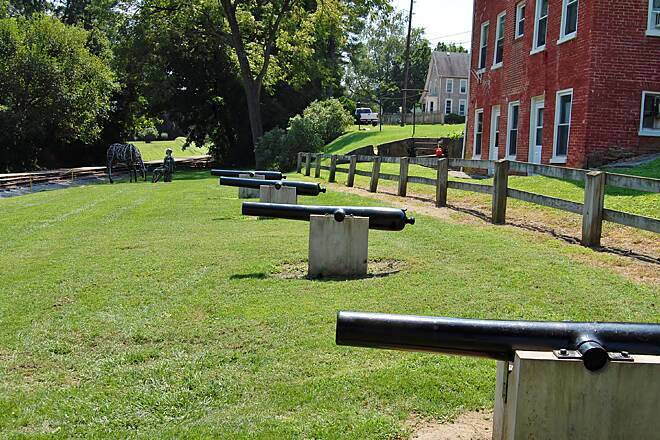 At it's north end (Mile 21.1)in downtown York the trail starts near the waterfront and some historic structures such as the colonial courthouse. 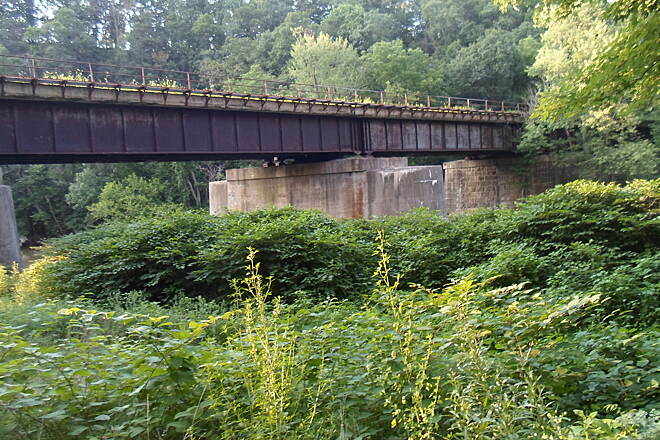 For the first 1 1/2-2 miles it goes through an industrial section of town, until it goes past a golf course....after the golf course the trail gets more secluded. 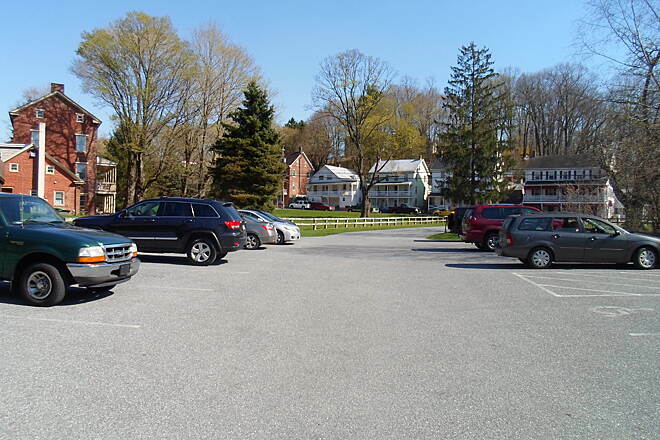 The Brillhart Station parking lot at mile 17 was the most popular place to park along the trail that I saw, lots of space to park there and it was only 2 miles away from the tunnel. This lot had a portajohn at it, and had maps of the trail available too. 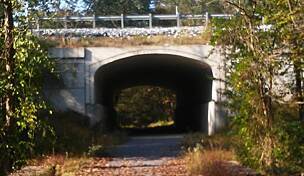 The Howard Tunnel at around mile 15 was fun to ride through, it's a short 300 foot tunnel so you don't need a light to ride through it. 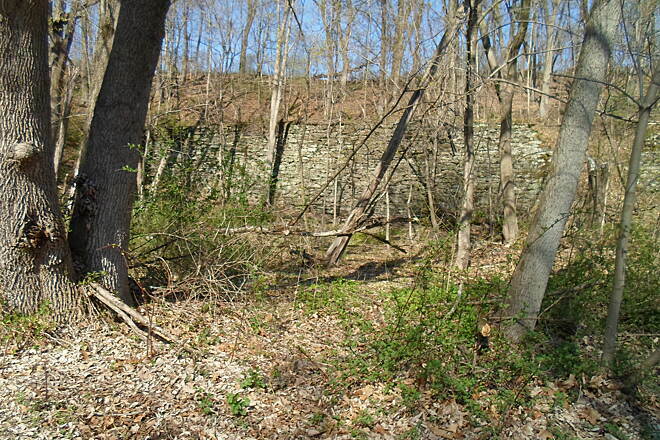 There is a National Register Of Historic Places plaque on the inside wall of it, and stones above each keystone marking it as built in 1840 and rebuilt 1866. 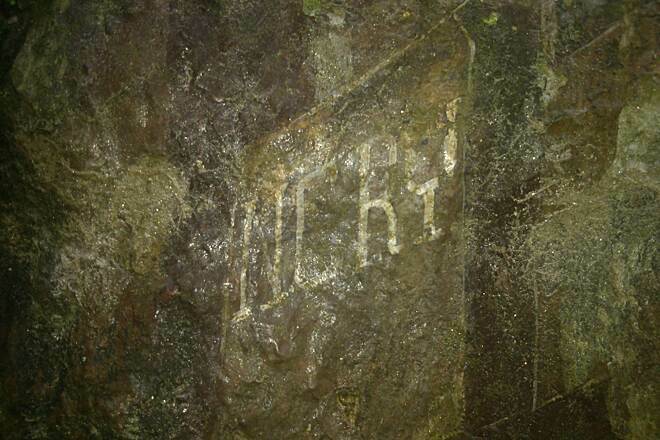 They have an historical sign describing the tunnel just to the south of it; they also have historical signs along the length of trail in other places describing the history of the railroad. After the tunnel the trail goes through the woodlands and past farms. 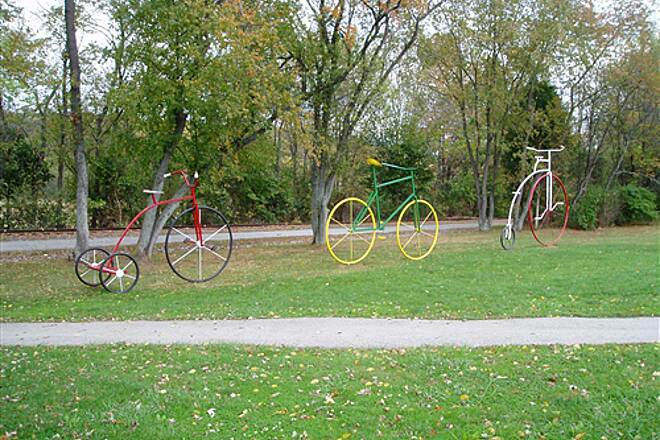 At Mile 11 there is the Seven Valleys trail parking lot, and right next to the trail here they have 3-4 giant sized metal bicycle sculptures. Just past Seven Valleys further south there is a really nice trailside bicycle rental/deli cafe/wellness center called Serenity Station, a good place to get something to eat or drink. 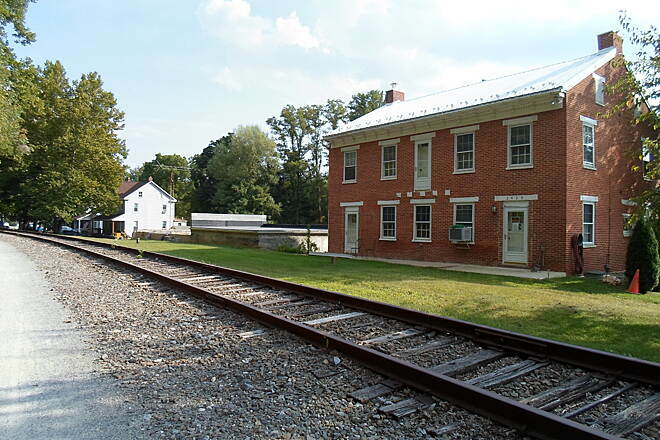 At Mile 10.5 there is the Hanover Junction Station parking lot, the station building has a ""real"" bathroom here, and some tables outside too. 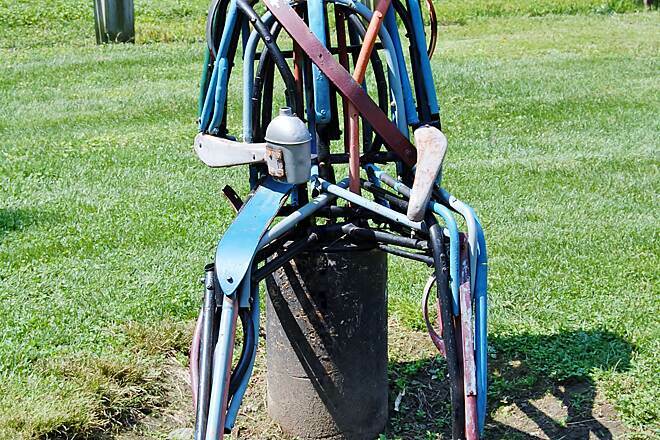 There is also a man and horse sculpture here made out of metal tubing and bicycle parts, next to the station. 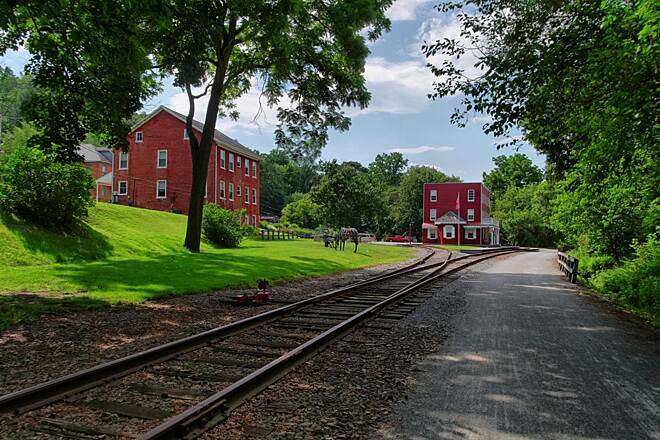 At Mile 6.25 in Glen Rock there's a gravel parking lot near the Glen Rock Mill Inn, and a bicycle shop right next to the trail. 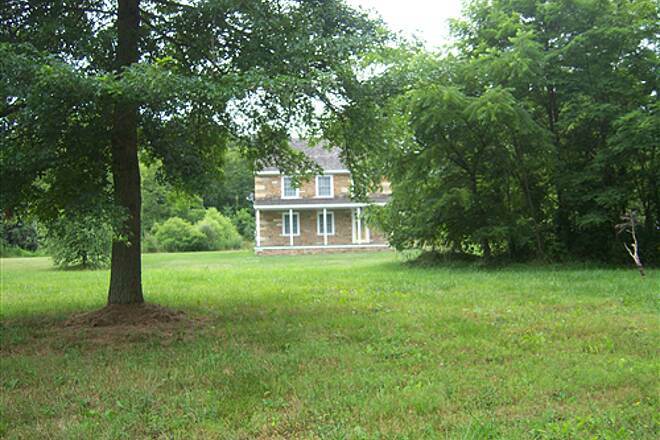 Further south in Railroad at Mile 3 there is a paved trail parking across the street from the Jackson House Bed & Breakfast. New Freedom at Mile 1.5 was somewhat of a disapointment from the last time I visited it. 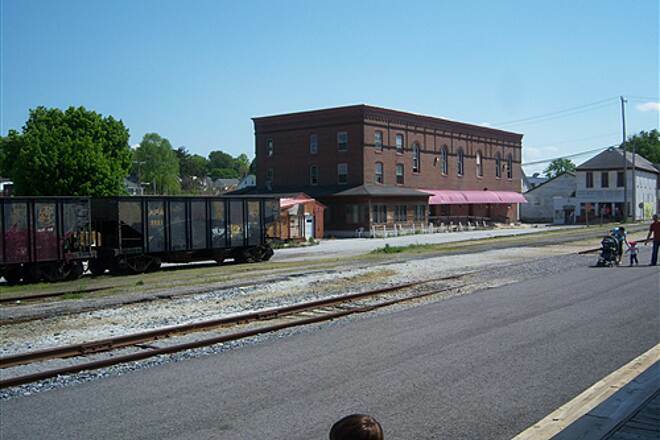 Last time I was there they still had the tourist railroad (that ran to York and back) operating and you could ride past the railroad cars in town. 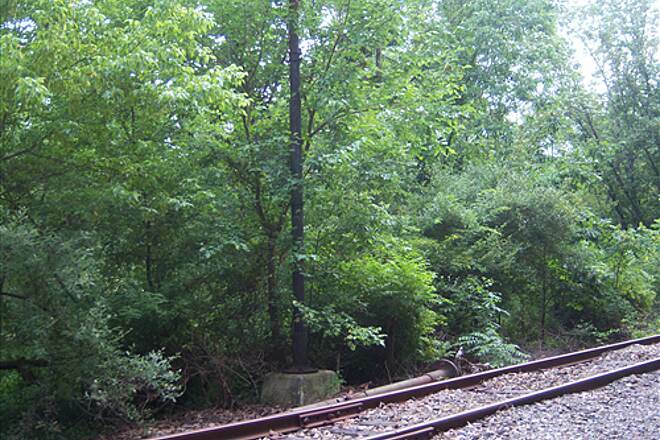 Now, the tourist railroad is no longer in business, and the tracks are empty. There is however the station there which has been converted into a nice cafe, and there are two restaurants right next to the trail in town. 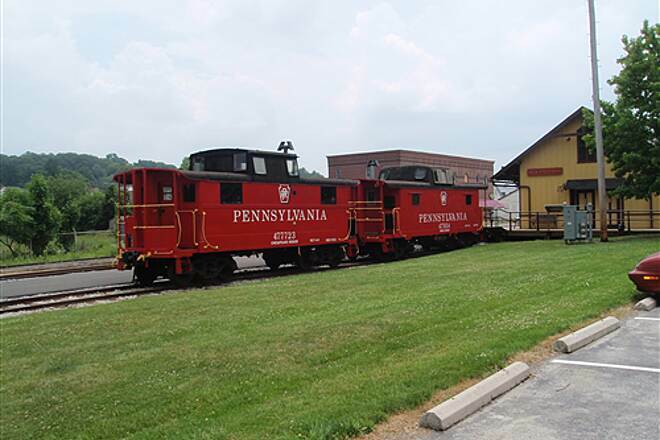 There is also a restored caboose next to the station, and three old dilapidated cabooses near the trail. Heading south out of New Freedom the trail goes downhill at around 1-2% grade until it reaches the Mason-Dixon Line. 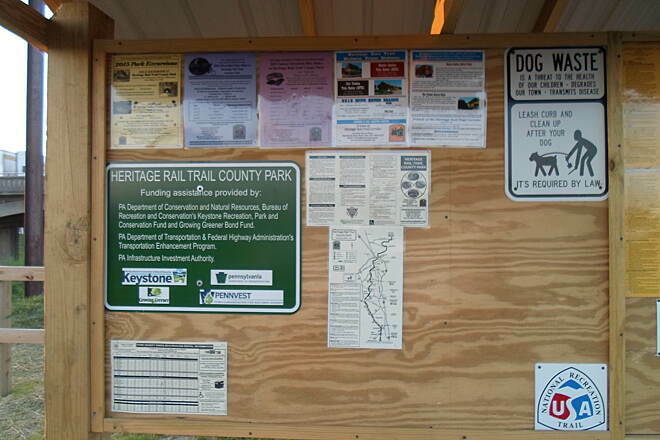 Here, they have a small pavillion setup with maps of both the Heritage Rail Trail heading north, and the Northern Central Railroad Trail heading south into Maryland. 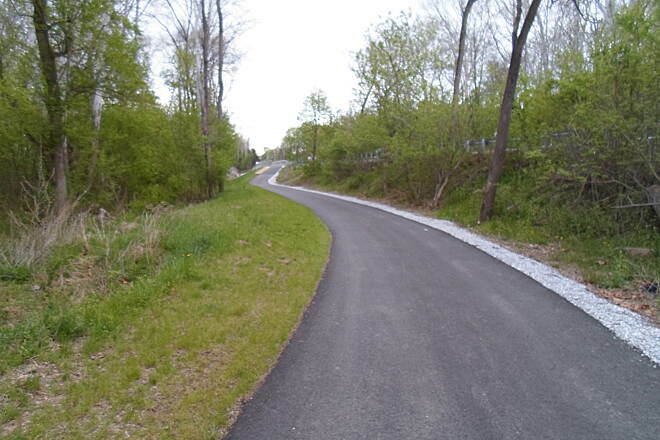 The Heritage Rail Trail has a very slight uphill grade heading from York south towards New Freedom. 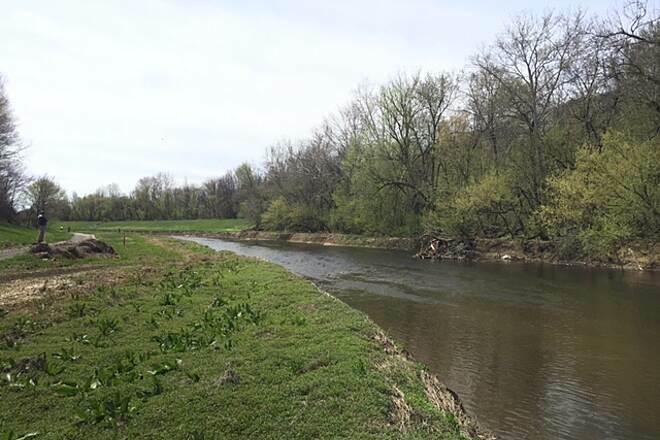 I barely noticed it starting out at Brillhart Station and going down to New Freedom, but could feel it was easier pedaling on the way back and heading north on the trail. " 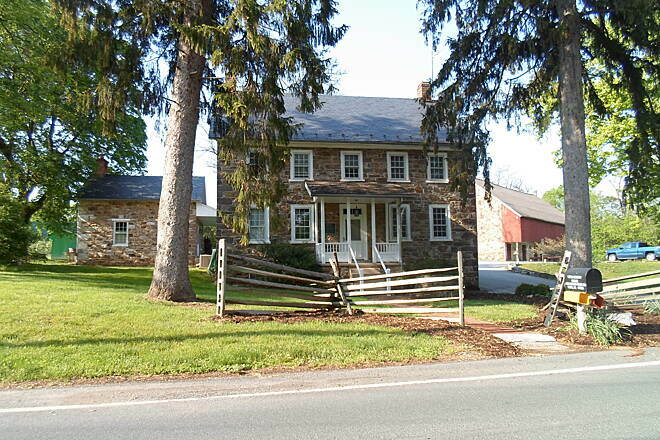 "Fabulous scenery through woods and old farmland, great B&B at halfway point in Railroad,PA (Jackson House)." 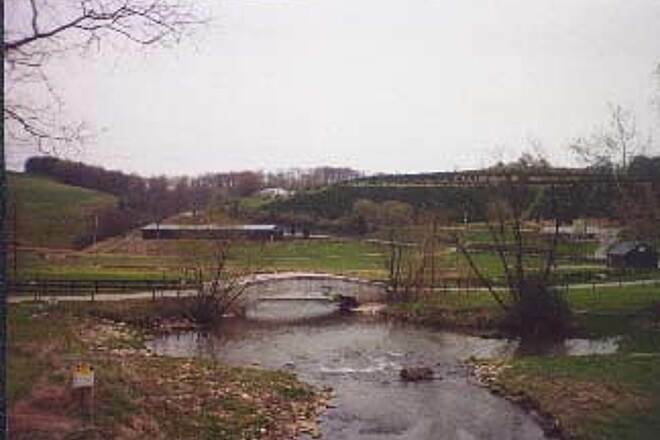 "Opened Serenity-Station on 5/6/05 between mile marker 11 & 12 in Seven Valleys. 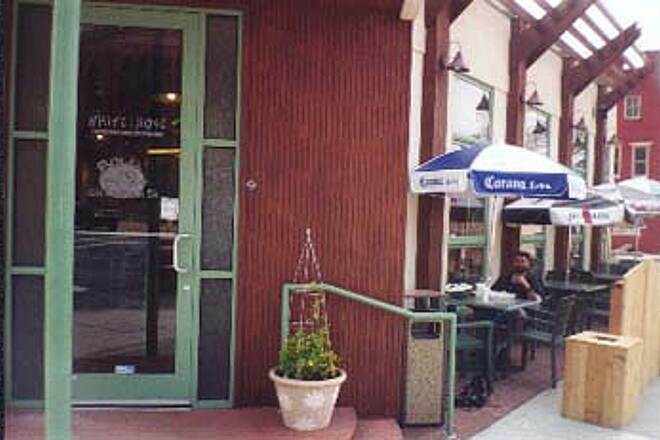 Great place to break for a drink, food, or snack [formerly Elmer's Grocery]. 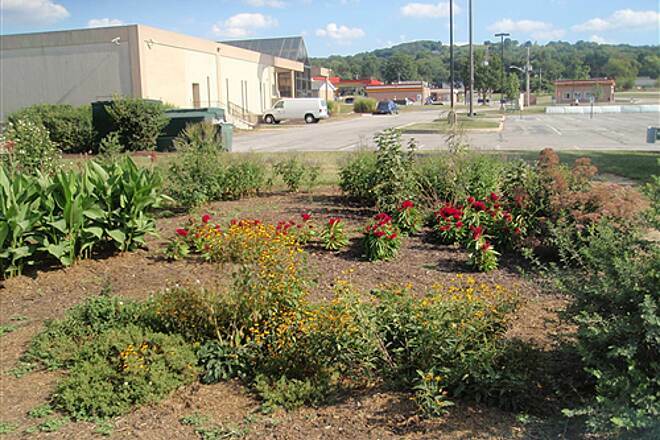 Also have a bike shop for rentals, sales, or repairs; and a Wellness Center for chair or full massages. 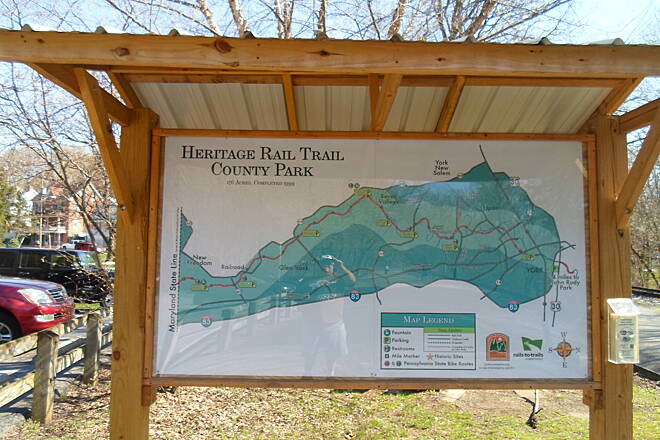 Check us out when riding the Heritage Rail Trail!" 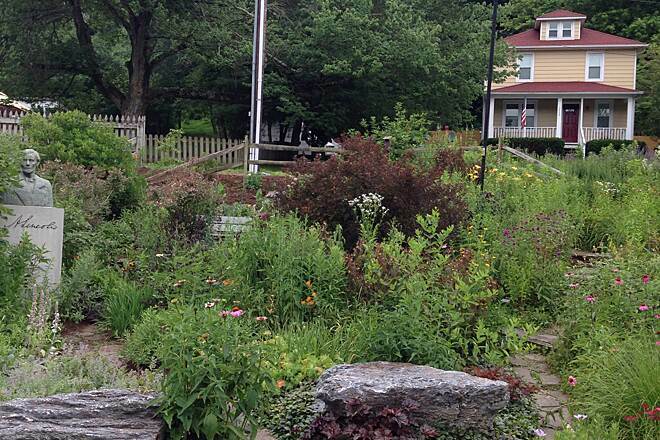 "In Seven Valleys PA there is a small rest stop that caters to trail users. 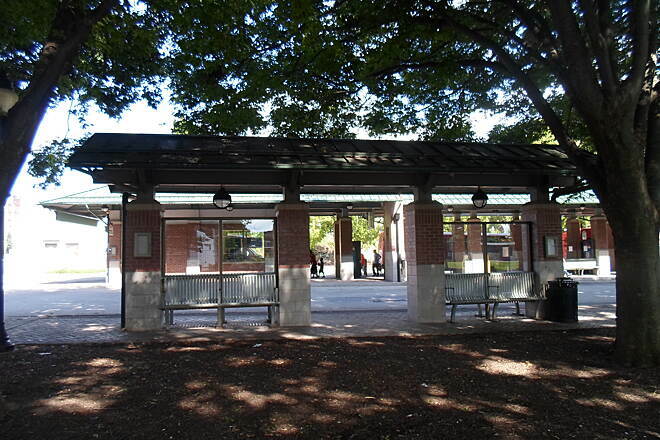 It is called Serenity-Station. The owners are very nice and the food is great. They have everything from meals to ice cream, again they were great." I found this trail to be just what the doctor ordered. 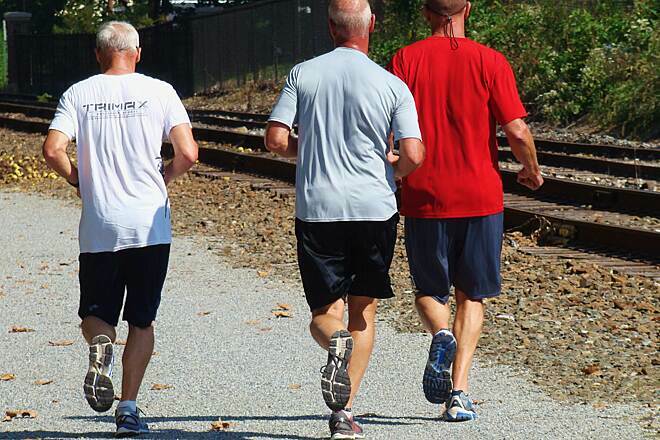 It's easy enough for the family and yet demanding enough if you set a pace that causes you to work up a real sweat. I would ride the trail in good weather 3 times a week and put on about 100 miles a week. 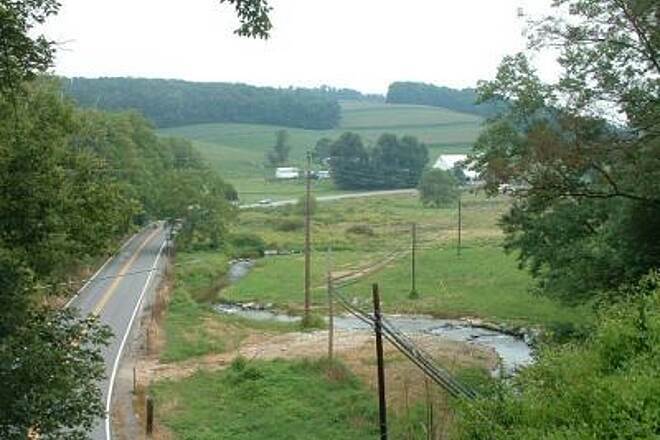 I have also done the Maryland side and it is also a great place to ride. 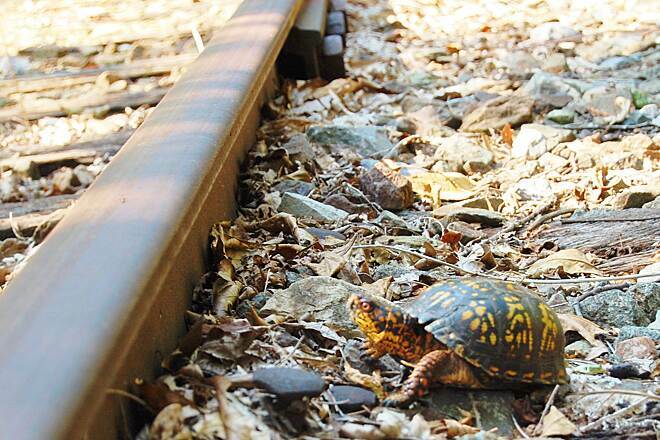 "From York, PA to Ashton, MD, I found the entire trail to be delightful. Lots of variety was what pleased me most. 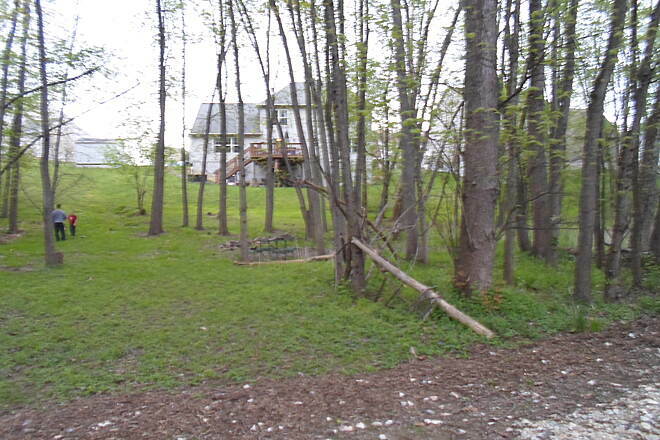 Woods, farms, streams, towns, backyards, frontyards, wildlife, solitude, hustle and bustle, historic buildings, etc. 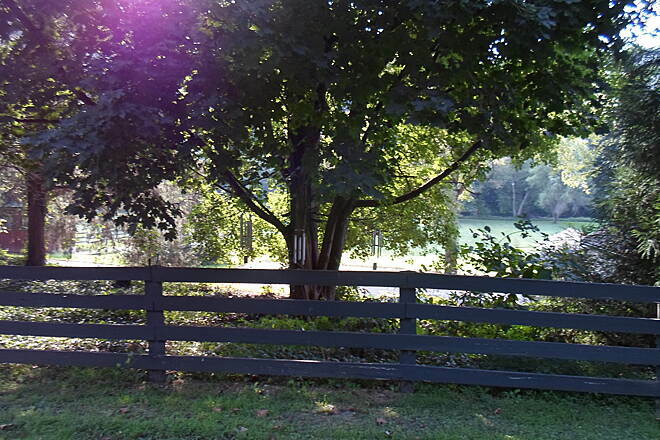 The scene and scenery keep changing. 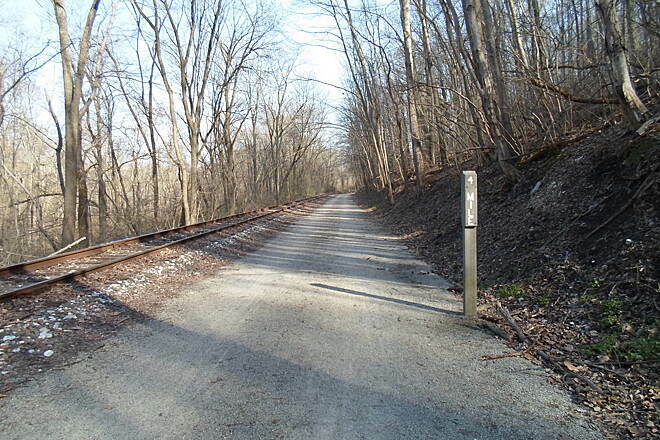 The trail surface is excellent and the gentle grade up to New Freedom from north or south is easy for beginners. I rate this trail A-1." 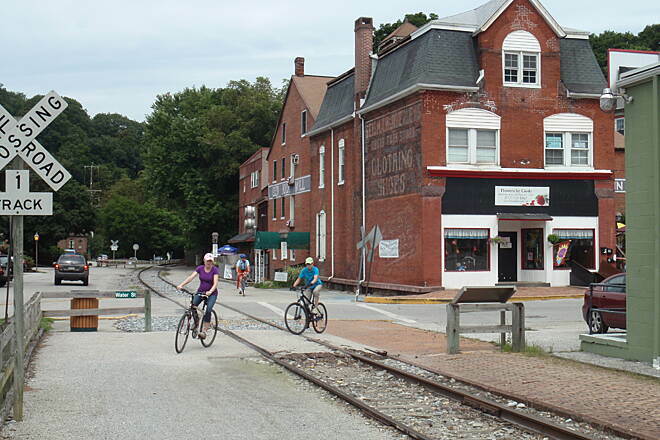 "I rode from Freeland, Maryland, to Hanover Junction and back this past weekend. This is a great trail. 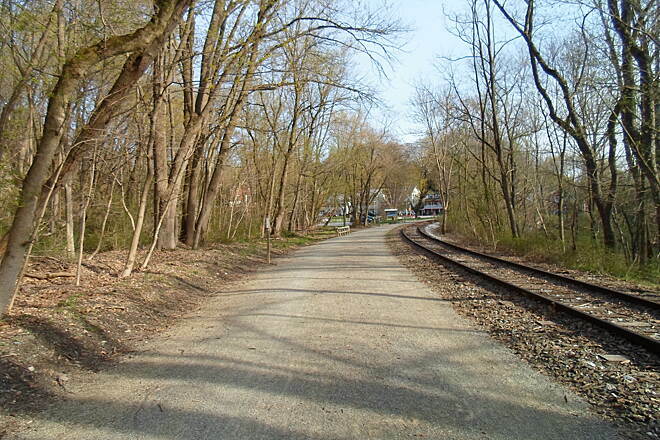 It's uphill to New Freedom and then generally downhill to Hanover Junction. 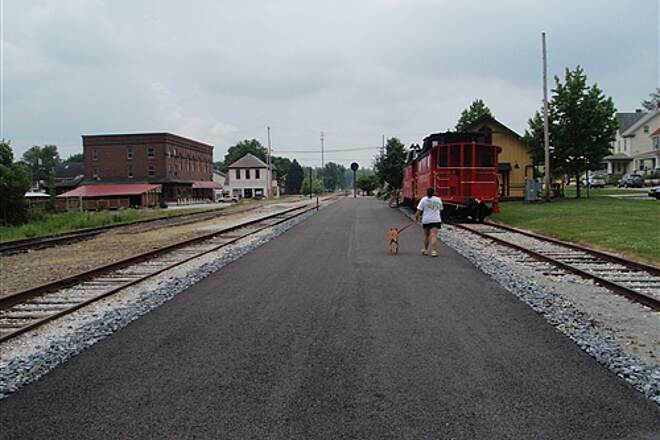 The surface is pretty good throughout and there are nicely restored stations at Hanover Junction and New Freedom (with a small restaurant). 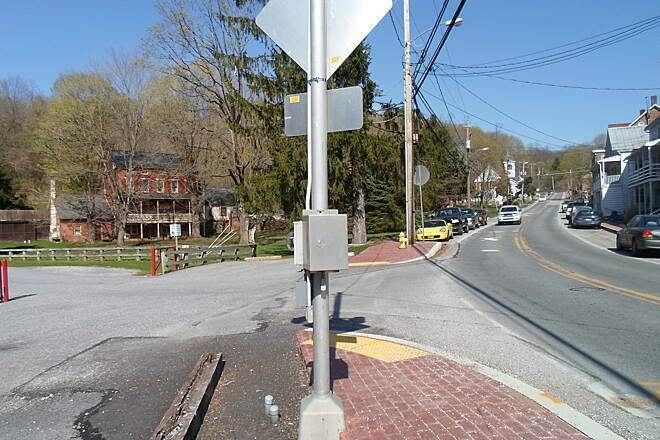 Be careful at the several busy road crossings, some of which have limited lines of sight." 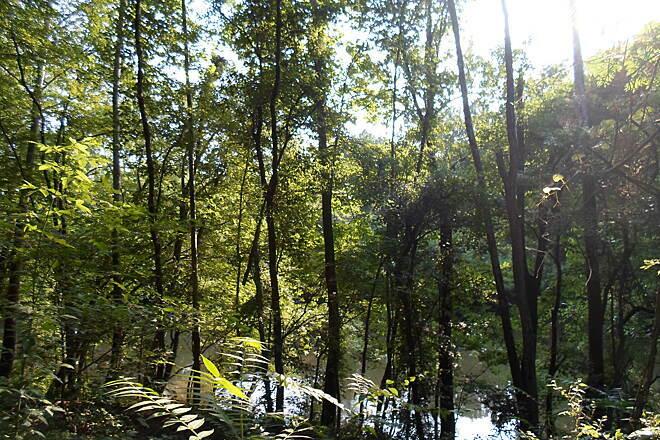 "This is a great trail. 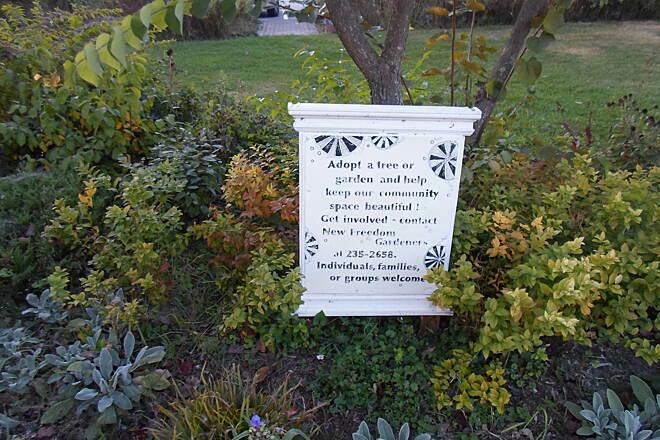 All beautifully maintained and a lovely crushed stone, all-weather surface. 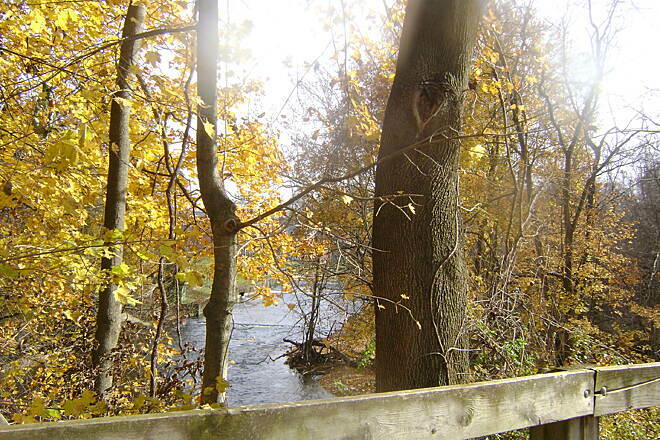 Great scenery all the way and right into the heart of York. 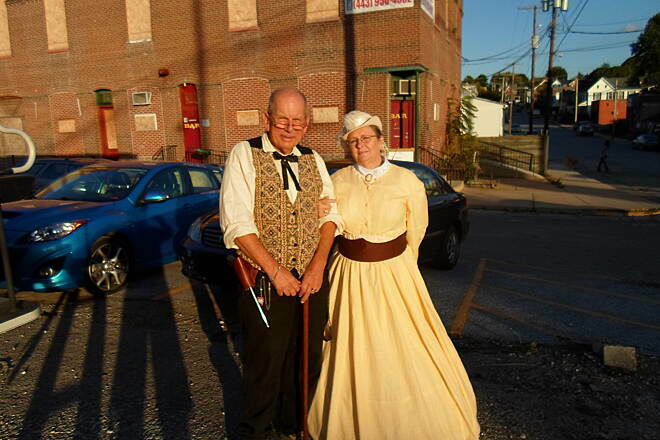 I parked at Hanover Junction for a wonderful 20-mile round trip north to York." 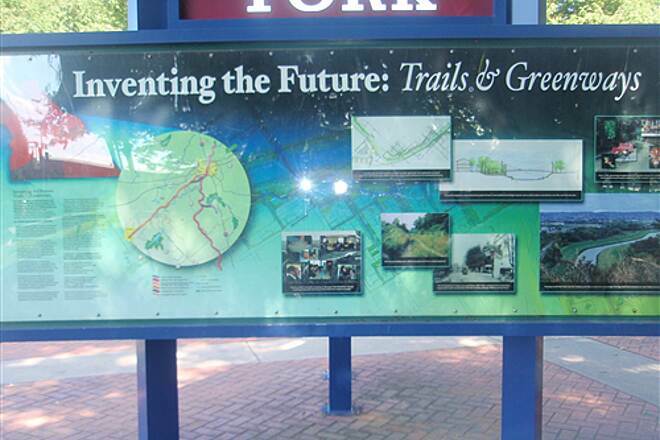 "We road this trail on May 25, 2003 and had a great time. This was our first trail ride. The trail was in good shape and wide enough to ride side by side in most areas. 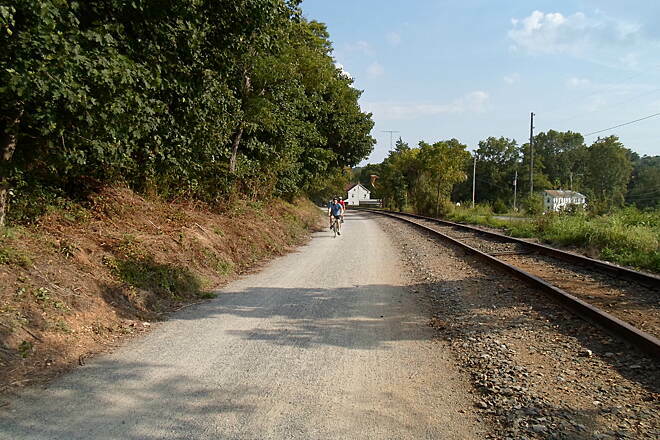 We started at the second lot south of the MD/PA line on the Northern Central Railroad Trail and road to York, PA (about 27 miles). 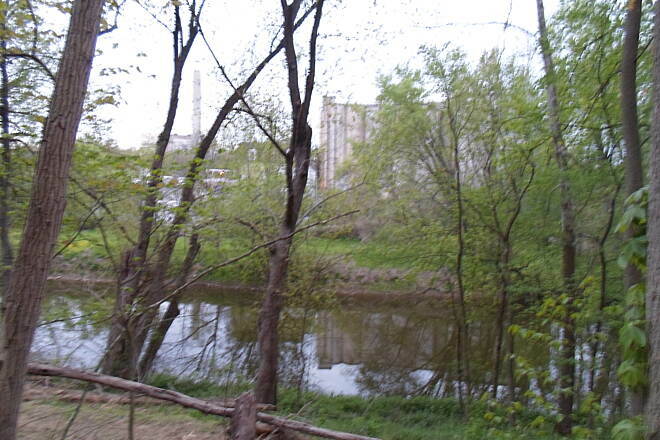 There was plenty of scenery and seclusion. 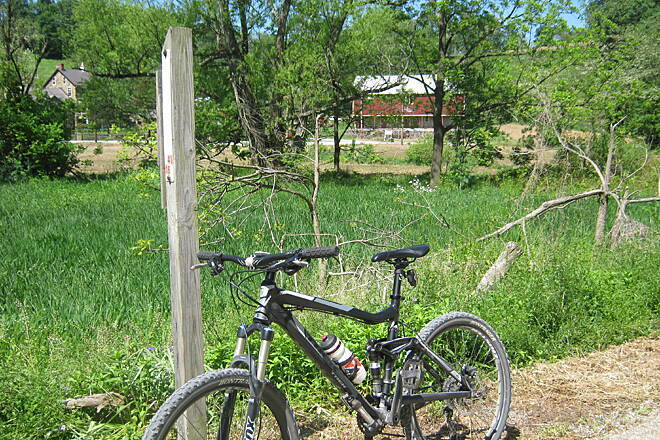 The trail has plenty of access to restaurants, food stores and even a bike shop. 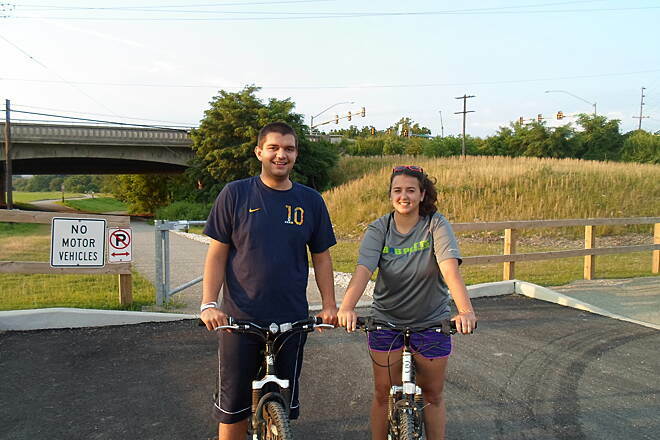 To our surprise, we enjoyed riding all the way to the end of the trail in York. 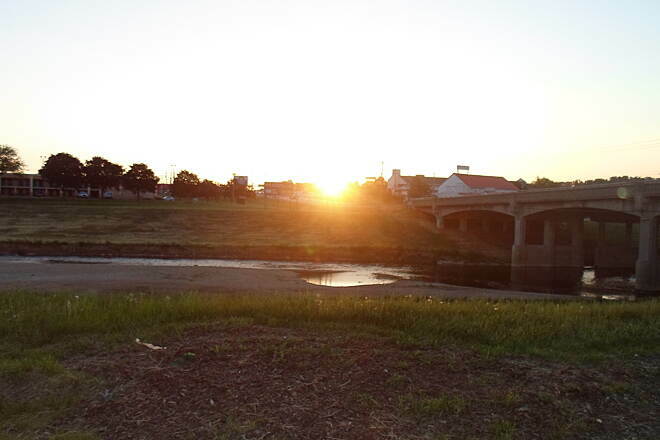 The ride through town was very picturesque. I would ride this again if there weren't many others we want to try. 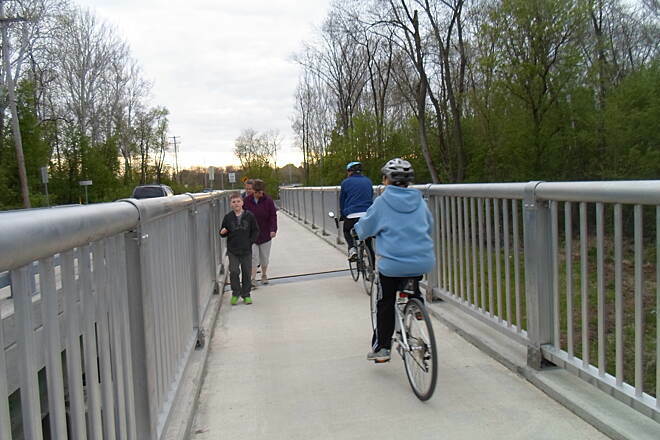 The trail surface and grade are great for beginners." 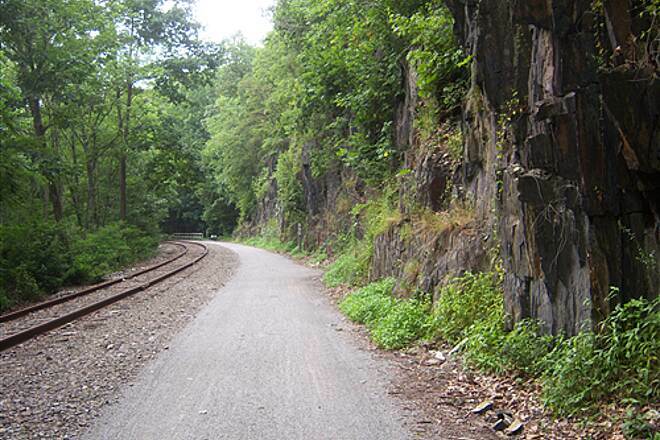 "This is an easy, flat ride (to Railroad, at least) with beautiful scenery. Mountain and hybrid bikes are recommended although we saw all kinds of two-wheelers. Bring your own food as places to buy snacks are not numerous." "We took a family ride from York to Elmer's store & back. 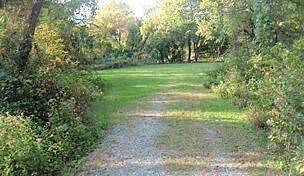 It was lovely, well maintained trail. Next time I would park at the first lot south of York because the first couple of miles going south out of York are urban & not very nice. Don't miss the tunnel. Elmer's is a great place to stop for food & a cool drink. It's right on the trail & mostly populated with other bikers. Can't wait to do the southern end!" "Ian Fortier & friend, Jeremy stopped in today and told of this website. It was nice to see our shop mentioned. 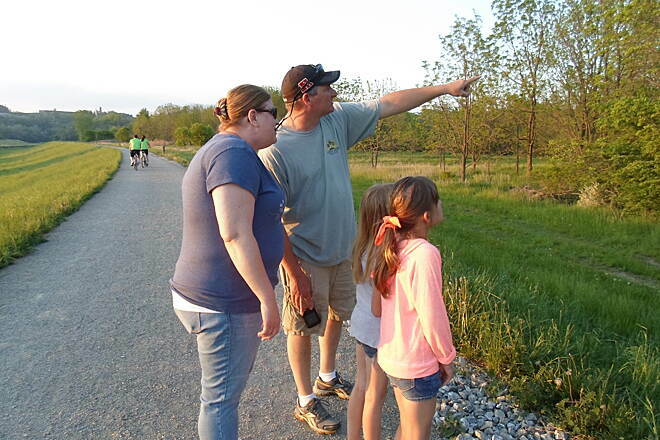 We are happy to answer any questions or help in any way to assist trail users to make it a memorable day. Happy Trails!" Here is a quick tip for this trail. New Freedom is the high point of the trail. From there you can go south for a few miles with very little effort! I have not tried going north of New Freedom yet but was told there is a slight downgrade in that direction too. ENJOY! 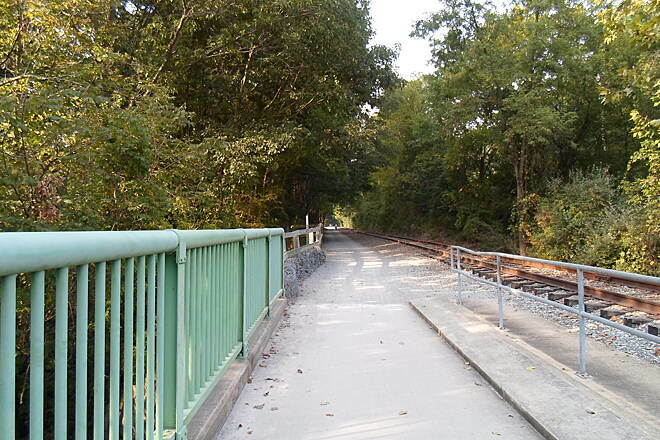 "This trail connects with the North Central Railroad trail mentioned in the Maryland listing. 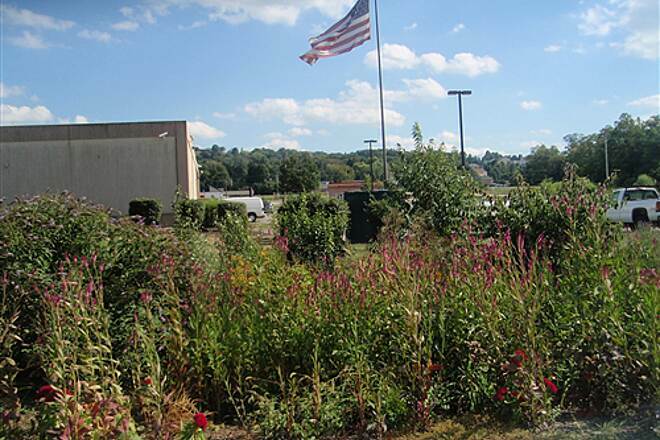 We did that part last year and picked up where we left off at New Freedom, PA. Last year, we had stopped at the Trail Mix restaurant. While it's listed on this page, sadly, the restaurant is being replaces by an Italian one. 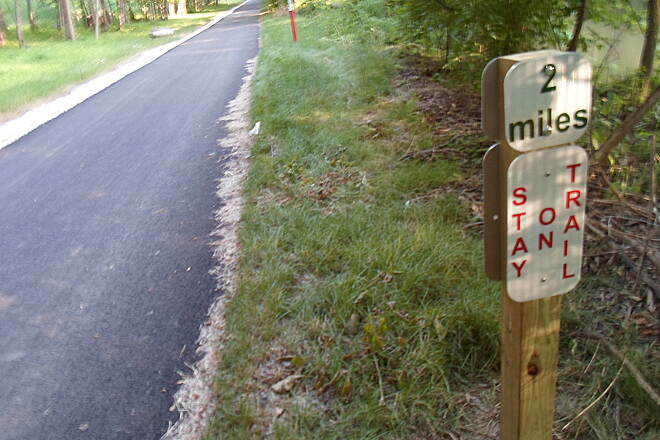 Too bad, because Trail Mix catered to cyclists. 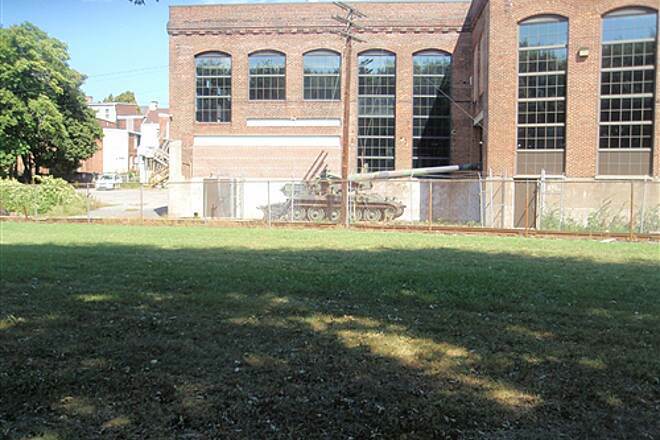 Anyway, New Freedom is 1.5 miles north along the Heritage Trail. 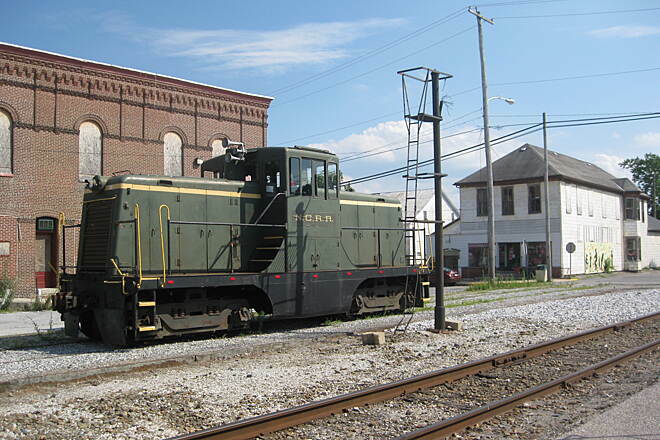 A dinner excursion train is based there and the tracks run all the way to York. 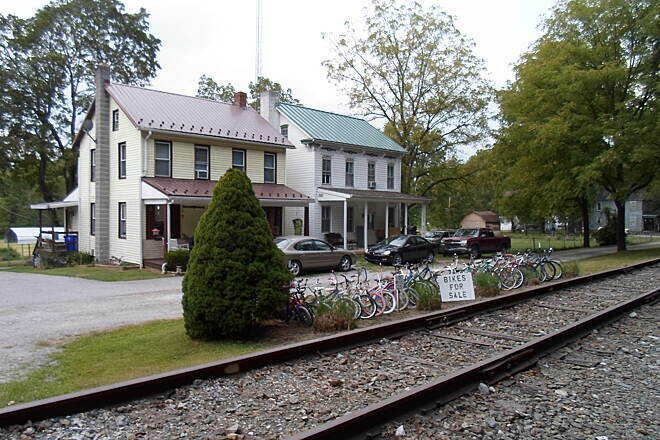 There's a bike shop not too far away from the old train station in New Freedom if you're in need of something before starting out. Also, there's a few places to pick up something to eat along the way. 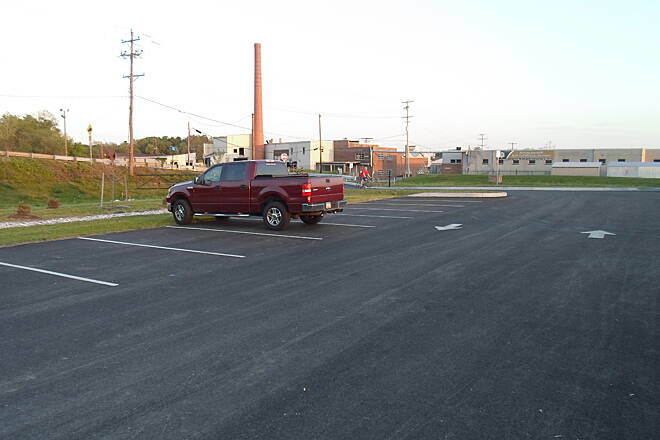 There's adequate parking at the old train station off of Franklin street. 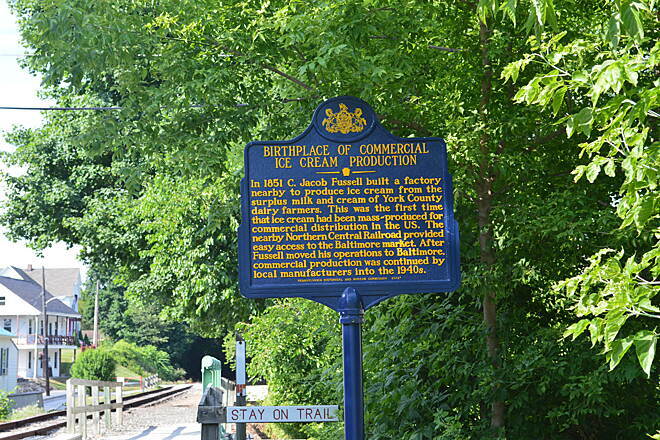 We proceeded north and first came to Railroad, PA. There's a good parking lot here as well if the New Freedom one is full. 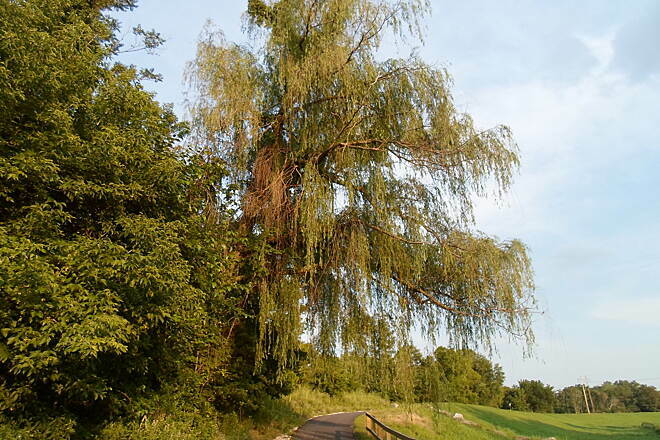 There are adequate restroom facilities along the trail and plenty of places to either rest and pull out a snack or drink that you've brought along. But, there aren't as many places to fill up water, so bring plenty. The trail is 10 feet wide and although it was a bit crowded the day we rode, there's plenty of room to manuever. 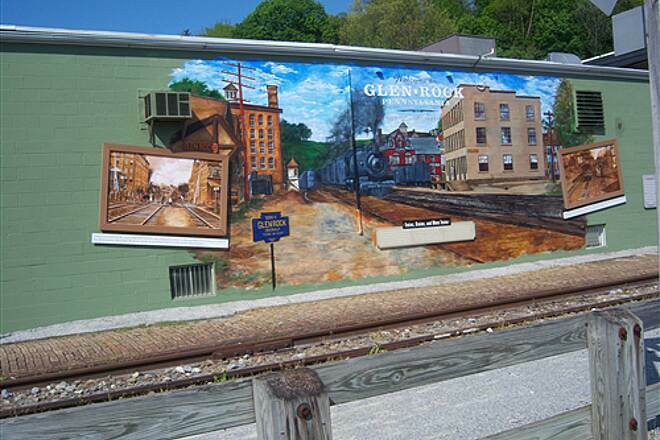 As far as food goes, at Glen Rock, there's Mama's Pizza. 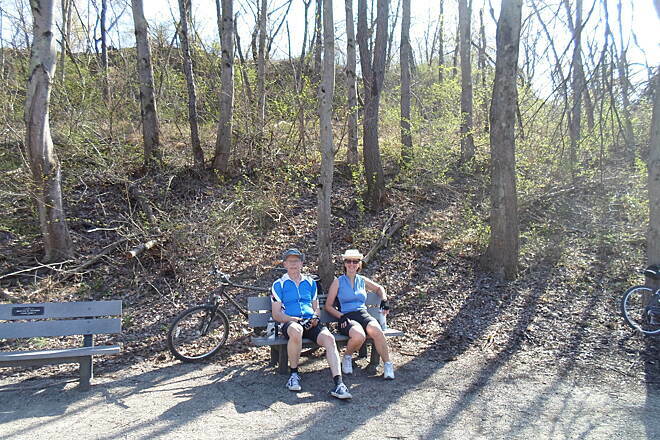 While we didn't stop there, we did see folks who had grabbed some Italian Ice and were taking a rest from the trail. 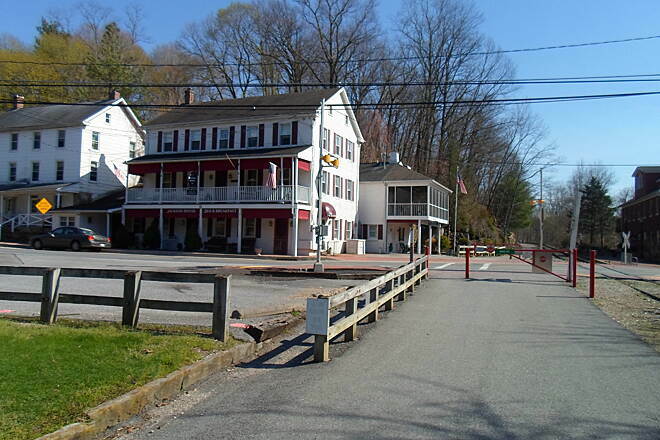 Then at around Mile 12 (Seven Valleys), there's Elmers store. This place was a welcome sight on the way back because it was in the 80s and we definitely needed to cool down. 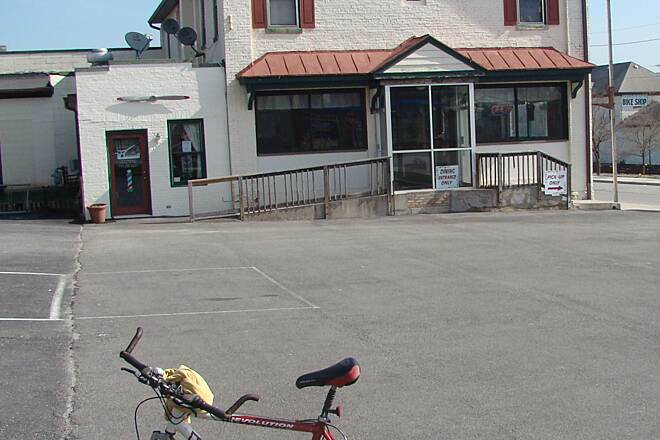 Located right by the trail, Elmers has shaded tables, a portable restroom, and plenty of food/drink. 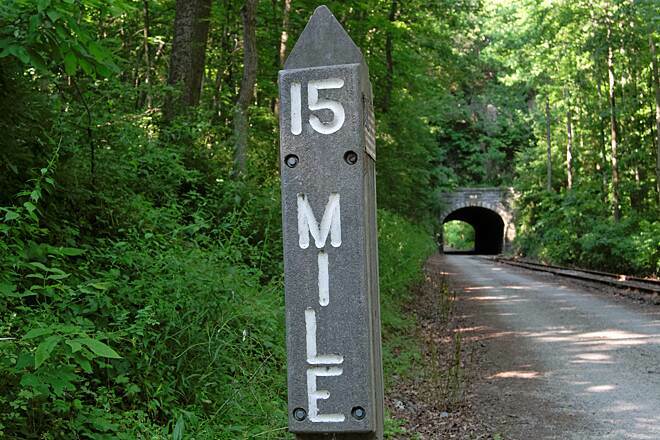 About mile 15, you go through the Howard Tunnel - very cool. 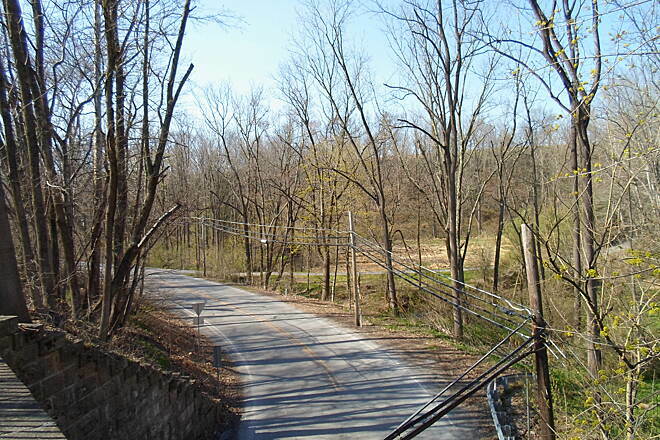 As with much of the trail, it continues though the scenic PA country side. Long straight stretches run through a good portion as well. 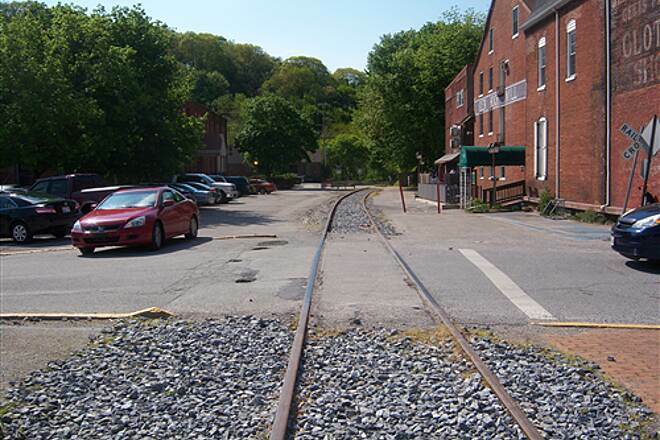 We did have to cross the tracks back and forth fairly often, though. 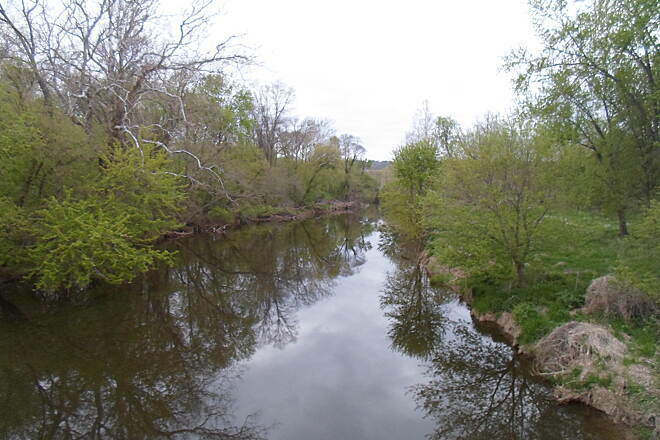 Believe the Codorus Creek follows alongside the trail and makes for some nice scenery as well. 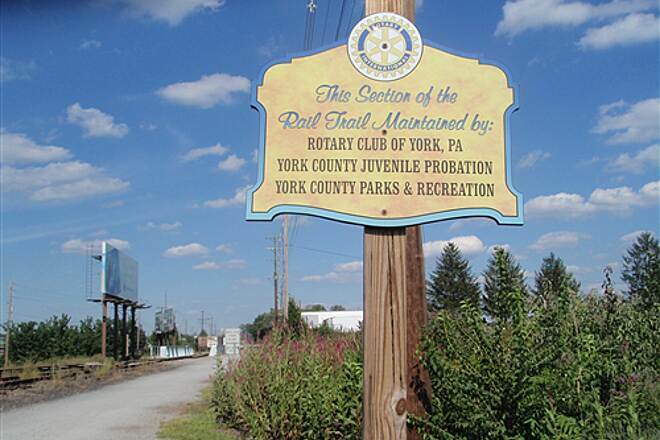 As we got close to the end, the trail becomes paved for the last mile and we entered into an area of arching trees as we came into York, PA. At the end is a decent-sizd parking lot and has a map of York with a list and location of facilities. We were looking for a bike shop called Kickstands which also had food. Unfortunately, it was Sunday and much of the town was closed. But we did find the White Rose Bar and Grill open with good deli sandwiches. 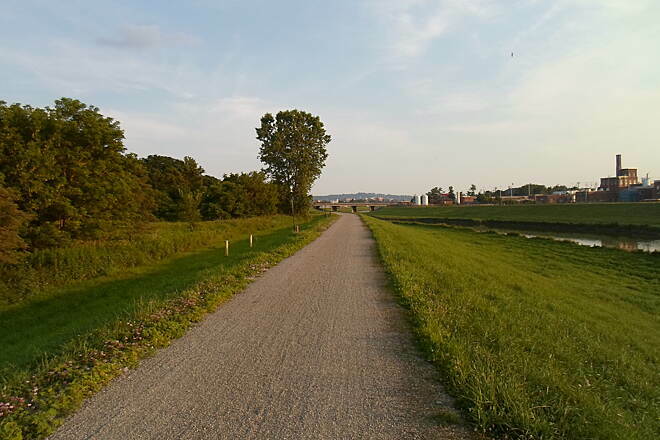 The trail surface is fine gravel and dirt, no rocks and not bumpy. So most any type of bike will do. 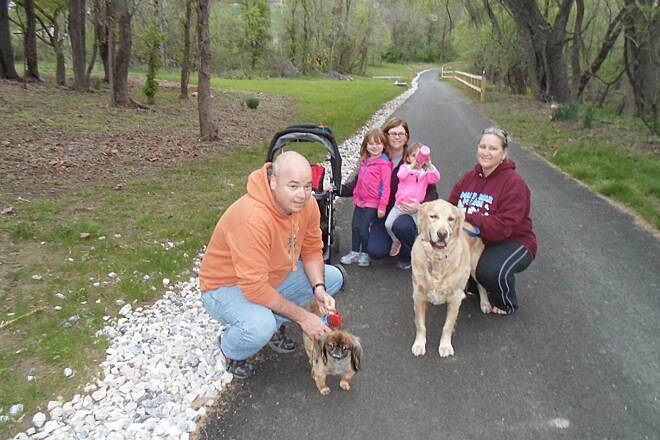 Families will find the trail enjoyable as well. 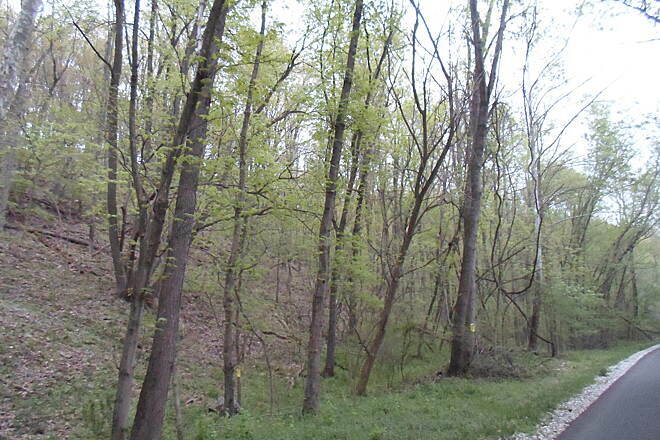 So, overall a nice trail, especially if it's the first one of the year."